Gomado castle (護摩堂城) spreads over hilltop area of Gomado-yama mountain, one of about 250 meter height from hillside at 15 kilometer south from Niigata city central. Gomado mountain is a highest peak of Niitsu Kyuryo hills, which prolongs into Niigata plain about 15 kilometer long from Echigo mountains. 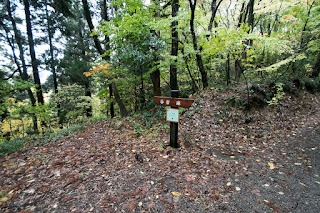 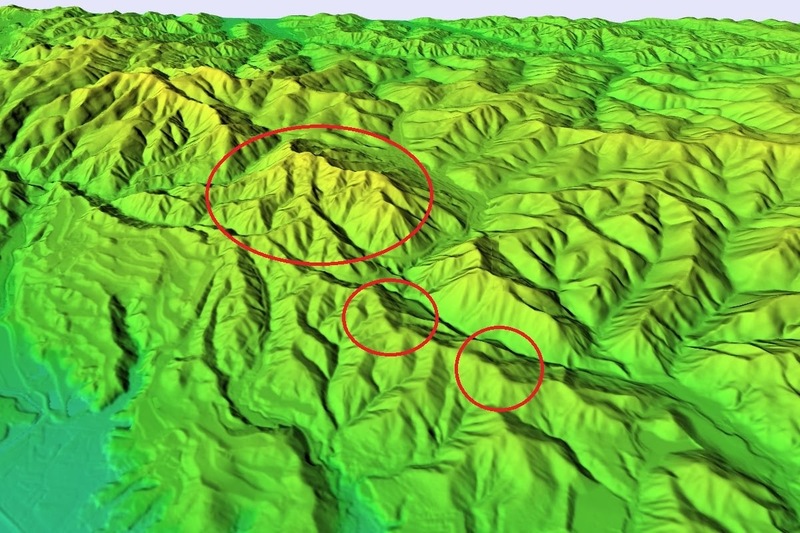 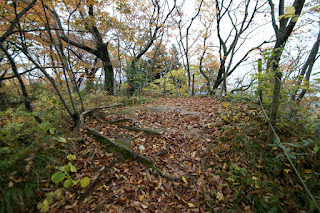 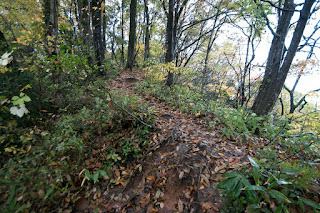 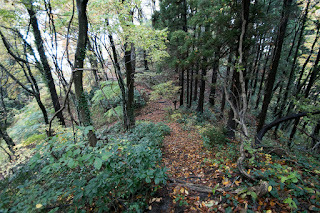 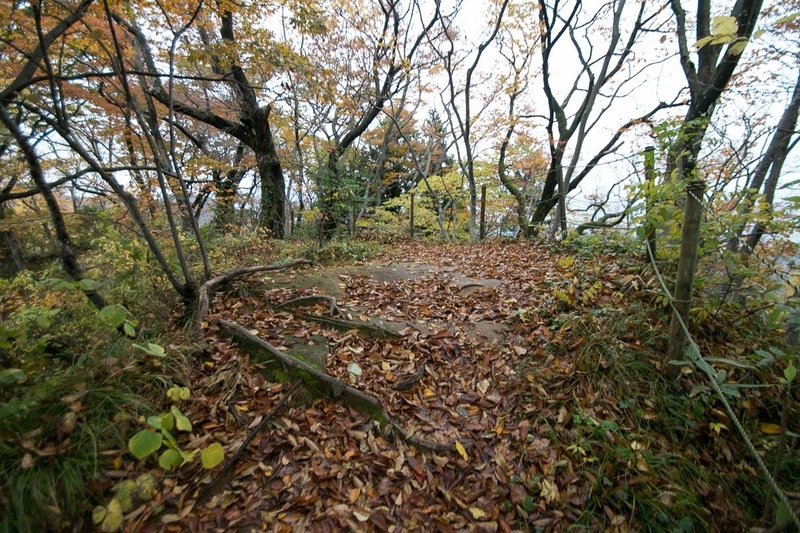 Gomado mountain has a long and gentle ridge toward west and looks like a triangle ruler. 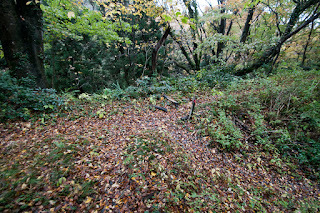 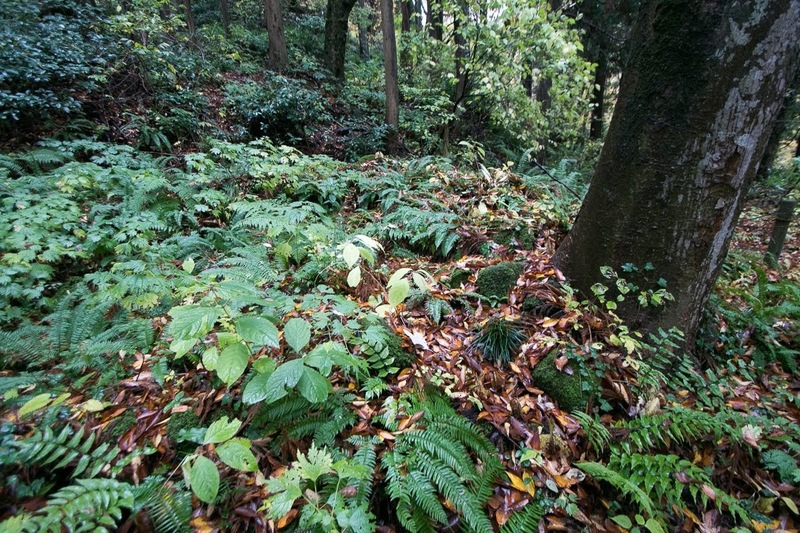 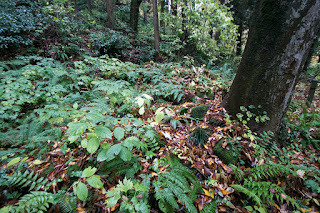 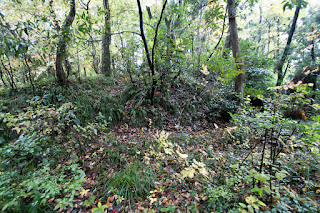 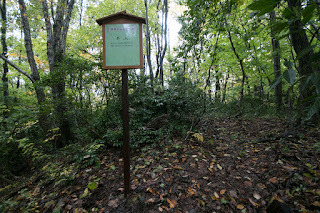 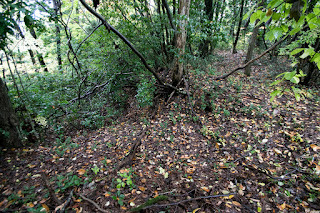 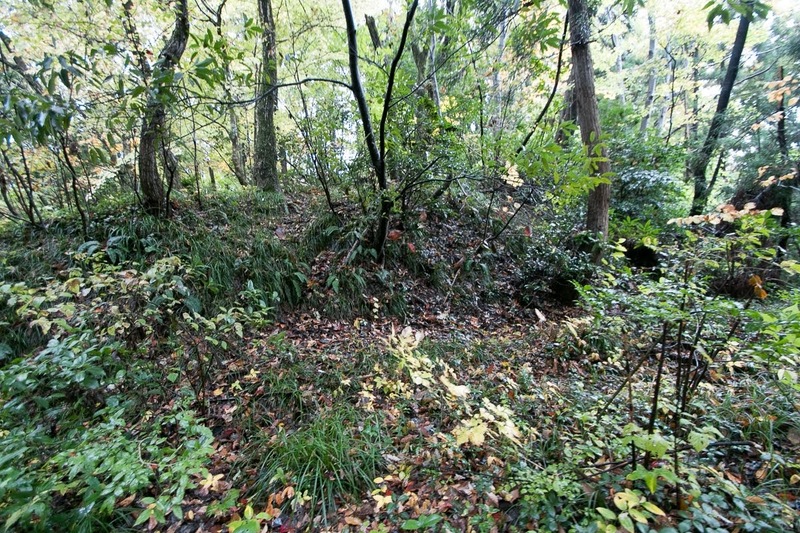 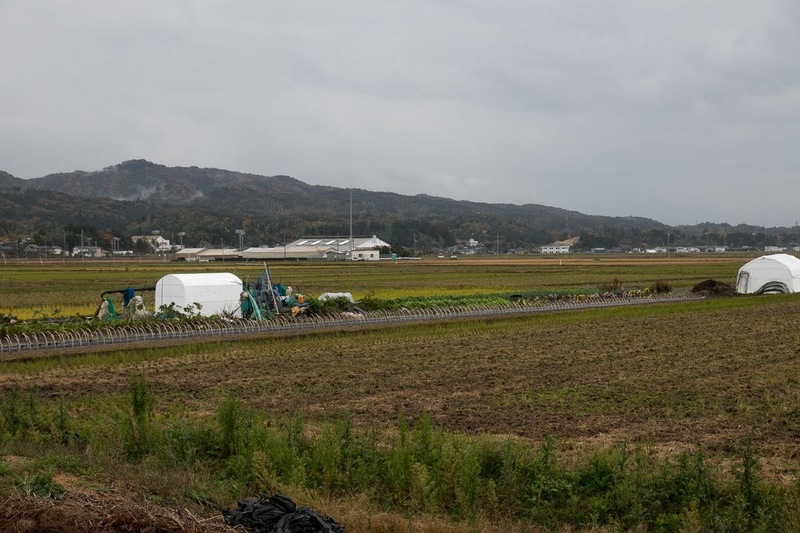 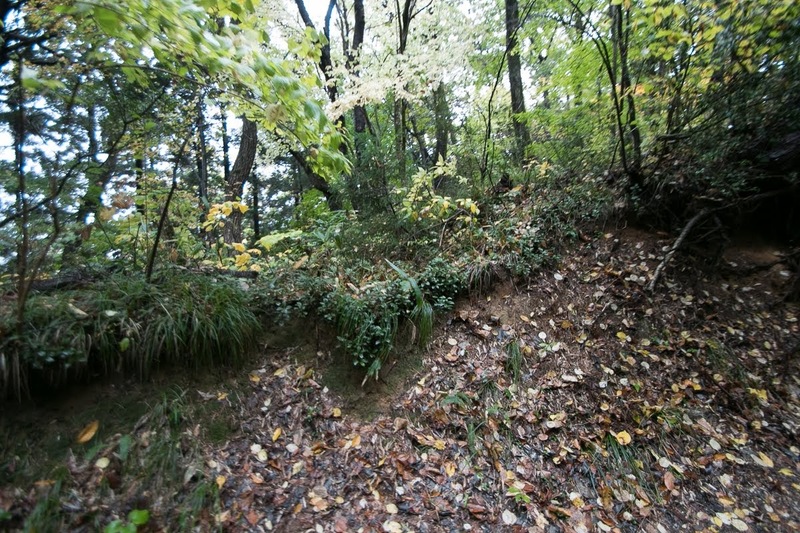 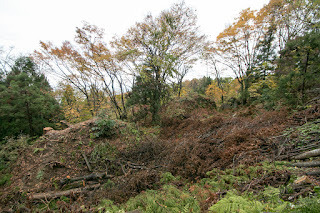 Historically most part of current Niigata plain was marshy ground, and ground area spreads at the both side of Niitsu hills. 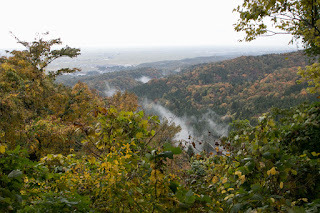 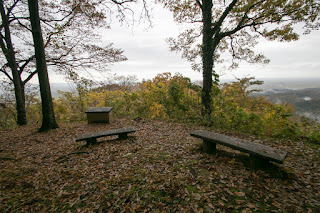 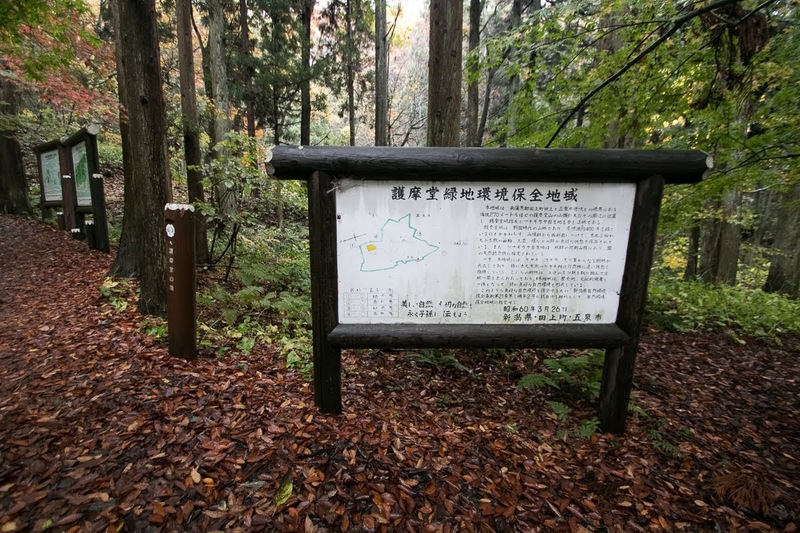 Gomado mountain is an appropriate point to control both road and watch huge Niigata plain, and also manage the entrance from Aizu region along with Agano-gawa river. 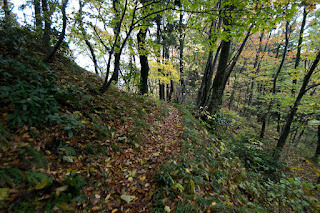 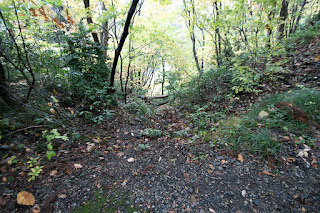 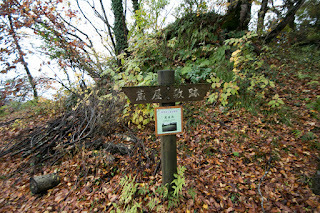 Tactically it is a place of easy defense as the backside of the mountain is separated by deep valley formed by two creek, and only westward is used as approaching road. 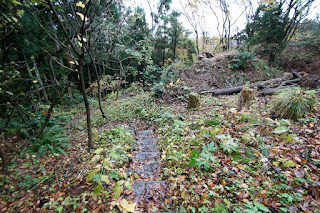 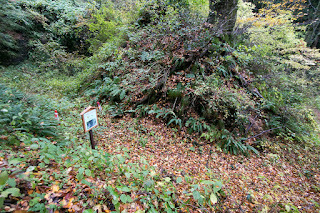 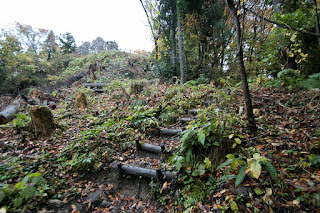 The origin of Gomado castle is not clear but told as being built by local lord Hiraga clan in 14th century. 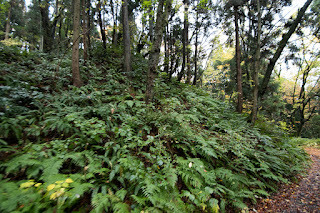 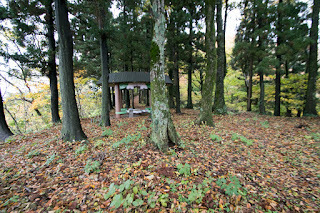 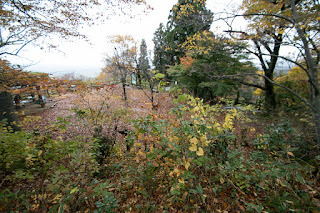 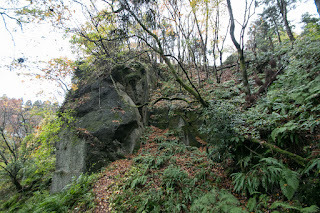 Originally there was an inner hall of a Buddhist temple located at a hillside for Goma ceremony, and the name of Gomado-yama mountain stems from this fact. 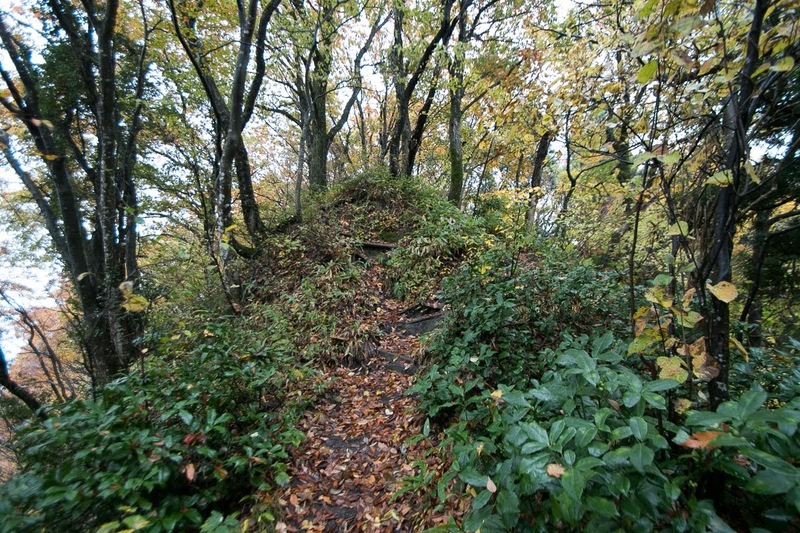 Medieval mountain temples were frequently used as base of mountain castles, because of good scenery and already built terraces. 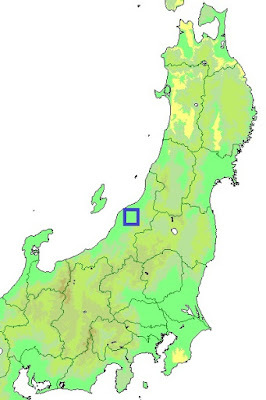 After the fall of Kamakura Shogunate, as a result of conflict between the South Court and Muromachi Shogunate, Echigo province (Niigata prefecture) was governed by Uesugi clan which was an important retainer of Shogunate at Kanto region. 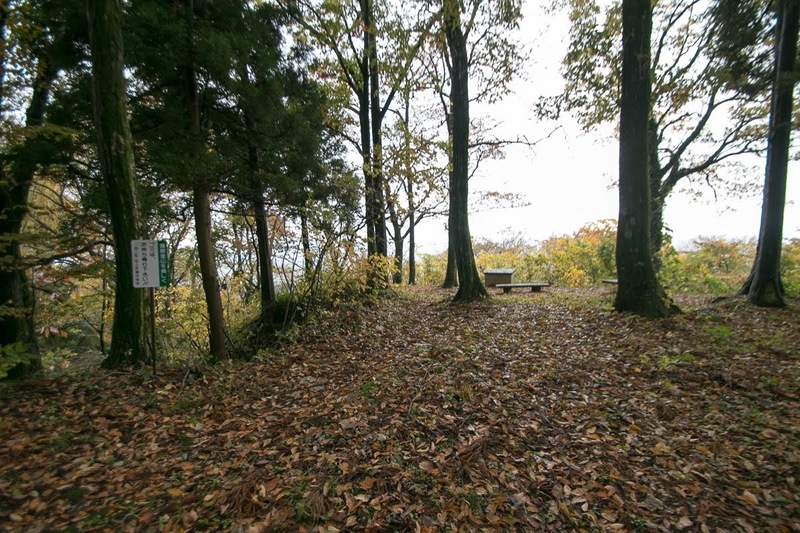 Also Nagao clan which was originally a retainer of Nagao clan became deputy governor of the province and became the lord of Niigata plain. 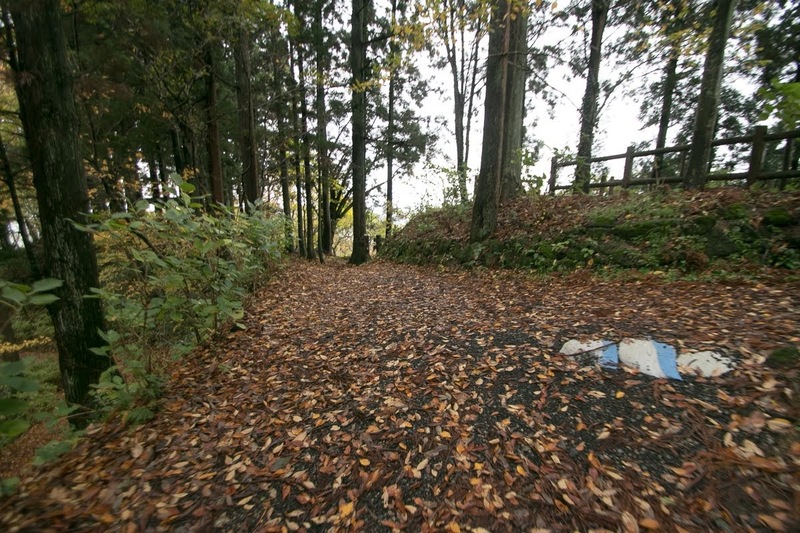 However, since the beginning of 15th century, Nagao clan which moved to current Joetsu area grew their power then became opponent to the governor Uesugi clan. 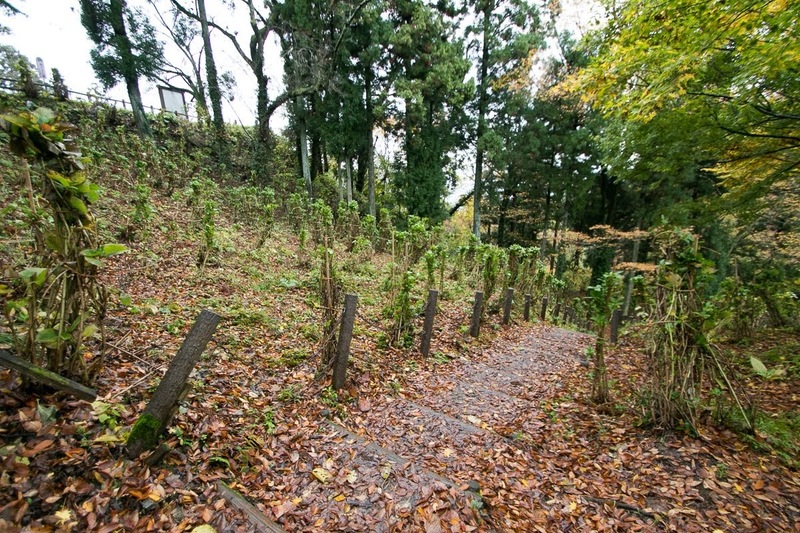 In 1426, large conflict between both power named as “Oei no Tairan” occurred, and Nakajo clan which was a major local lord and supported Uesugi clan entered Gomado castle to attack Yamayoshi clan belonged to Nagao clan. At this time Nakajo clan once overwhelmed Yamayoshi clan but failed to ruin it, thus after the cease of conflict Gomado castle became the territory of Yamayoshi clan. 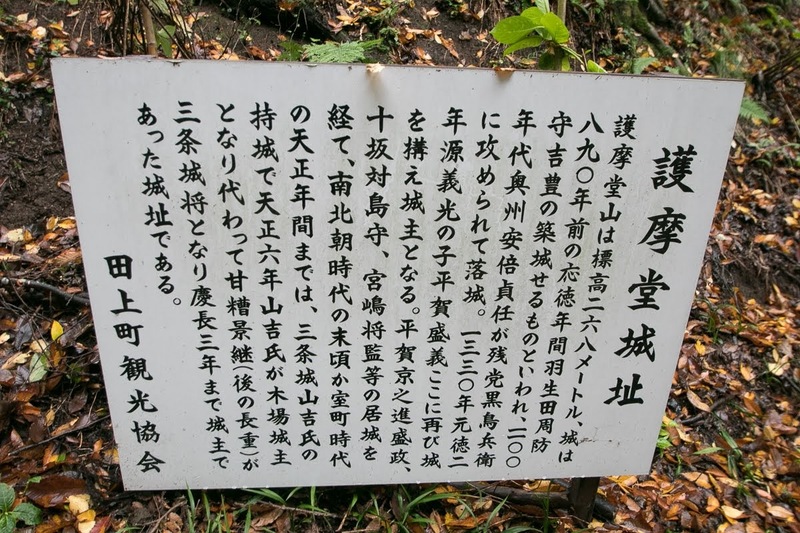 Uesugi clan and Nagao clan kept conflict intermittently over 100 years after that, and Yamayoshi clan kept support for Nagao clan. 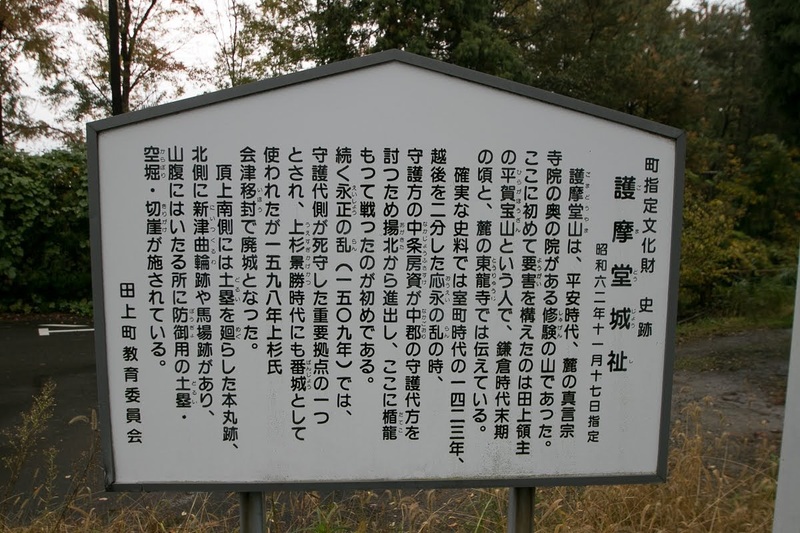 In 1548, Kagetora Nagao (1530-1578, later Kenshin Uesugi) became the lord of Echigo province replacing his elder brother Harukage Nagao (1509-1553) under the coordination of Uesugi clan. 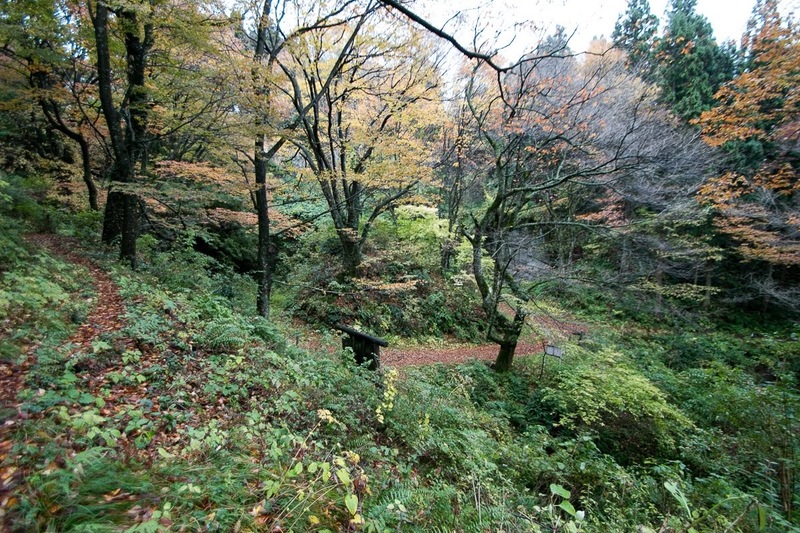 Yamayoshi clan supported this change with Nakajo clan, and became an important retainer of Kenshin. 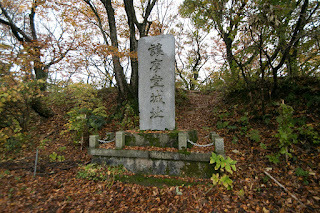 Toyomori Yamayoshi (1525-1575), the leader of Yamayoshi clan, had the largest army among Uesugi clan and activated at military action and diplomacy. 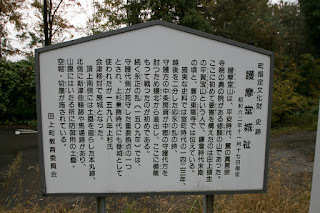 After the death of Toyomori Yamayoshi, Kenshin appointed Kagetsugu Amakasu (1550-1611) as a commander of Gomado castle. 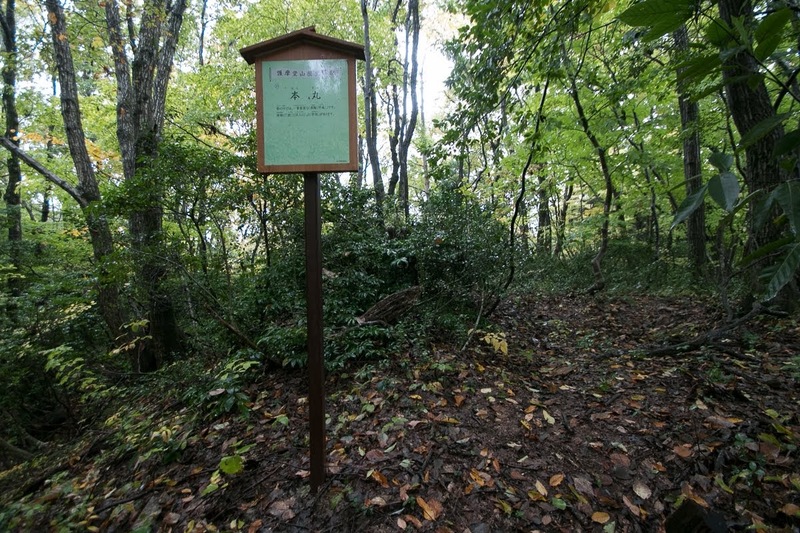 Kagetsugu was originally a retainer of Kagekatsu Uesugi (1556-1623), an adopted son of Kenshin and leader of Ueda Nagao clan. 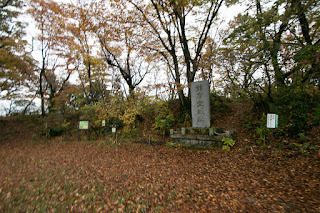 Kanetsugu Naoe (1560-1620) who later became the chancellor of Uesugi clan was same situation but Kagetsugu Amakasu was picked up earlier than Kanetsugu. Gomado castle spreads over the peak and three ridges of Gomado-yama mountain. 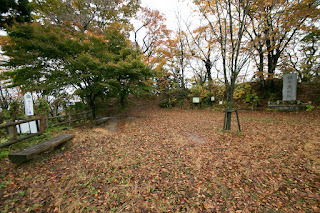 Central area of the castle is a pentagon shaped flat one of about 40 meter long, which has a large clay wall used as a basement of main building at backside. 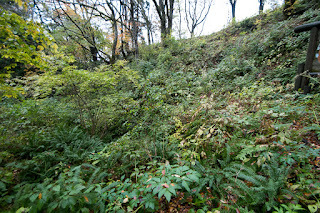 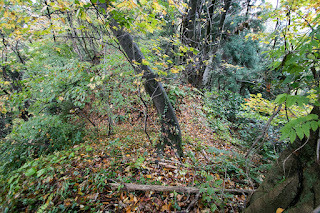 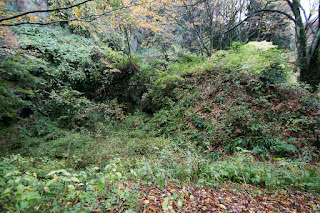 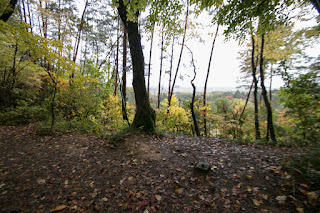 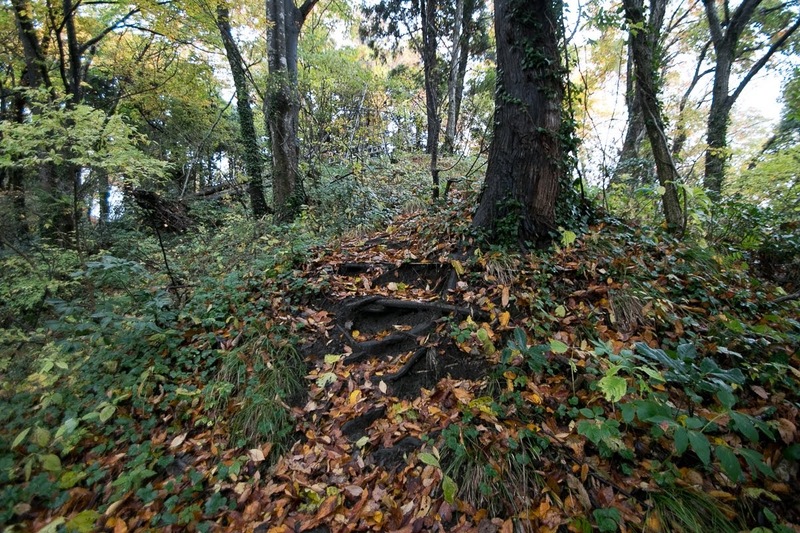 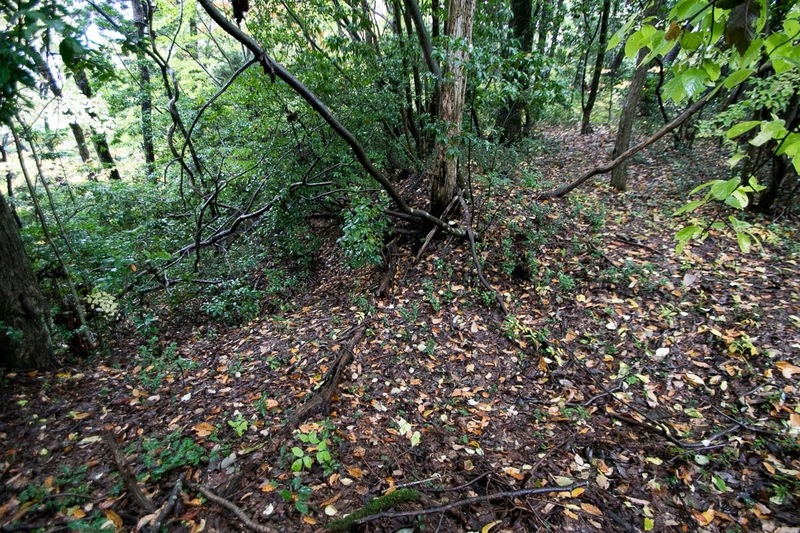 Below of central area, an entrance to the core part of the castle from central ridge, there remains a small stone wall hiding inside of the castle. 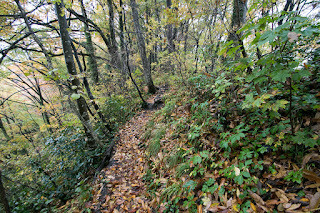 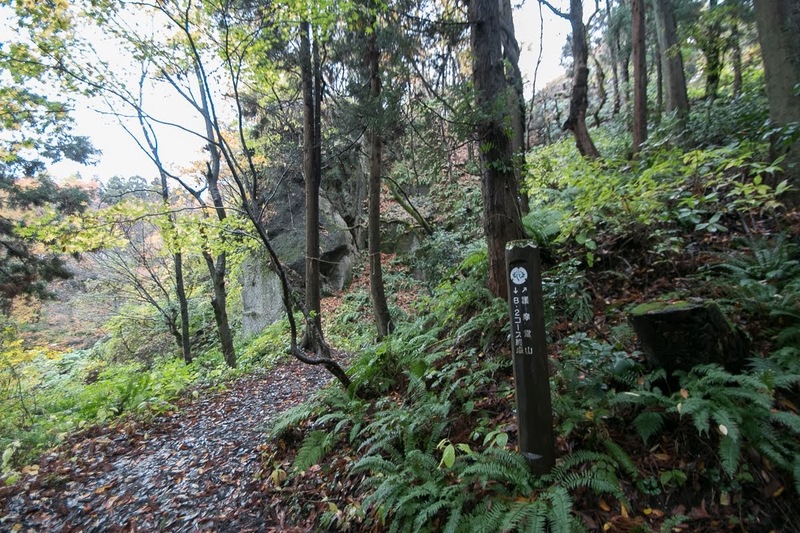 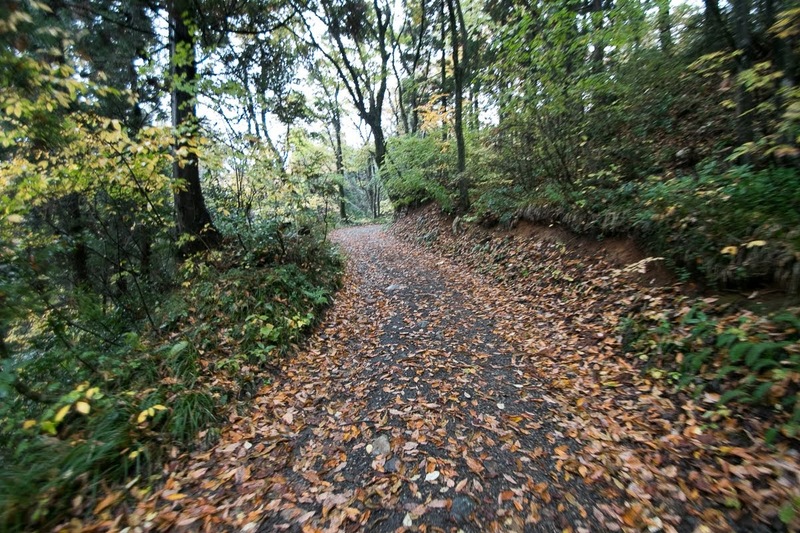 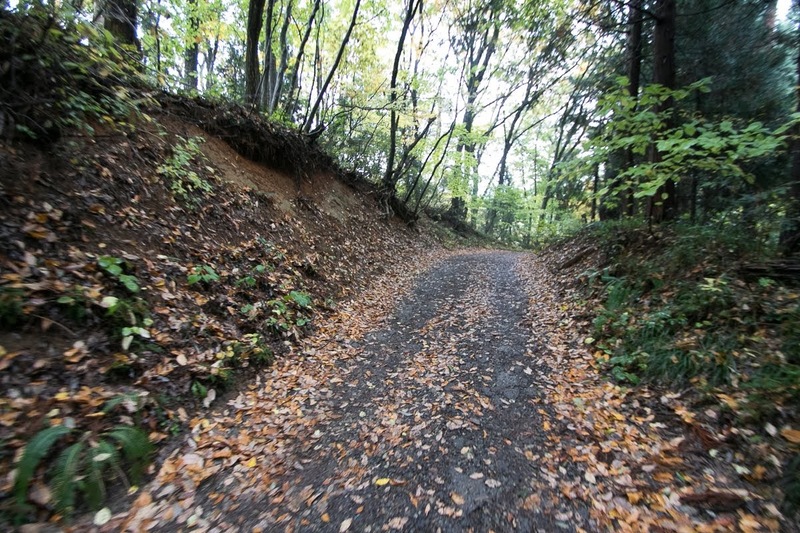 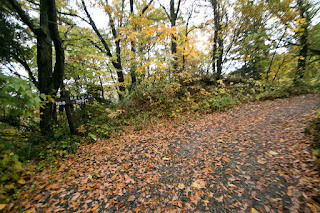 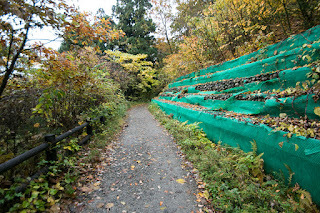 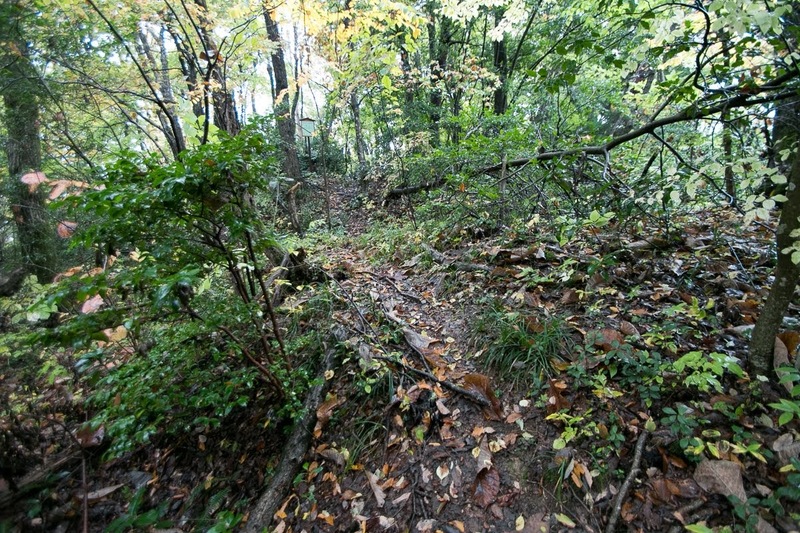 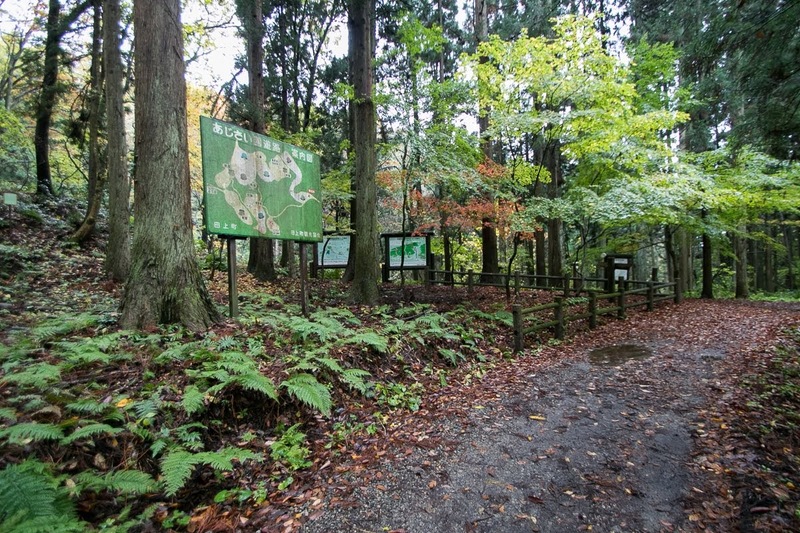 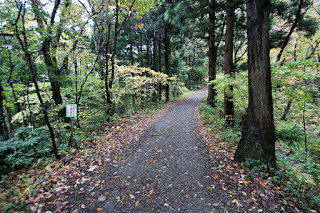 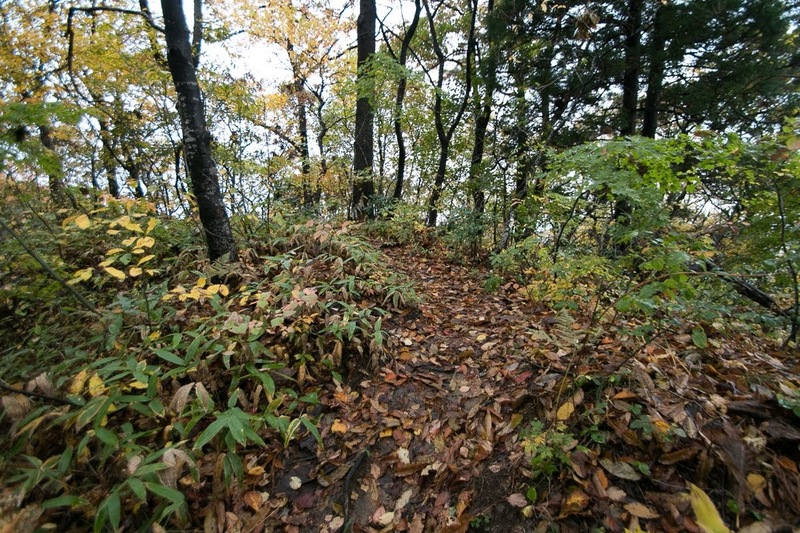 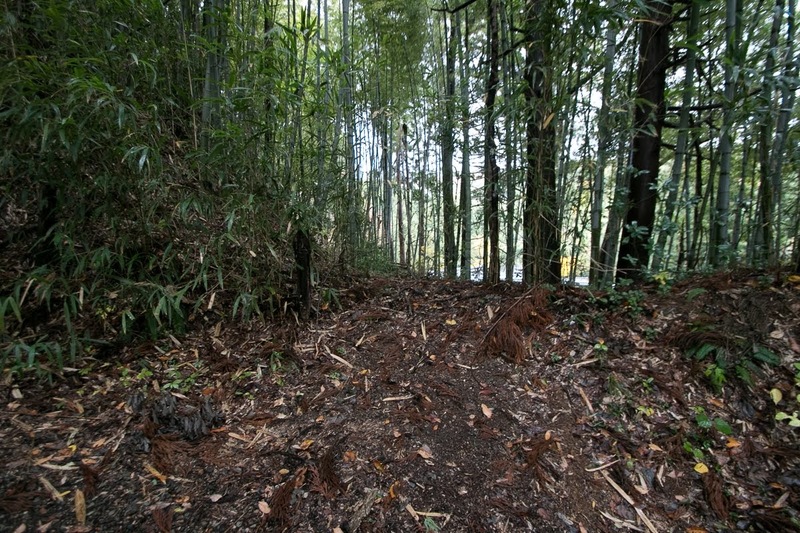 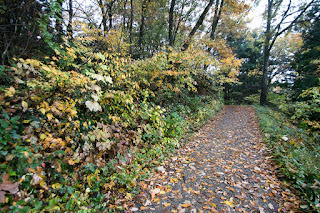 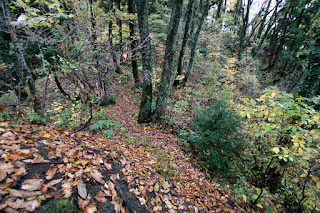 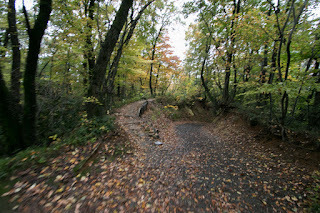 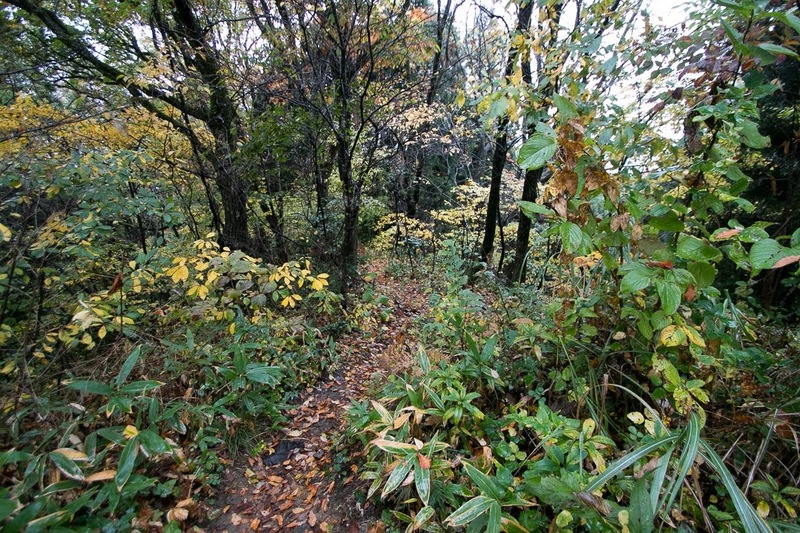 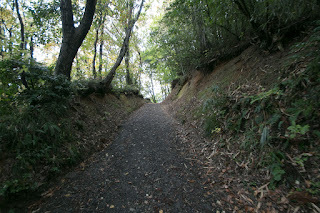 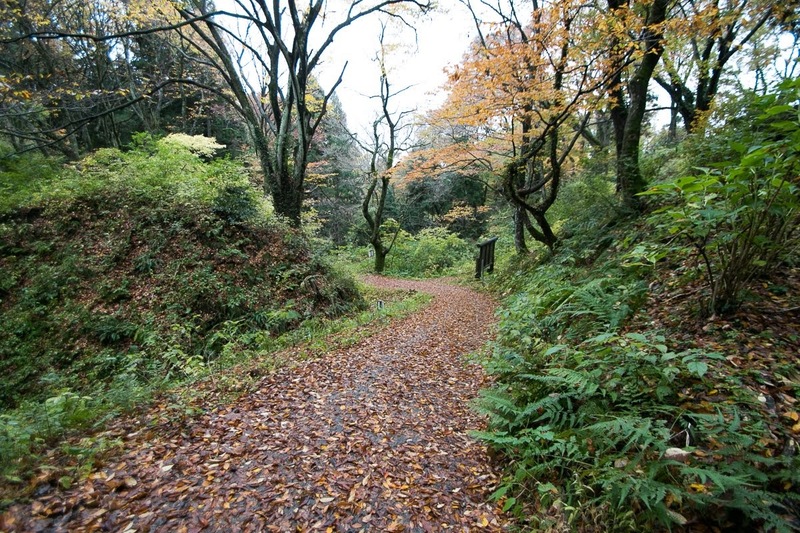 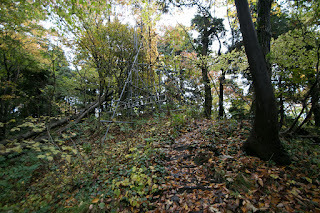 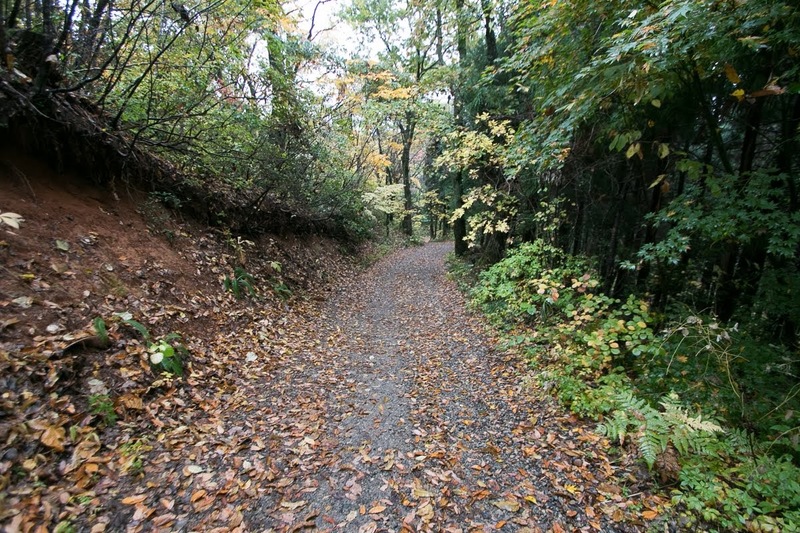 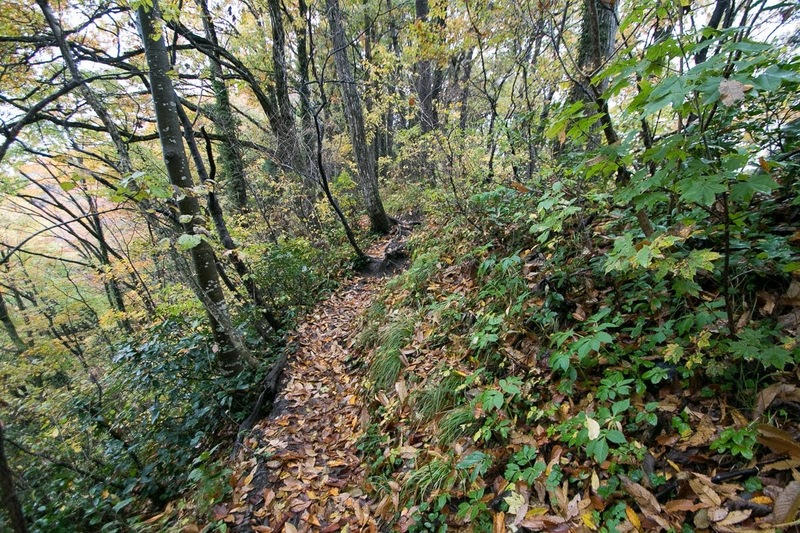 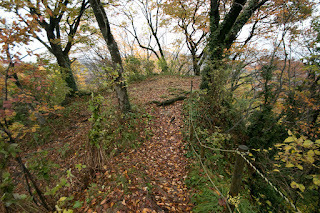 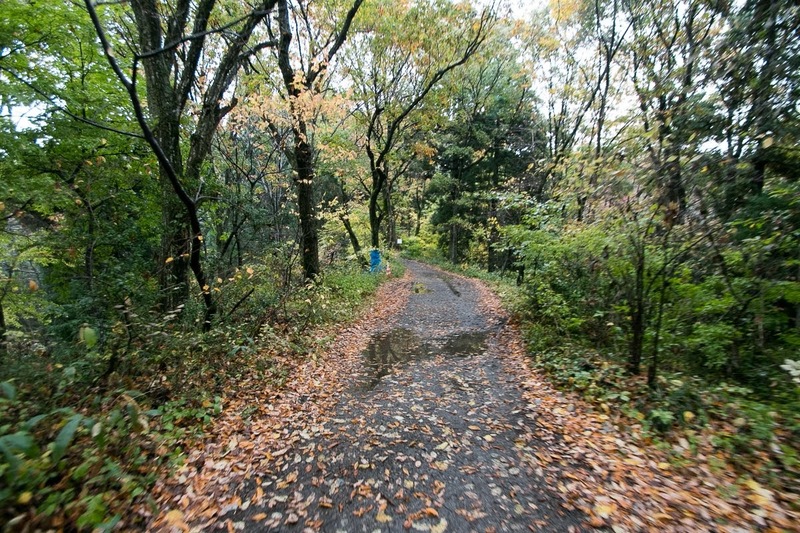 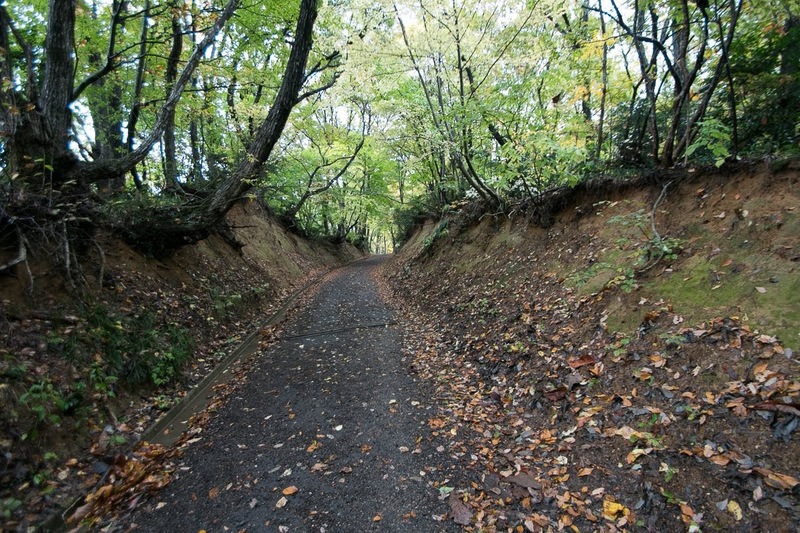 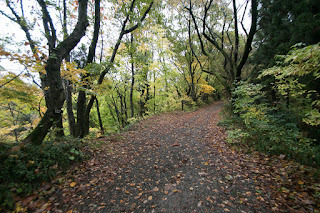 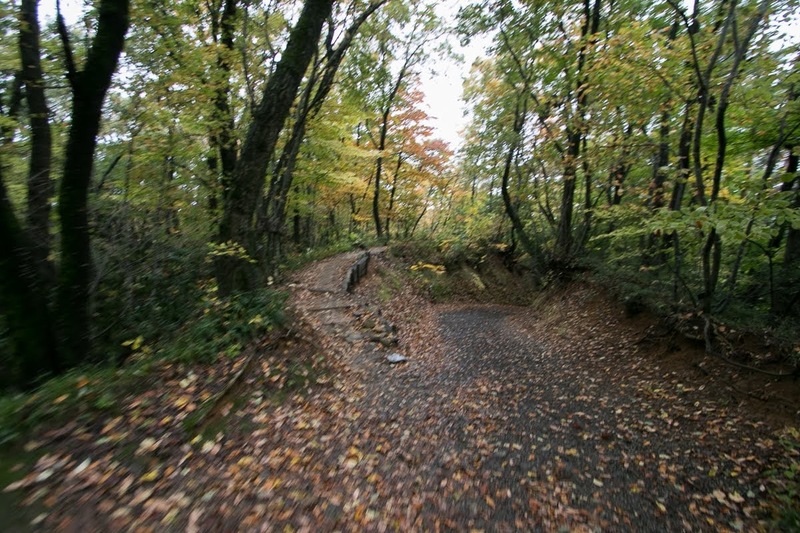 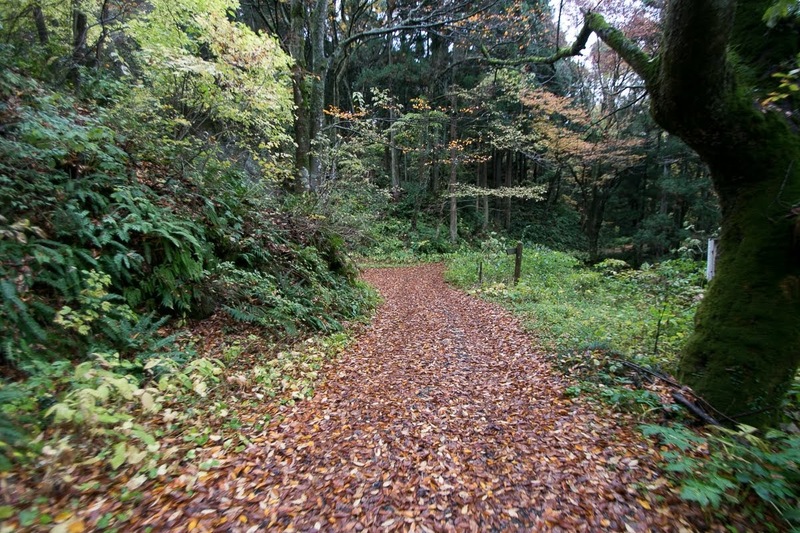 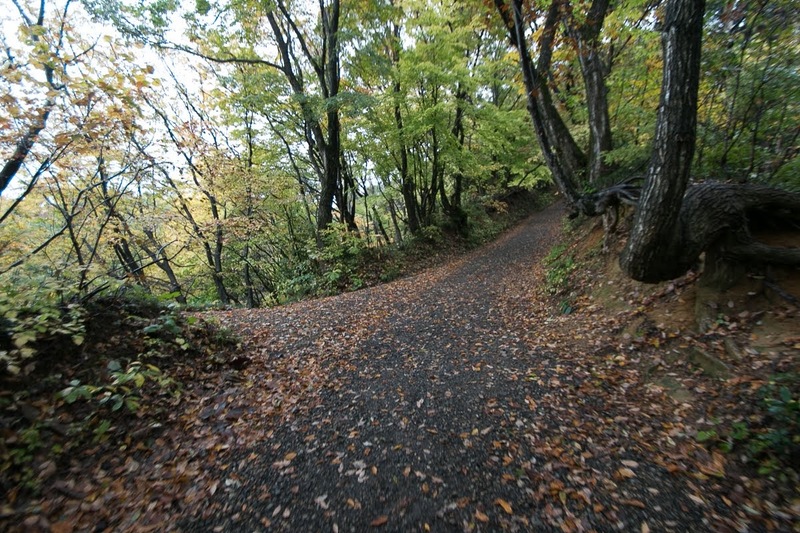 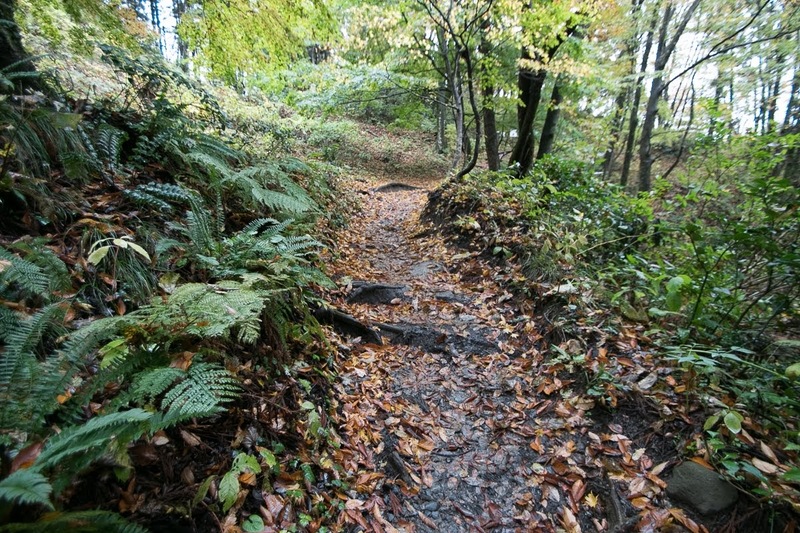 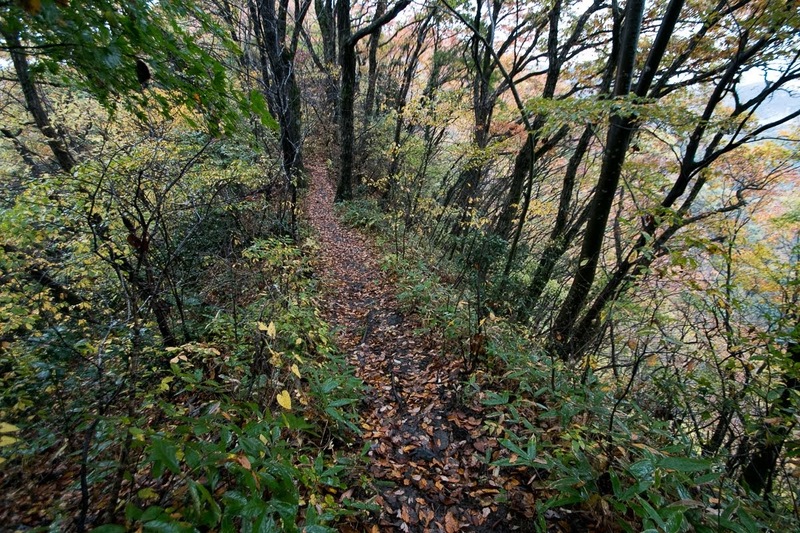 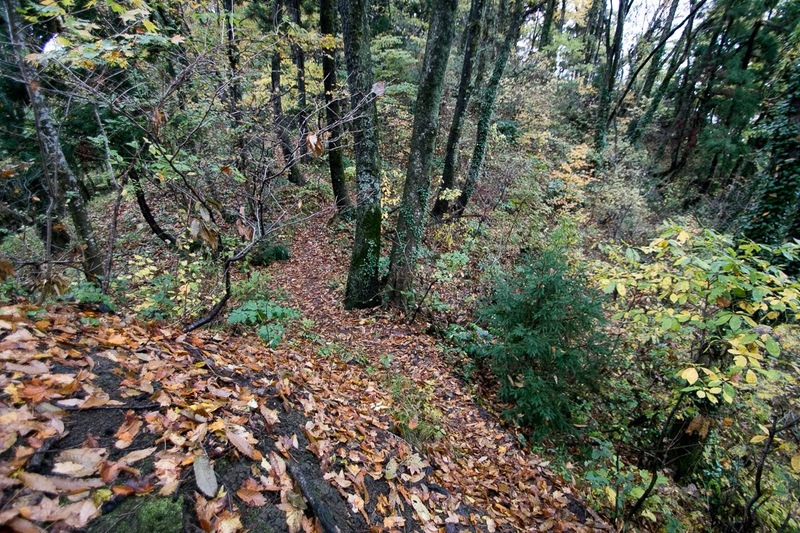 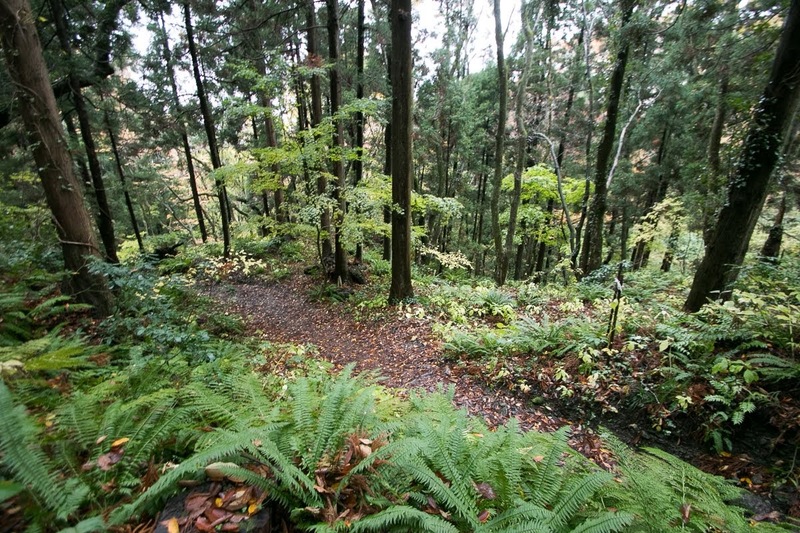 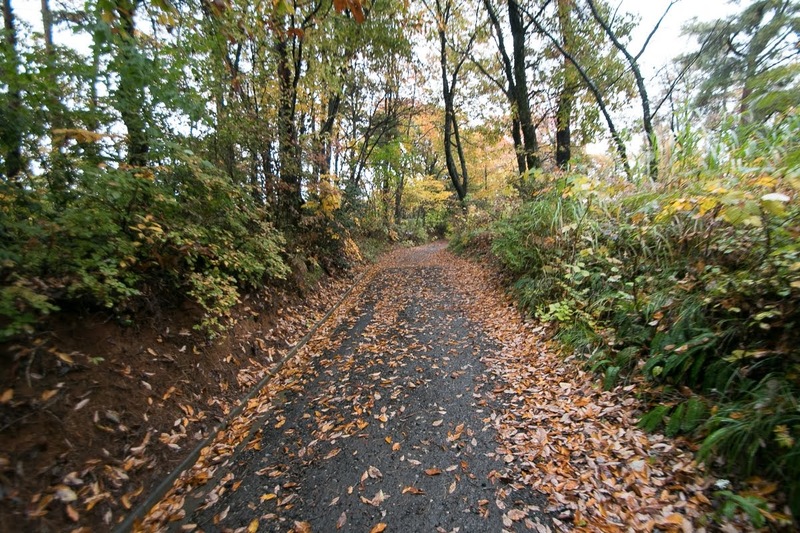 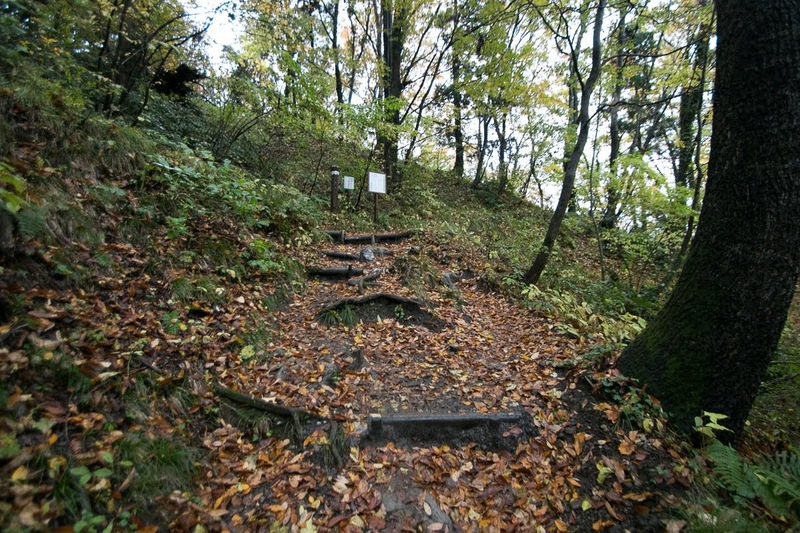 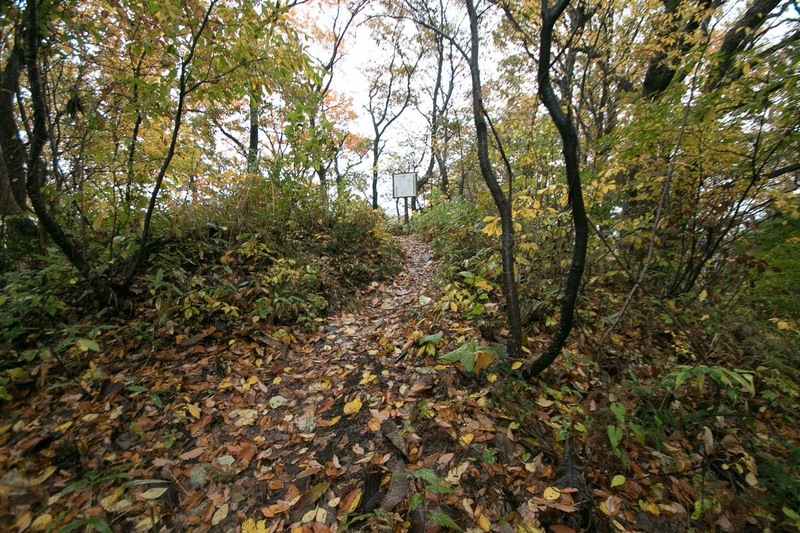 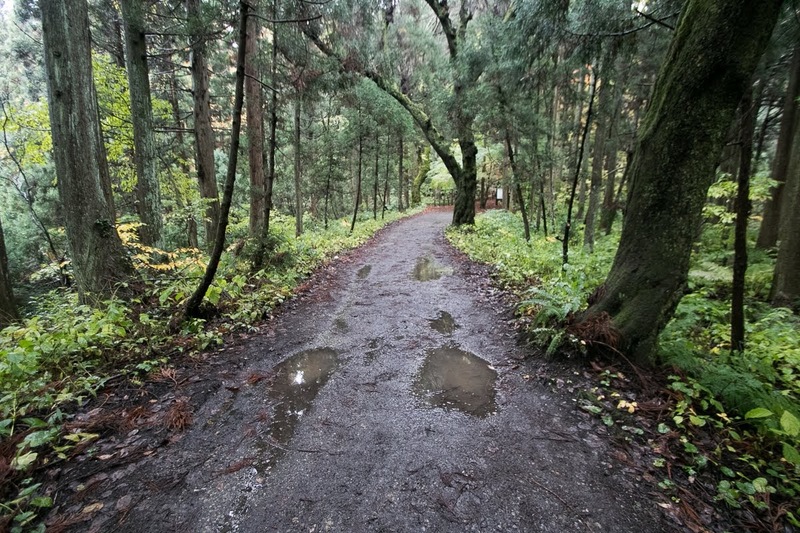 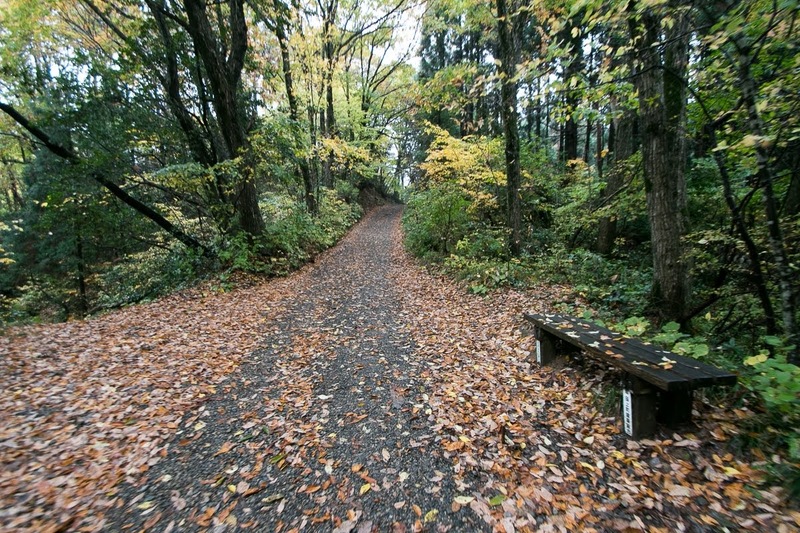 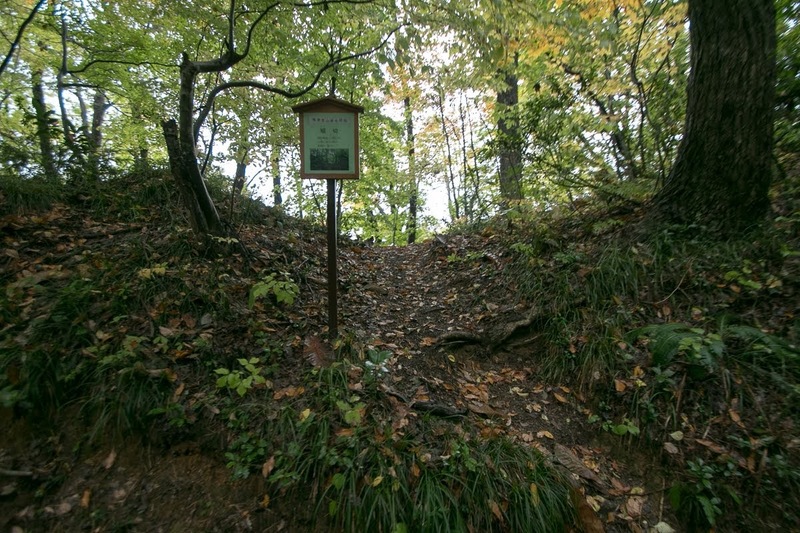 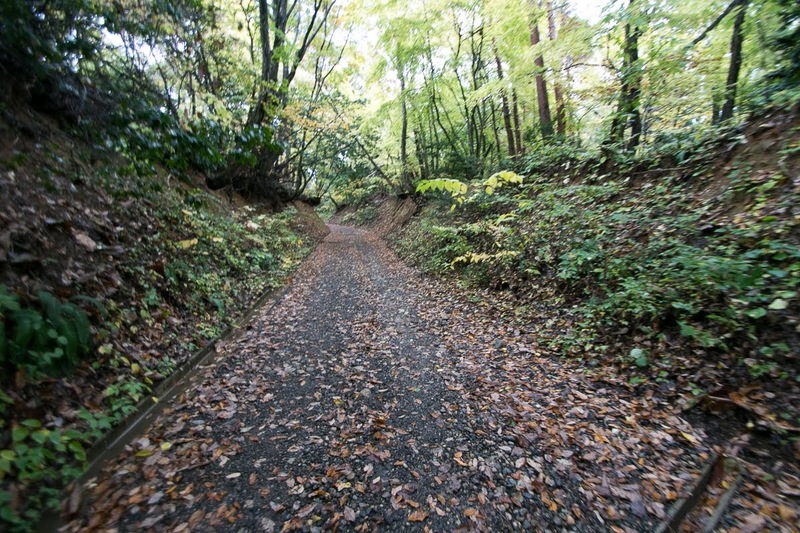 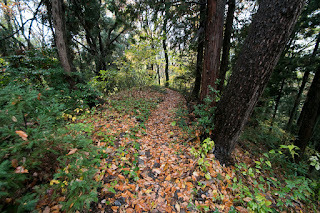 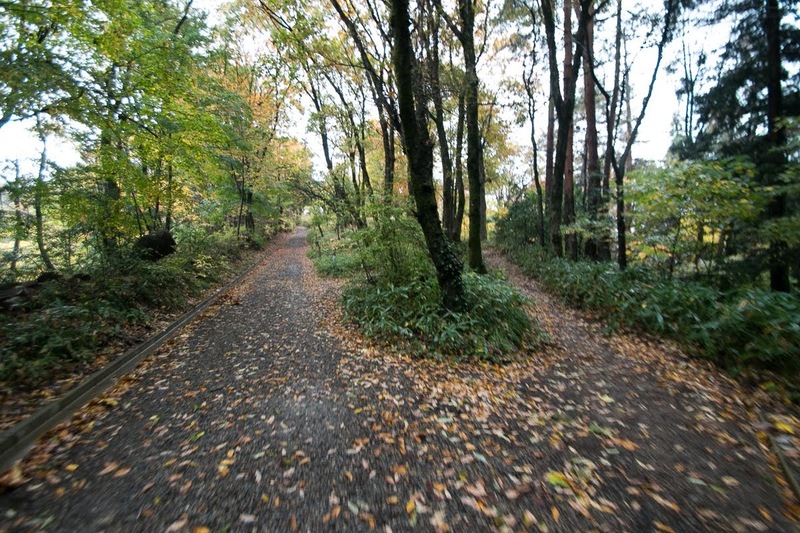 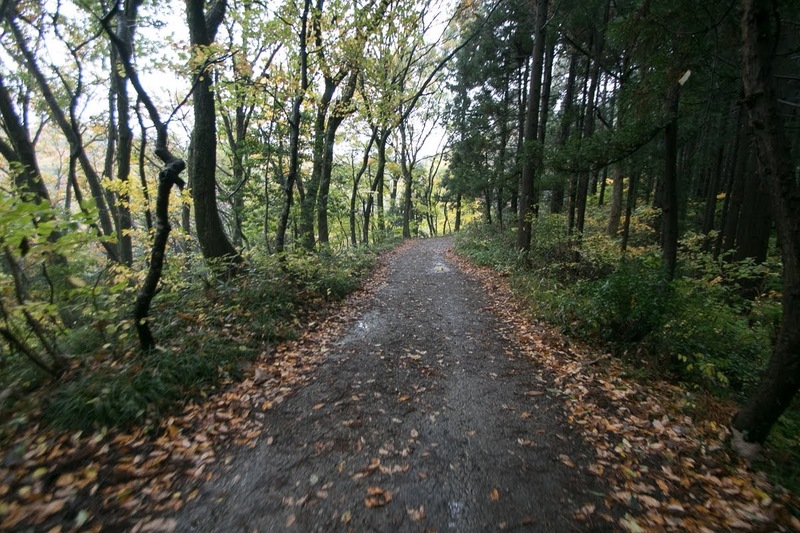 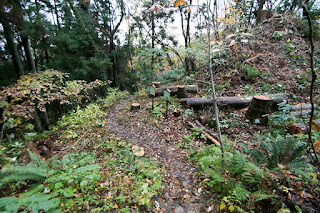 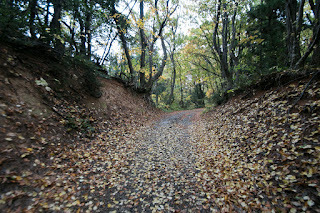 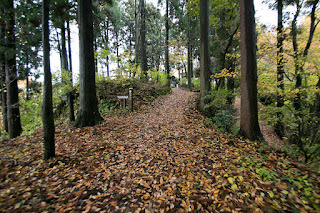 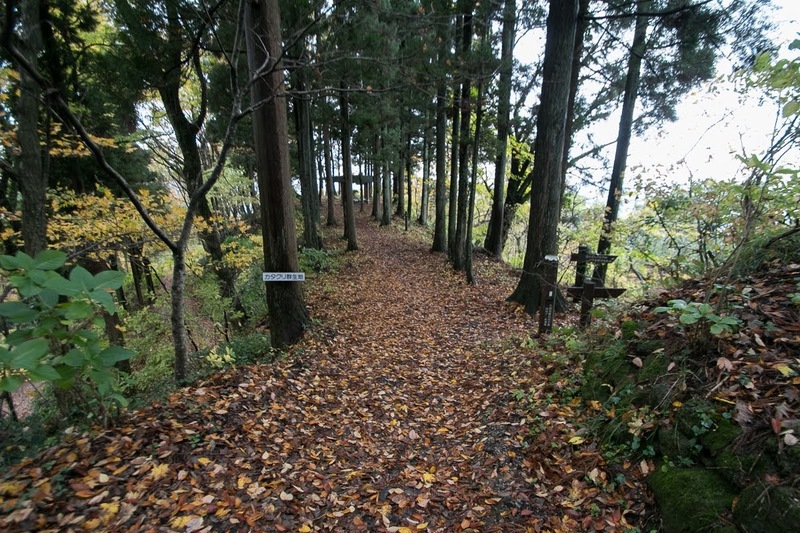 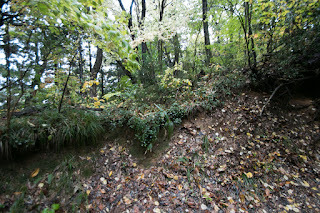 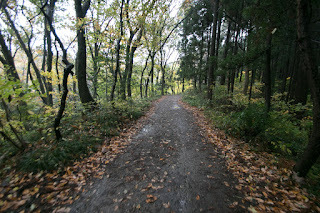 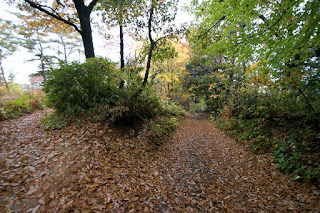 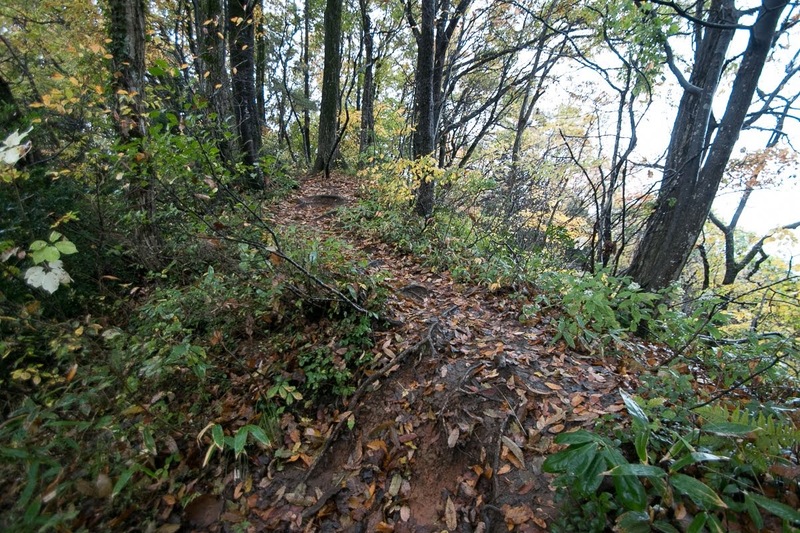 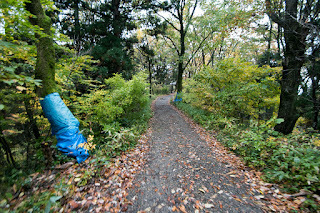 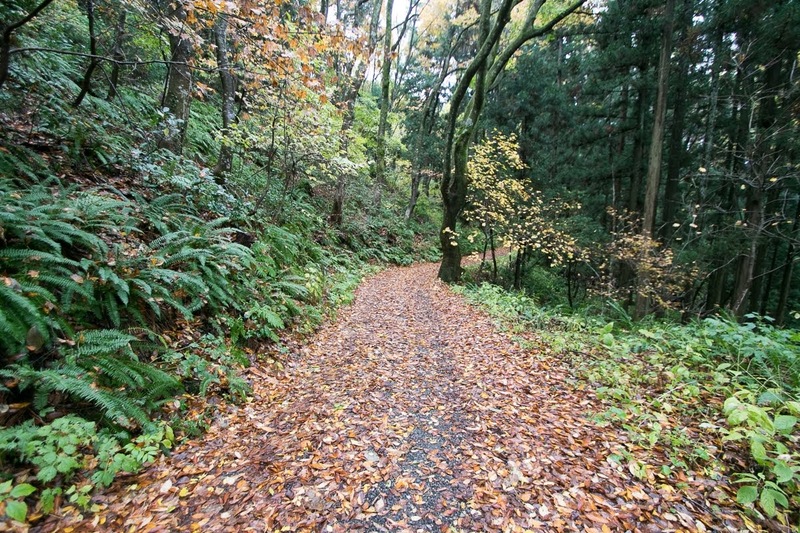 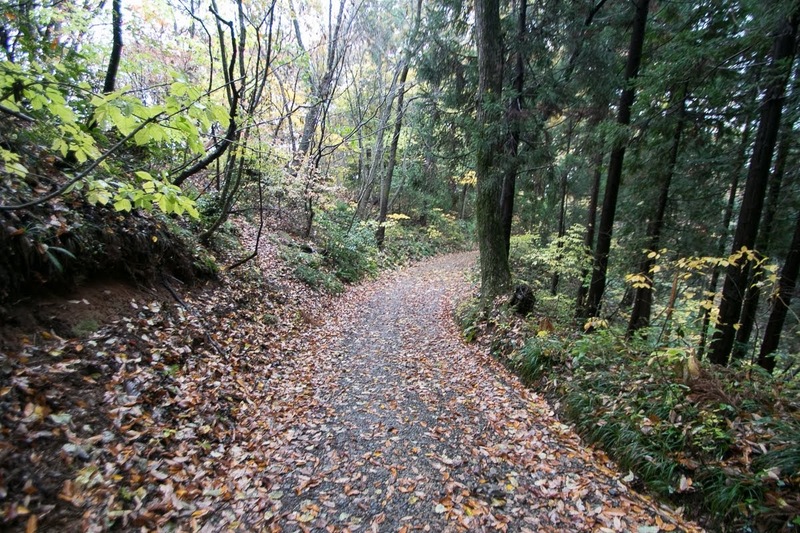 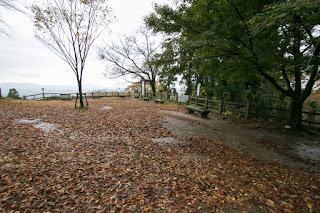 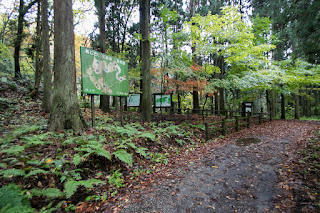 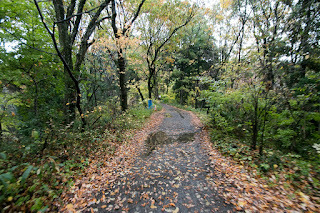 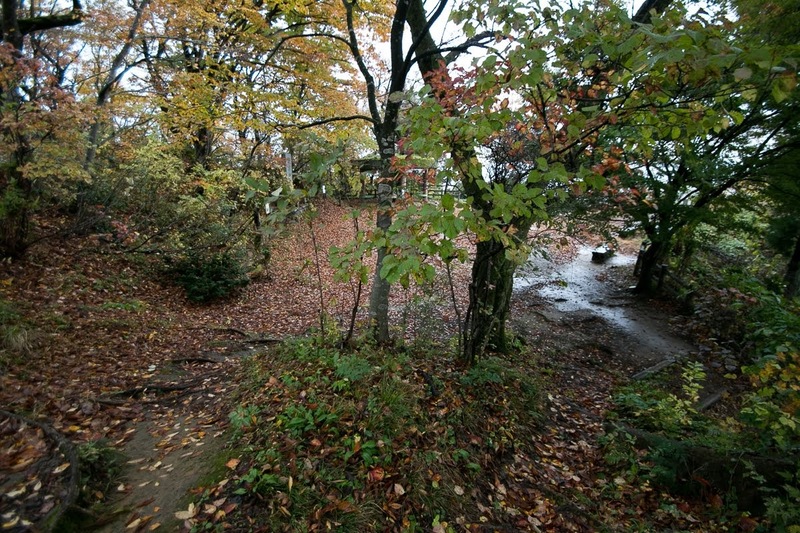 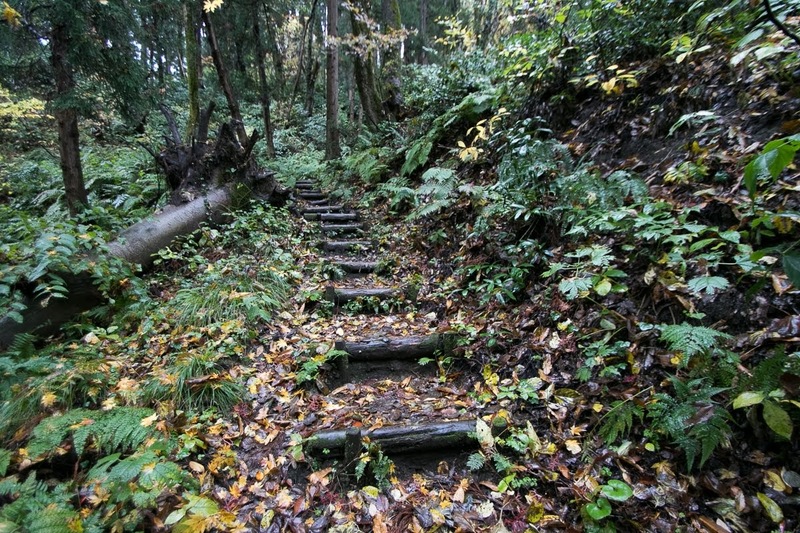 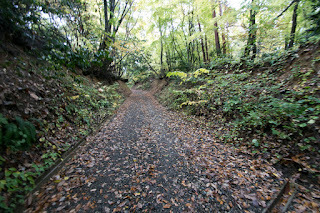 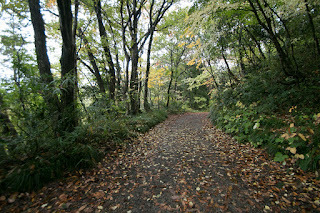 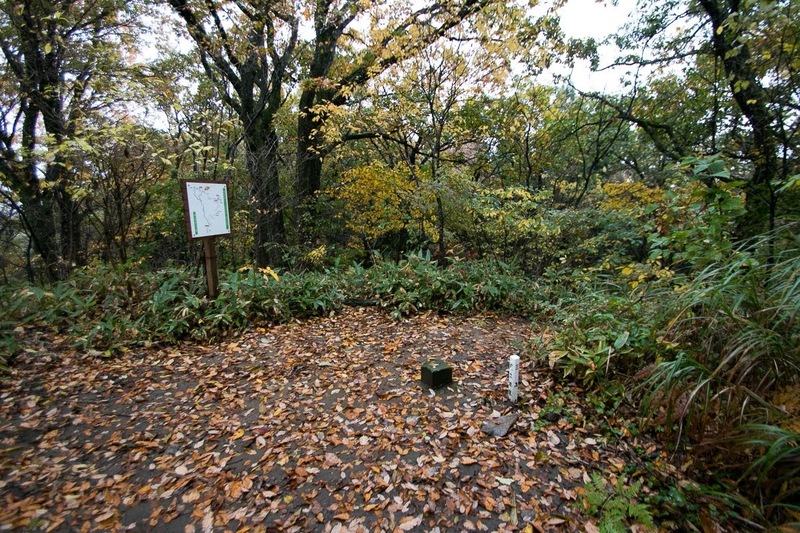 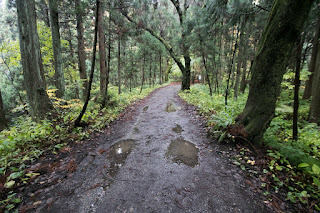 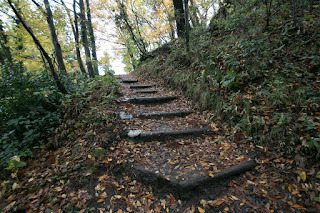 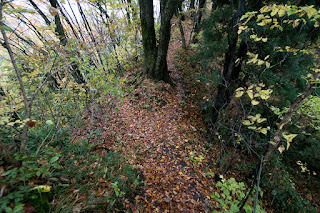 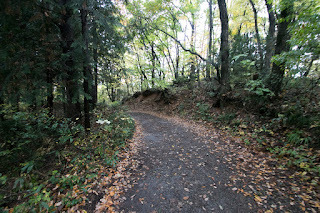 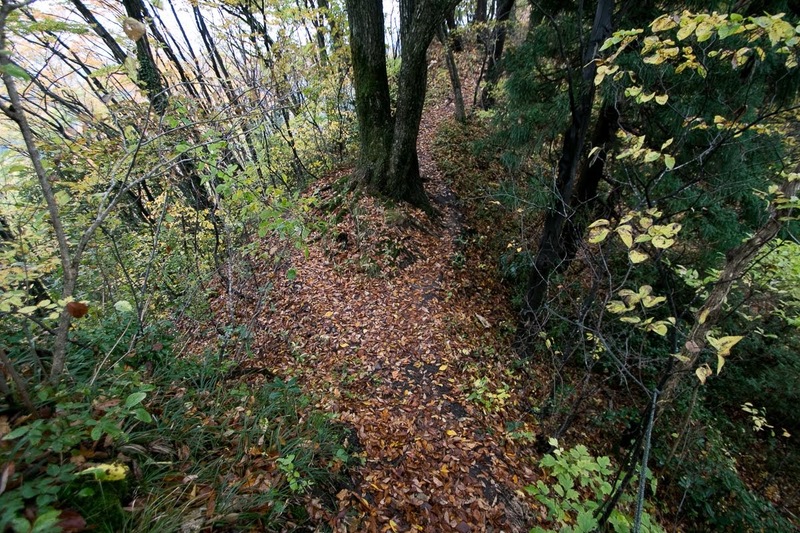 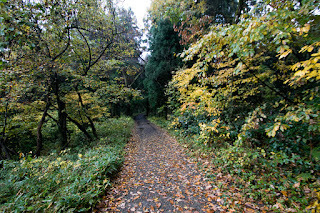 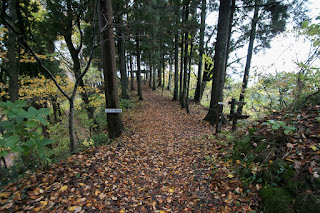 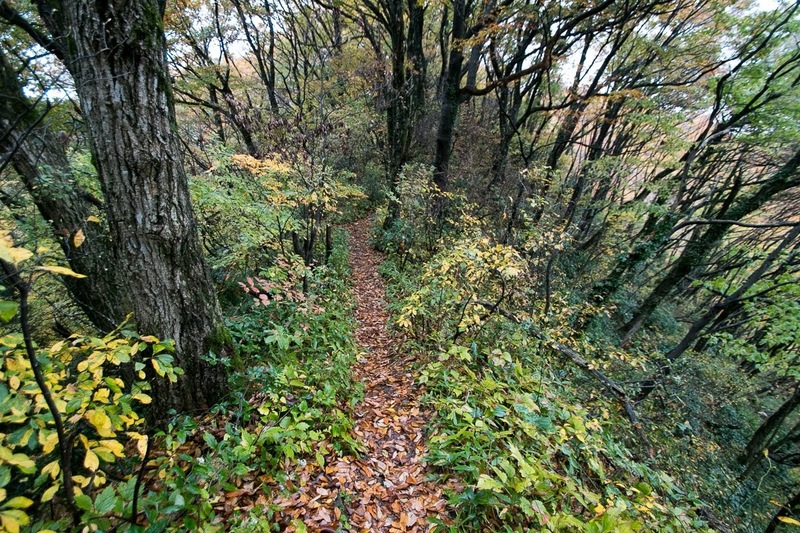 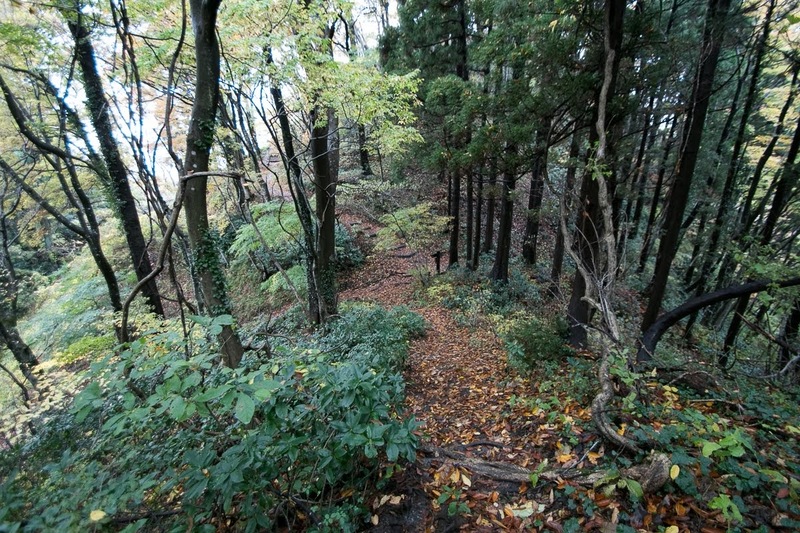 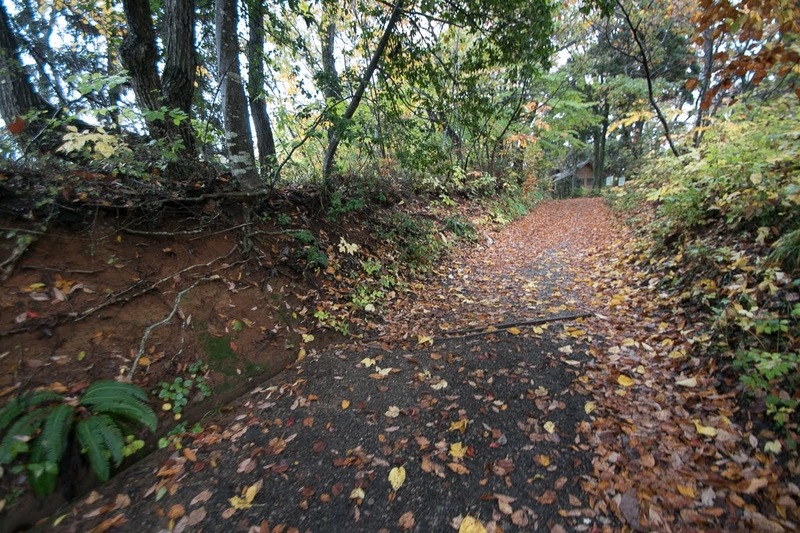 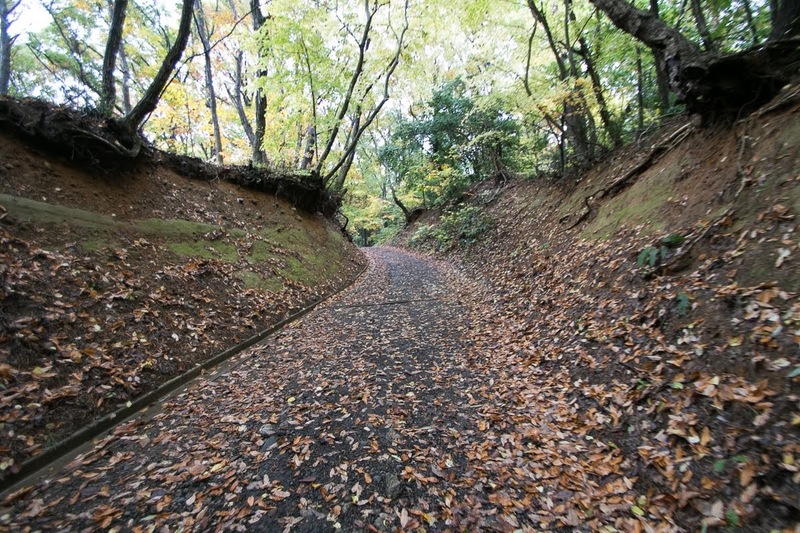 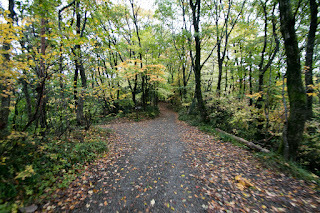 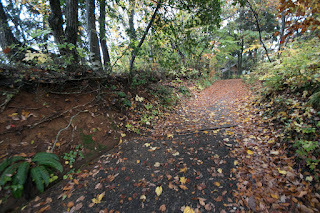 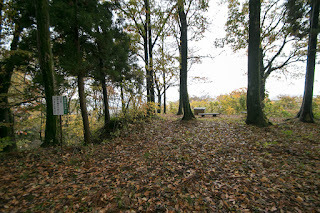 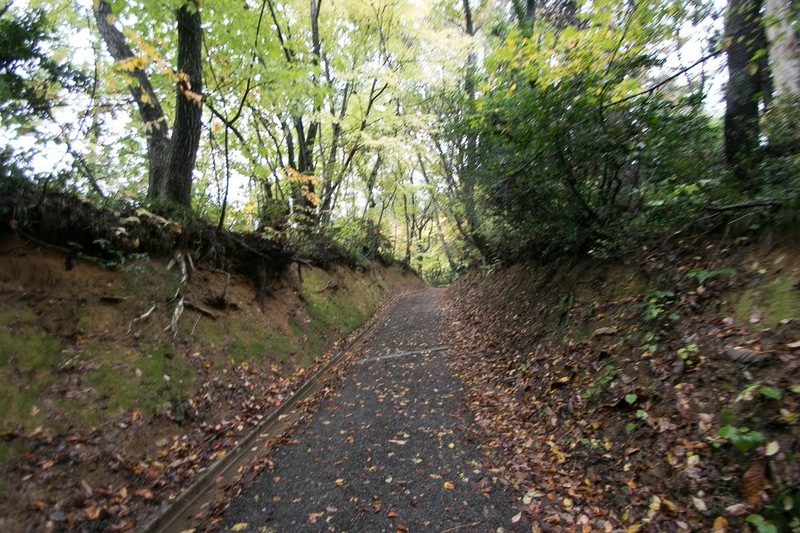 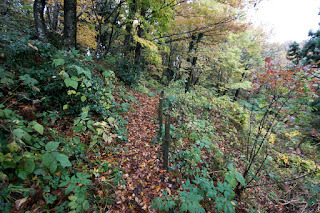 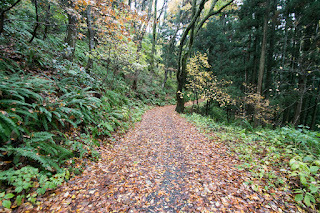 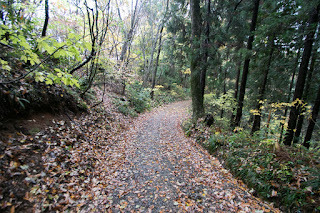 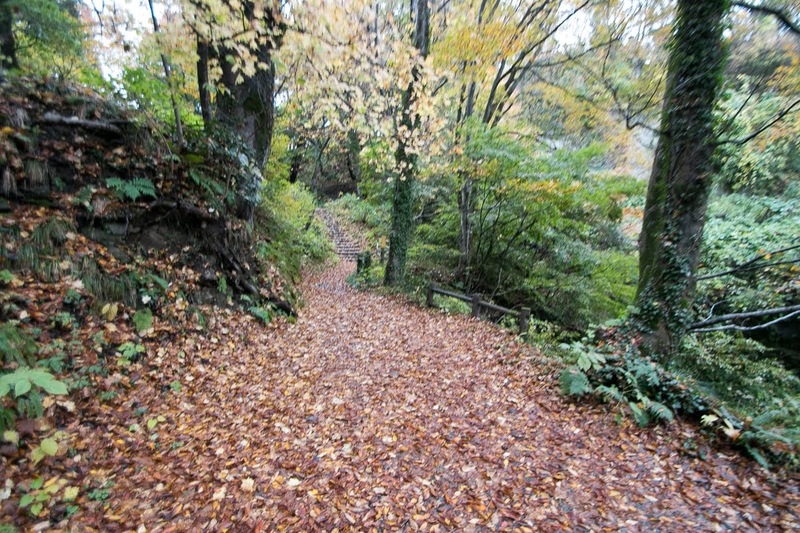 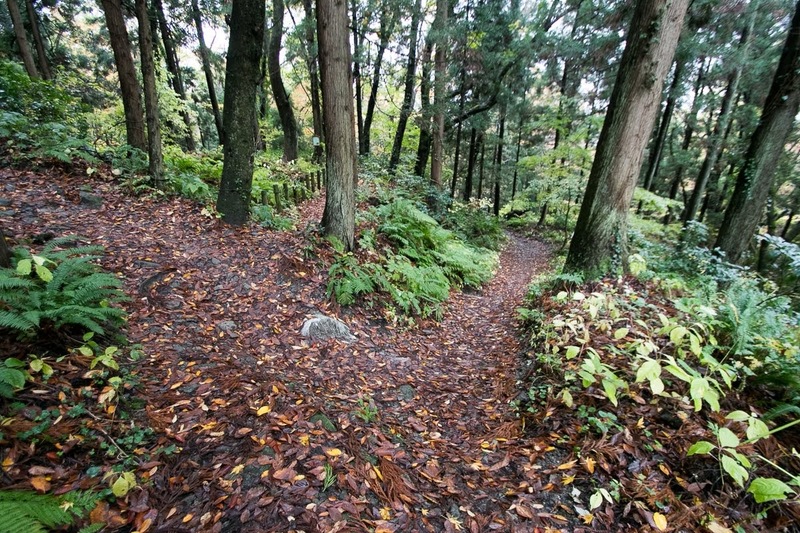 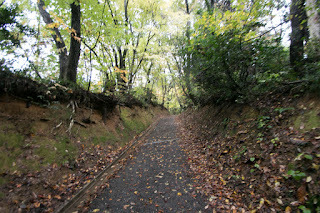 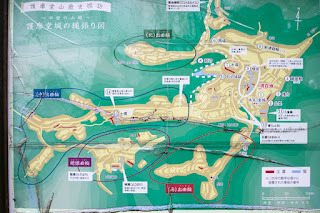 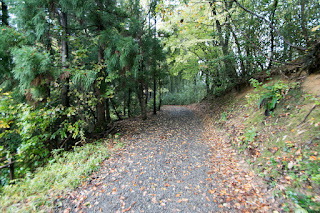 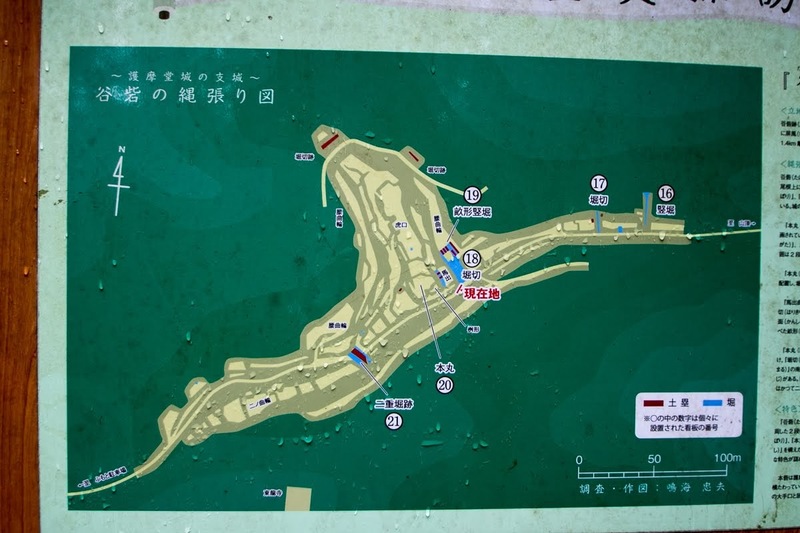 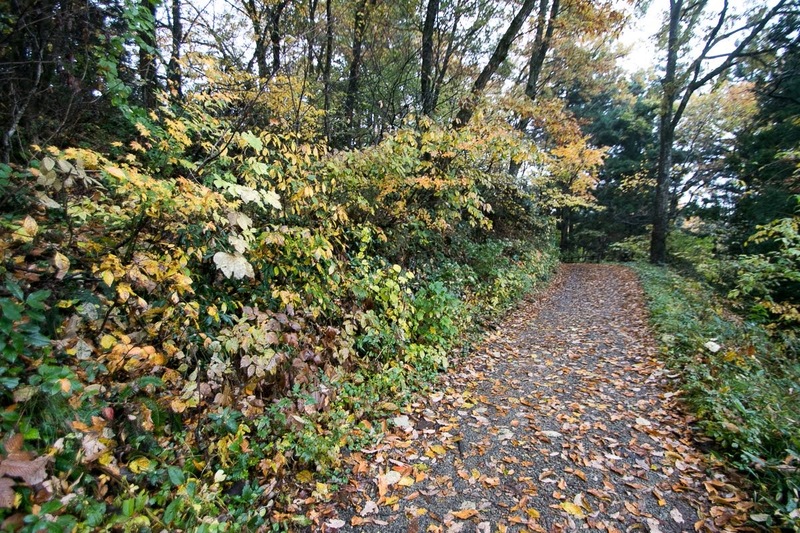 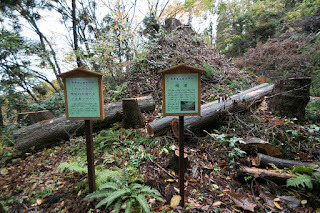 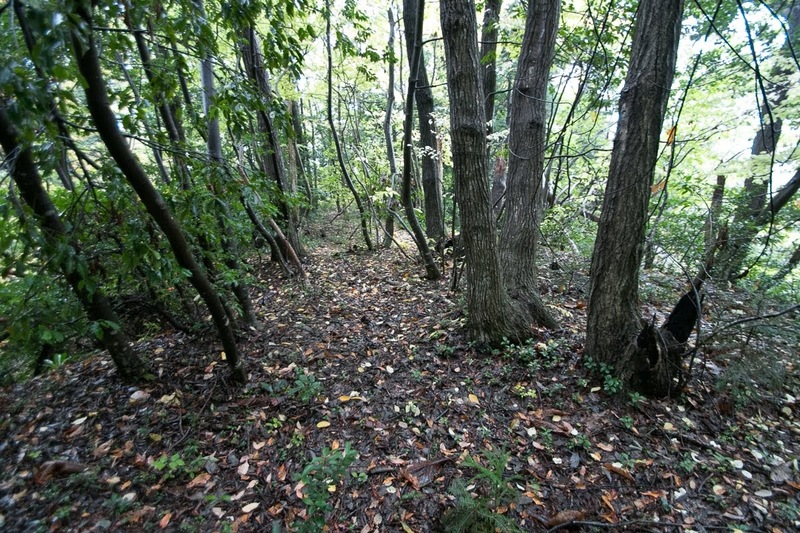 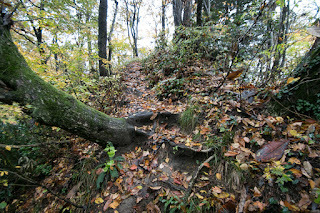 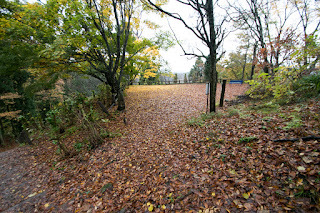 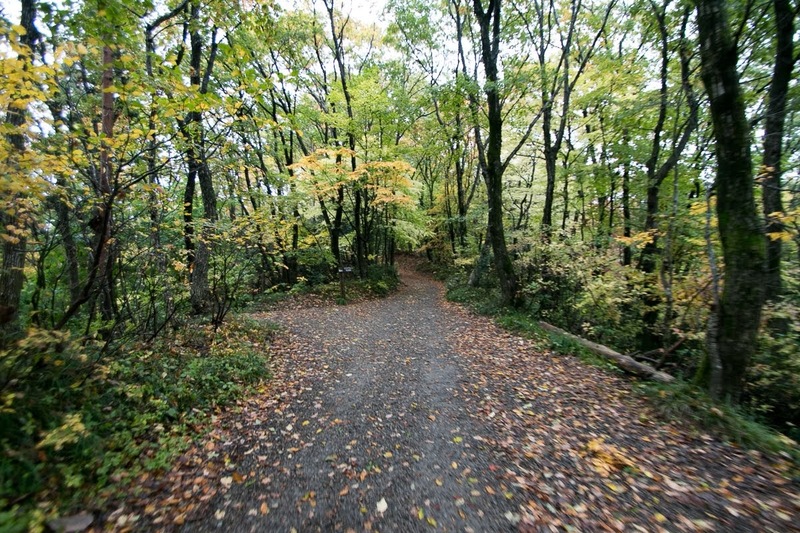 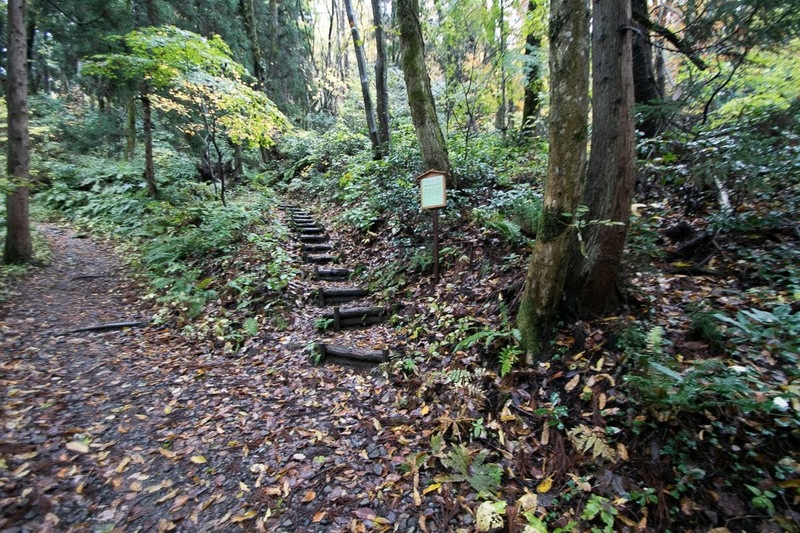 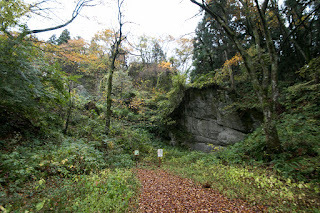 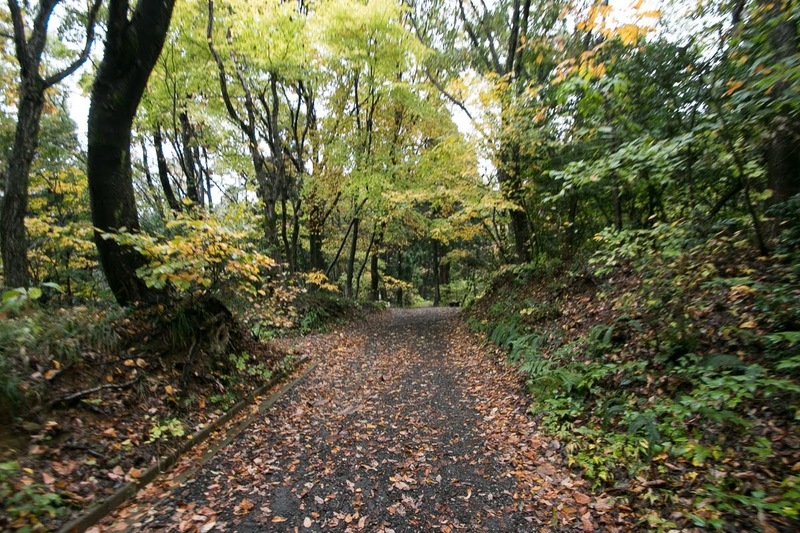 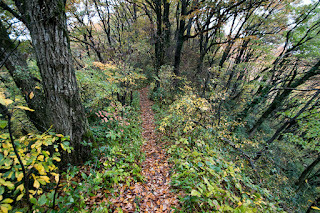 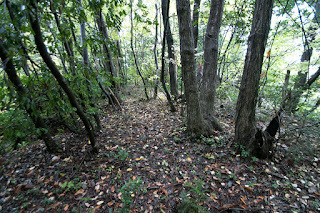 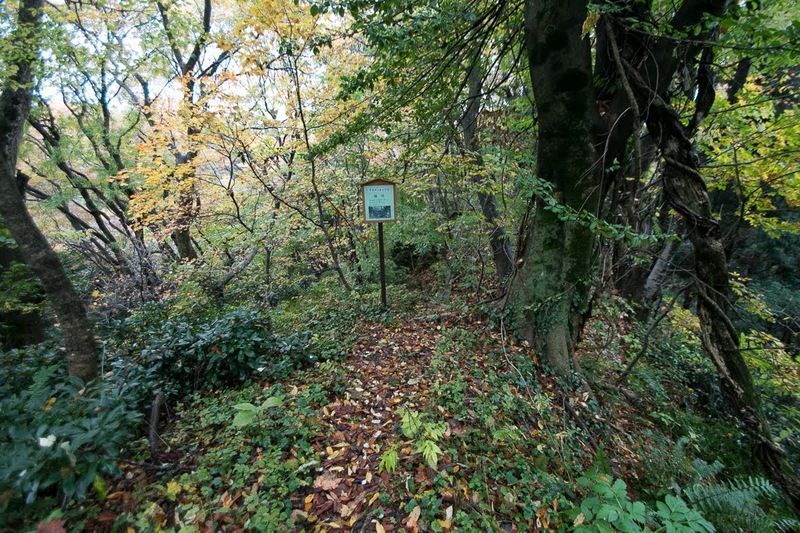 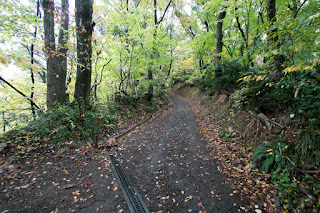 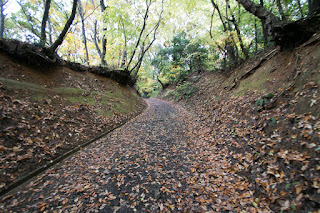 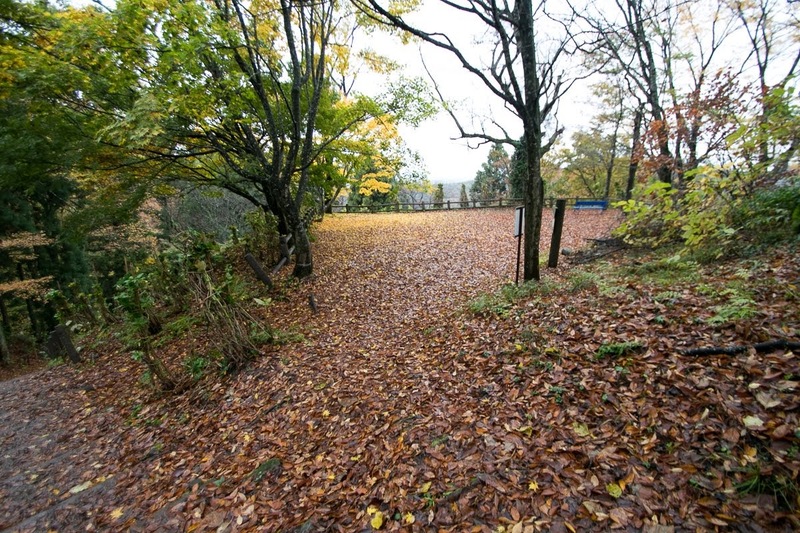 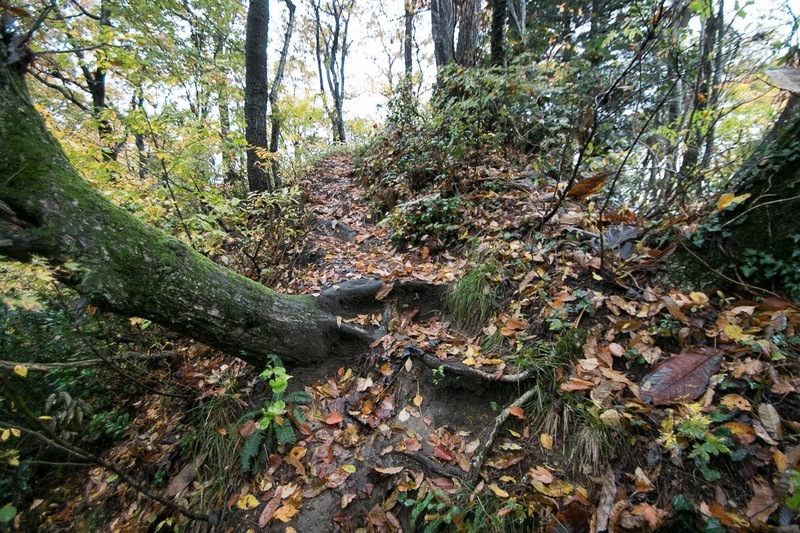 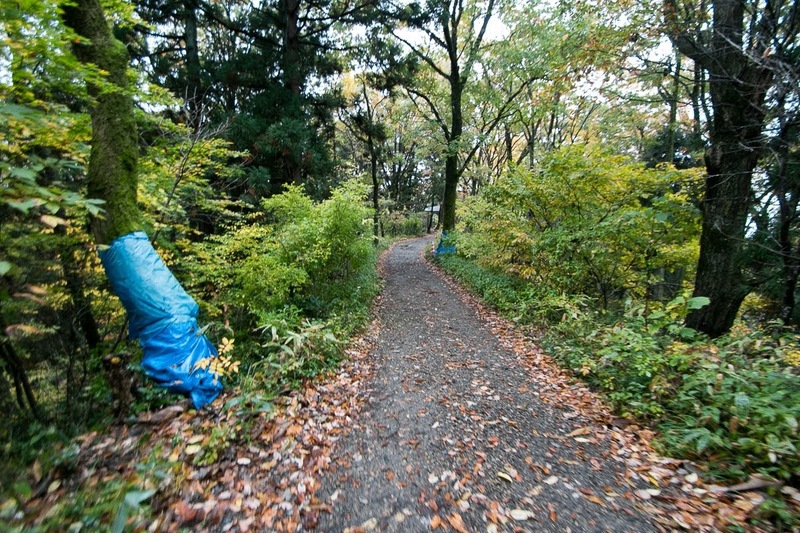 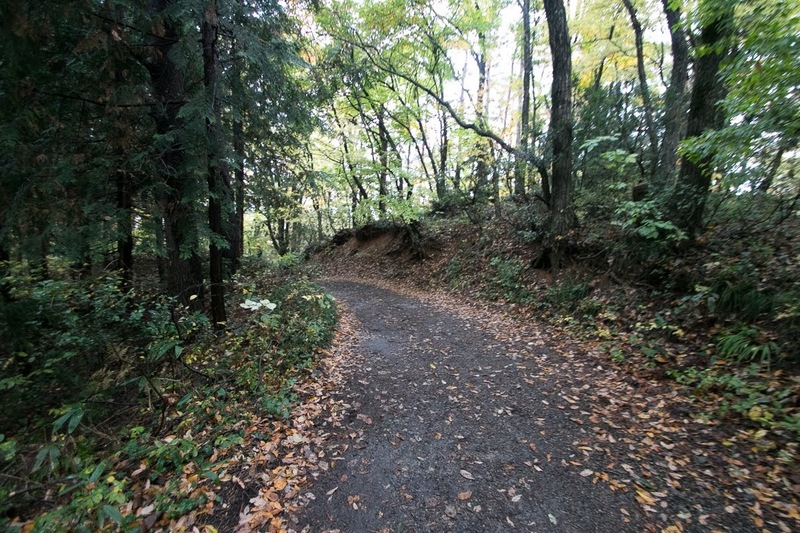 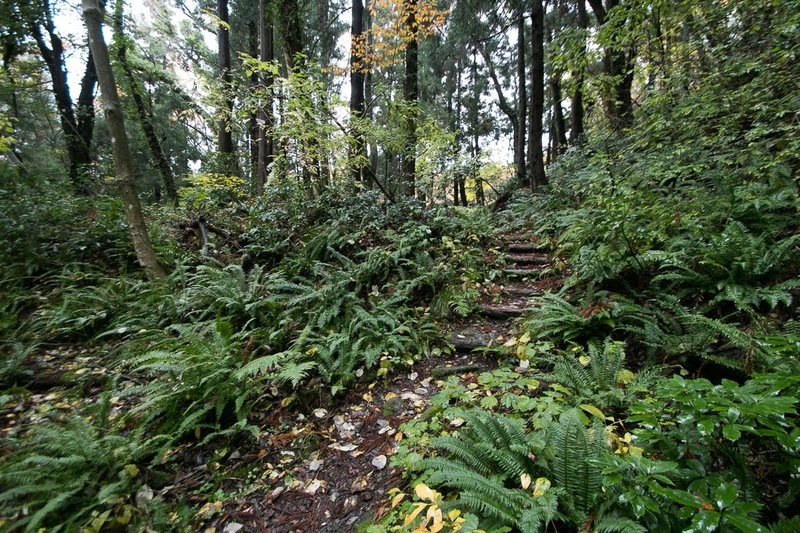 At the north edge, there are two long and narrow area of 50 meter long, which might be used as riding place. On the other hand, at the south edge, there are many small terraces built around another peak used as a basement of watch tower. 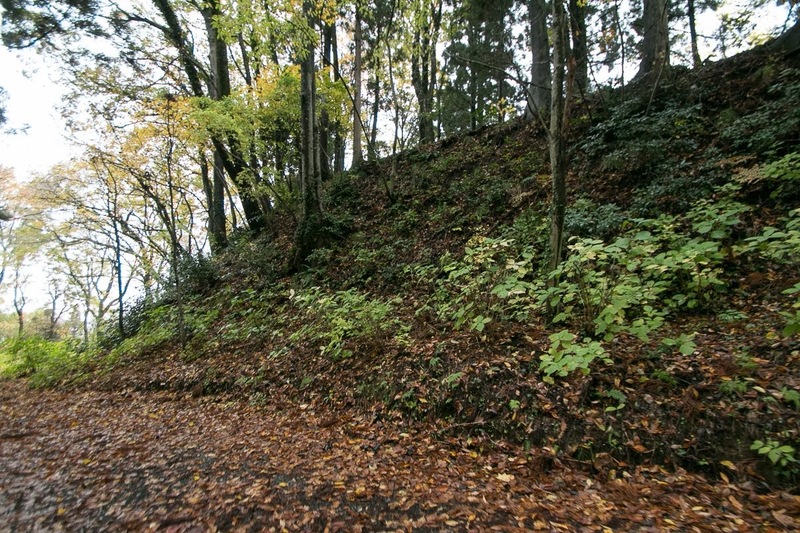 Instead of dry wall, layers of small terraces protect each edge of three ridges. 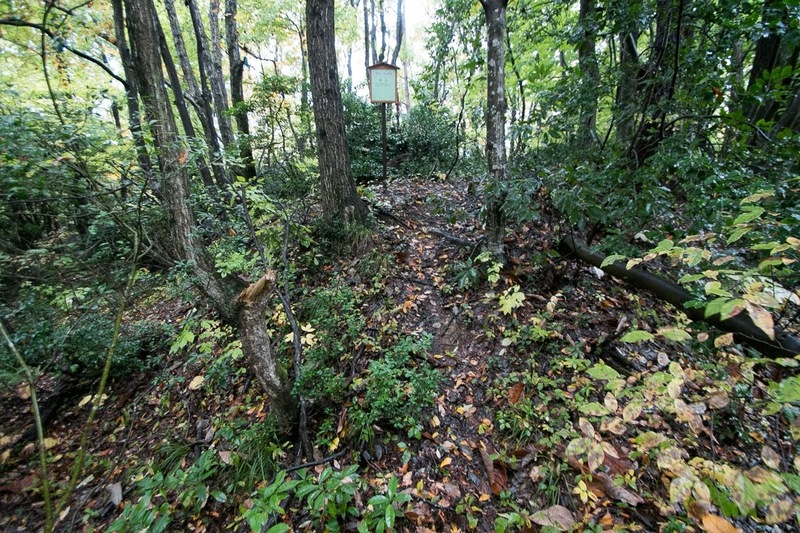 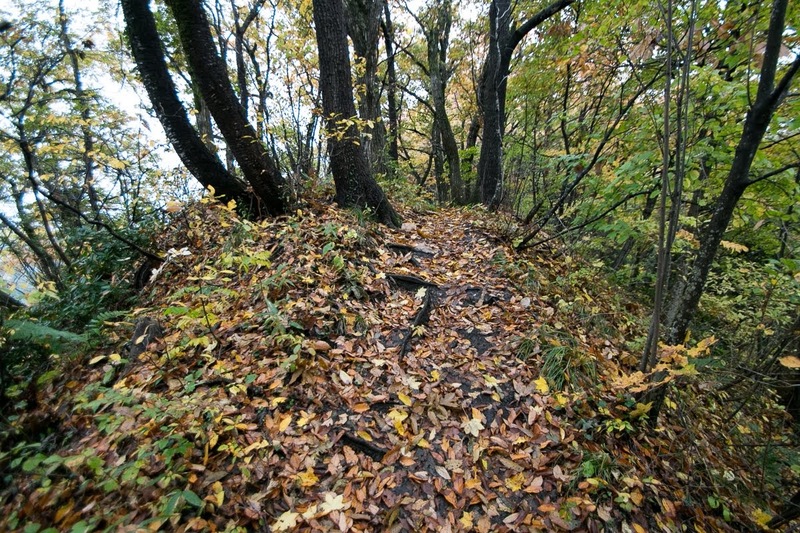 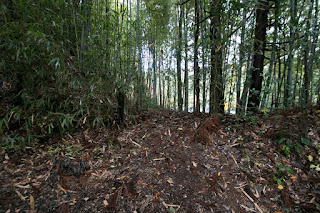 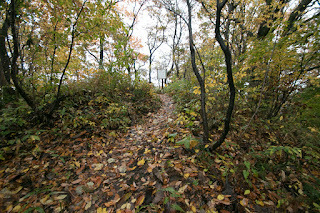 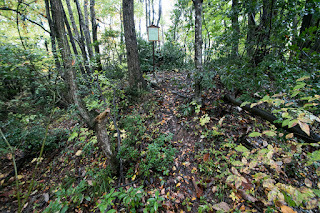 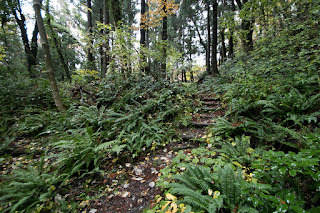 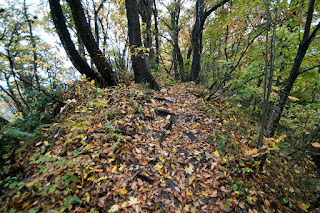 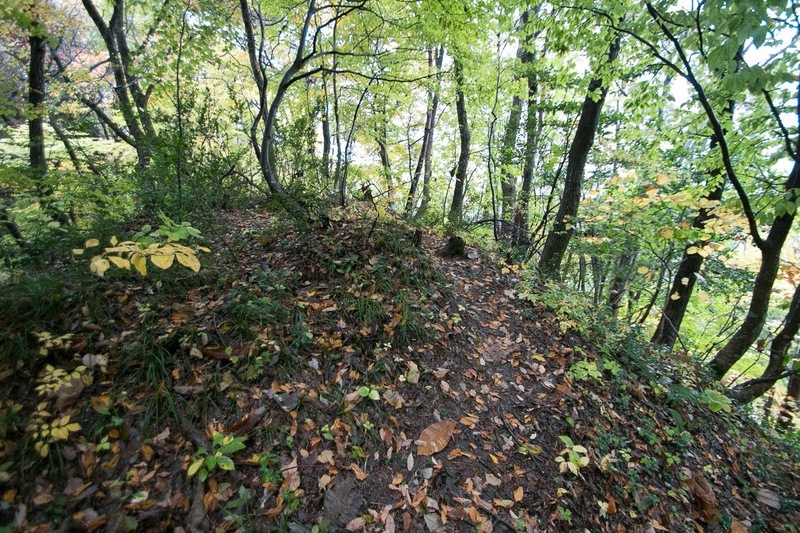 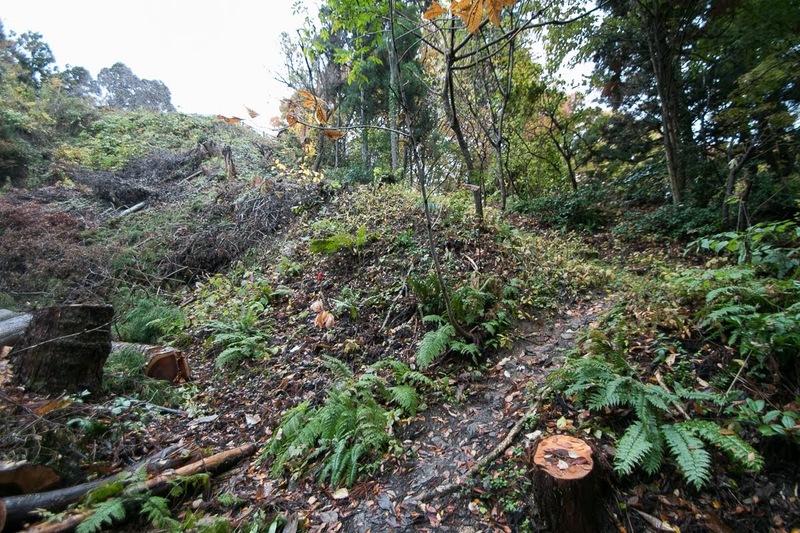 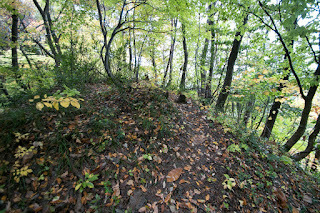 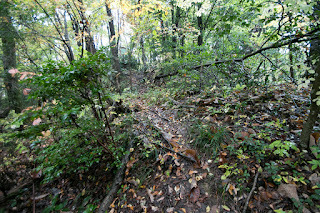 Ahead of central ridge which is used as an approach route from hillside, there are several front forts which are built utilizing slope of small peak of the mountain. 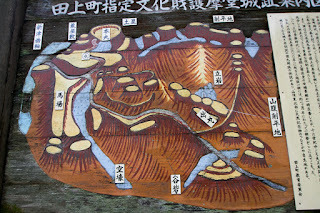 Total size of core area is about 500 meter long and 400 meter wide, and including front forts it exceed over 1 kilometer. 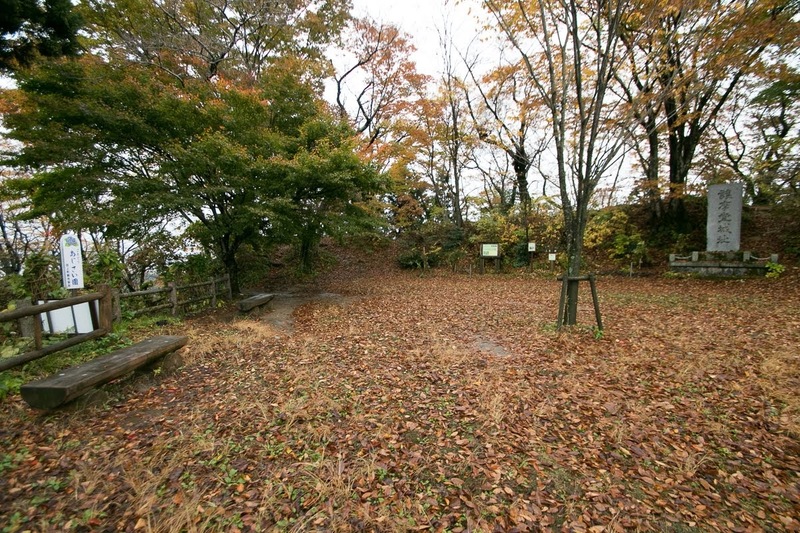 Considering its size and structure it was an important base of Uesugi clan at the middle part of the province. 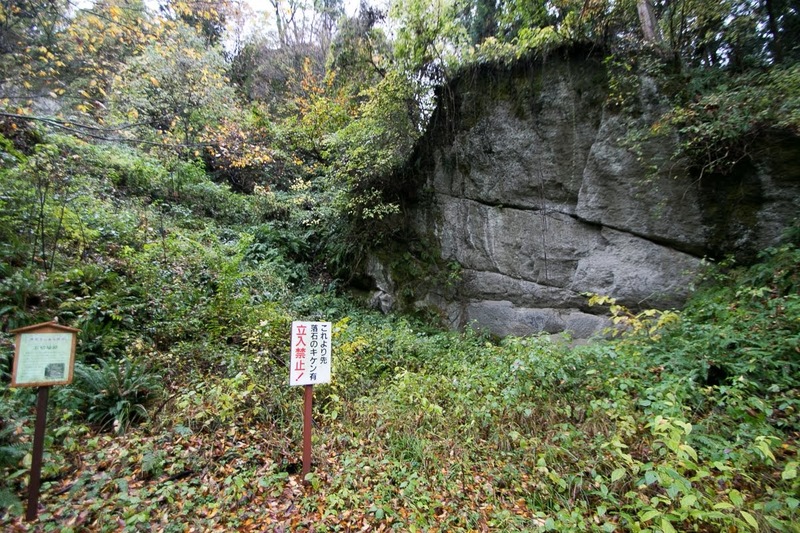 It was unexpected but soon Gomado castle became forefront to Kagekatsu Uesugi and Kagetsugu Amakasu. 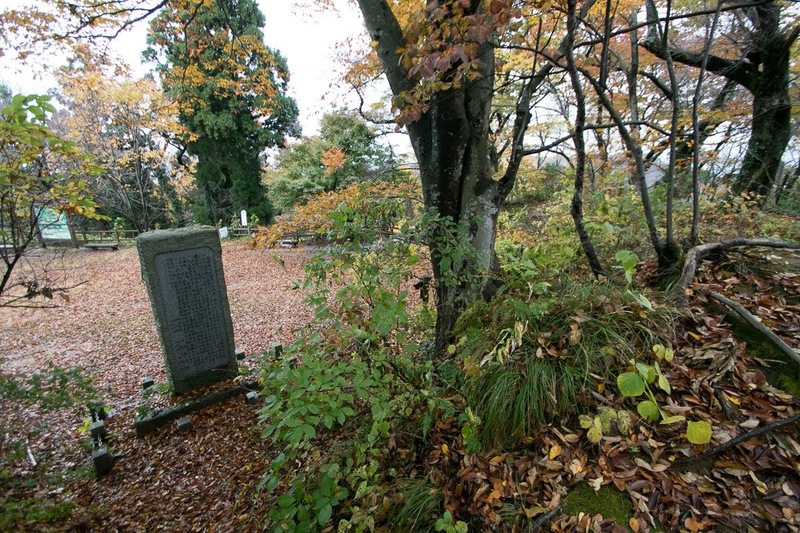 After the death of Kenshin in 1578, two adopted sons that mean Kagekatsu Uesugi and Kagetora Uesugi (1554-1579) struggled for next leader. 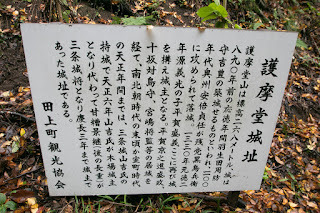 Amakasu clan naturally belonged to Kagekatsu Uesugi, and stood against the attack of neighbor lords such as Koshi Nagao clan or Honjo clan. 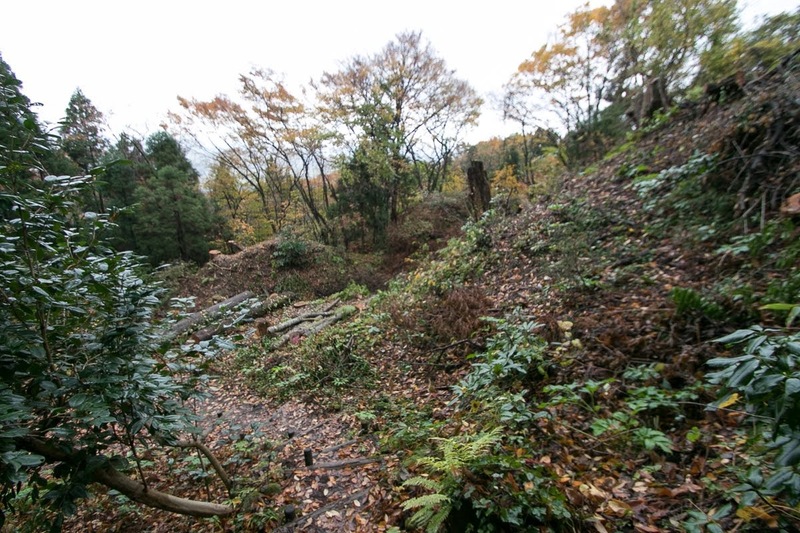 After the cease of this internal conflict, Shibata clan which was the lord of Shibata castle who supported Kagekatsu but was not rewarded raised his army against his master in 1581. Shibata clan had a strong army and was supported by Ashina clan which was the lord of Aizu basin, and Kagekatsu had to face with central ruler Nobunaga Oda (1534-1582) at western border. 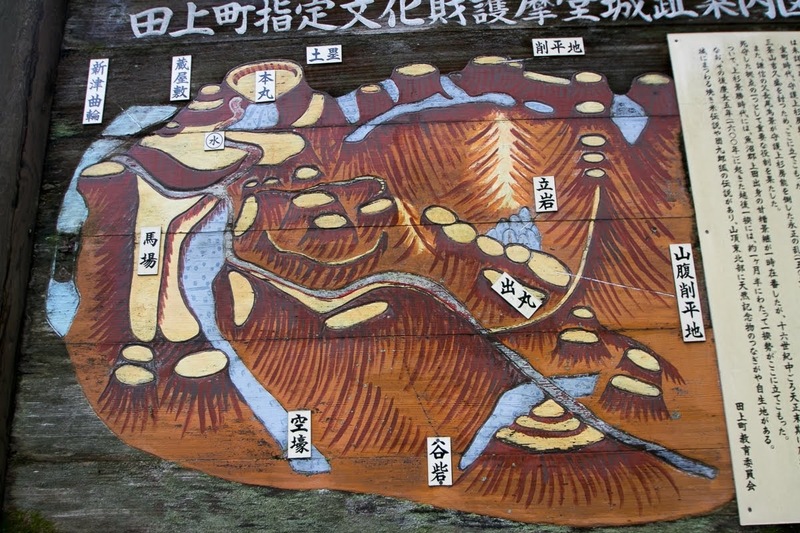 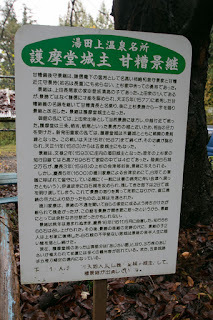 Without reinforcement army, Amakasu clan stood against the pressure of Shibata army for several years. Among this time Uesugi clan barely escaped the danger of ruin by the death of Nobunaga in the accident of Honnoji in 1582, and allied with next ruler Hideyoshi Toyotomi. 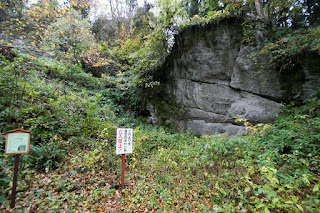 Under the acknowledge of Hideyoshi, Kagekatsu ruined Shigeie Shibata in 1587 and united Echigo province again. 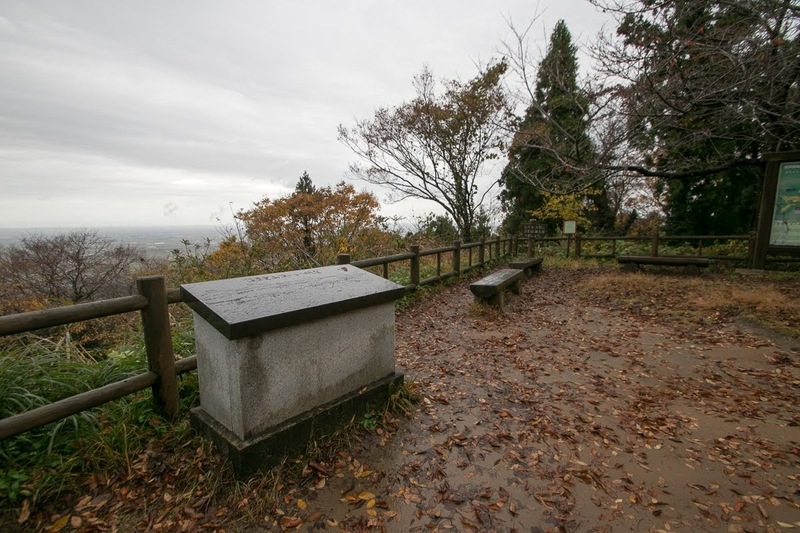 After the cease of this rebel, Kagekatsu moved Kagetsugu Amakasu to Gosen castle, at the east from Gomado castle but more closer to the border toward Aizu basin. At that time Ashina clan went collapse and nearly ruined by Date clan which was the lord of Yonezawa castle (Yamagata prefecture), thus it was necessary to secure this border. 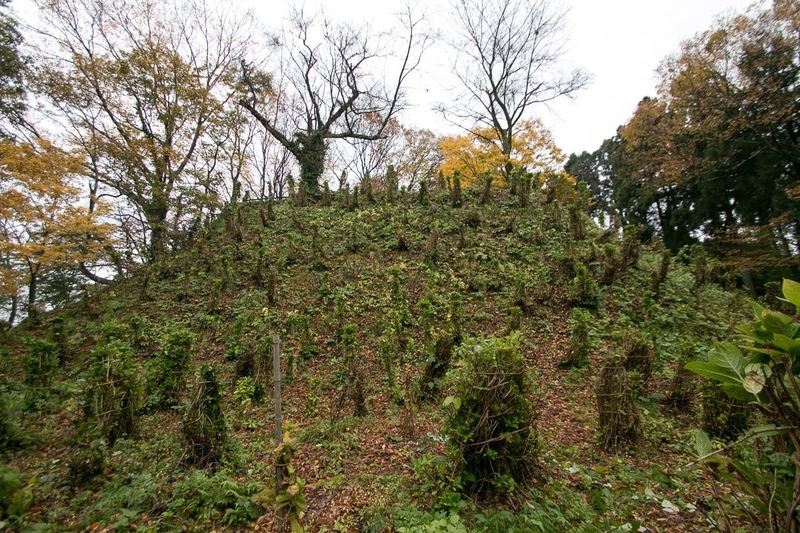 After that Gomado castle might be used as a direct base of Uesugi clan. In 1593, Kagekatsu placed Kagetsugu Amakasu as the commander of Tozenji castle (Yamagata prefecture) of Dewa province (Yamagata prefecture) later renamed to Sakata castle, the main base in Shonai plain. 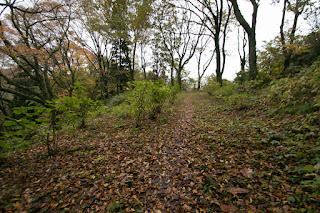 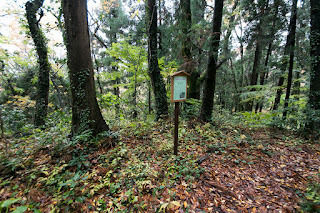 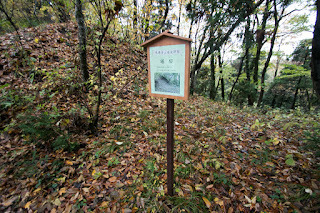 Shonai plain was a place where Uesugi clan captured pushing out Mogami clan, and separated by long mountain road from Echigo province. 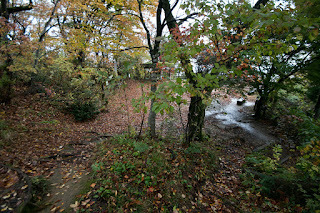 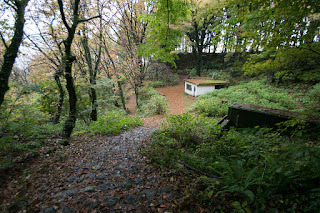 Kagetsugu well kept Tozenji castle preparing for the revenge of Mogami clan. 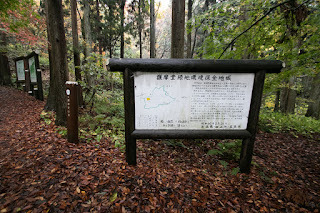 Five years later, in 1598, Uesugi clan was ordered to move to Aizu basin by Toyotomi government, succeeded former territory of Ujisato Gamo (1556-1595) who was the lord of Aizu Wakamatsu castle (Fukushima prefecture). Kagetsugu became the commander of Shiroishi castle (Miyagi prefecture), where was the origin of Date clan but was confiscated by Hideyoshi Toyotomi. Shiroishi castle was over 100 kilometer distant from Aizu Wakamatsu castle separated by mountains, and just next to the territory of Date clan. Masamune Date (1567-1636), the leader of Date clan, aimed to recover the native place of Date clan, and Kagetsugu had to face it without reinforcement army. In 1600, at the conflict between Ieyasu Tokugawa (1543-1616) and Mitsunari Ishida (1560-1600) after the death of Hideyoshi, Uesugi clan belonged to Mitsunari thus Ieyasu tried to attack Uesugi clan both by himself and Masamune Date. 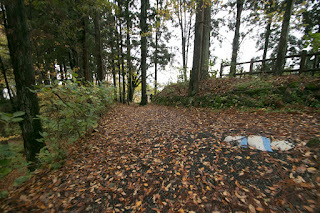 Masamune attacked Shiroishi castle by large army, and unfortunately Kagetsugu stayed at Aizu Wakamatsu castle at this time. 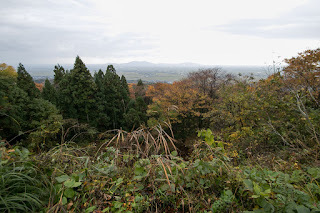 Lacking the brave general, the moral of Uesugi army was not high. 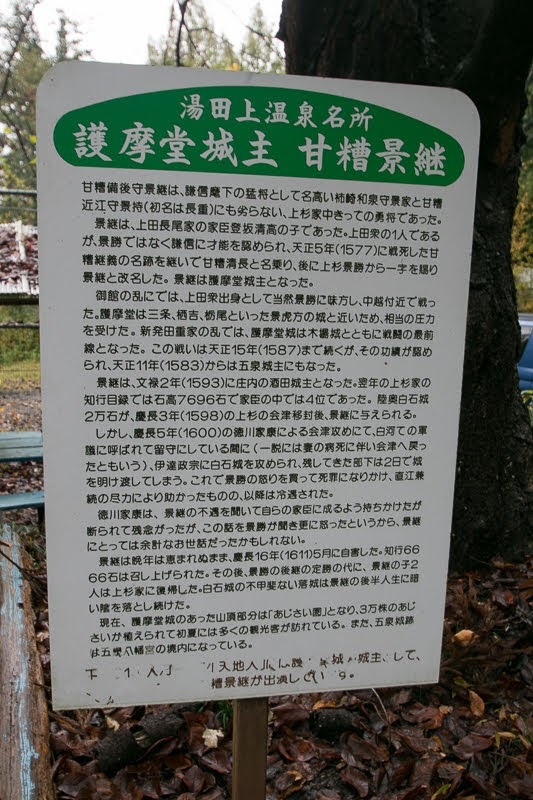 On the other hand, Date clan knew the weak point of the castle as former territory and achieved the support of local residents. 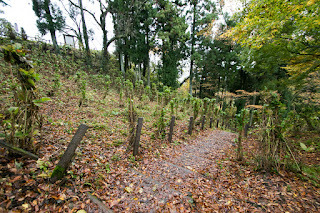 Uesugi clan could not keep the castle then opened it after one day battle, then Shiroishi castle became the territory of Masamune Date again. 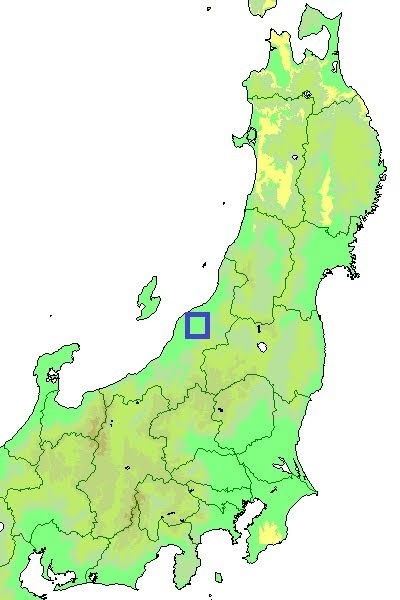 After that Masamune advanced southward but faced the counterattack of Uesugi army at Fukushima castle then gave up further expansion. But because the loss of Shiroishi castle, Uesugi army had to use western mountainous road for the attack to Mogami clan to avoid both side attack of Mogami army and Date army thus this became one reason of the failure of campaign against Mogami army. 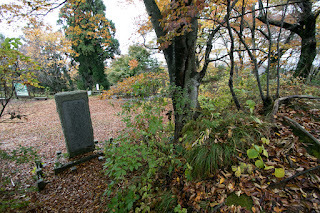 After the loss of Shiroishi castle Kagetsugu Amakasu was still an important retainer of Uesugi clan, but after his death in 1611 his territory was once confiscated. It is talked that Kagekatsu coldly treated Kagetsugu blaming for the loss of Shiroishi castle, but it was a result of too tough condition and misfortune and Kagekatsu might not do so considering achievement and loyalty of Kagetsugu. 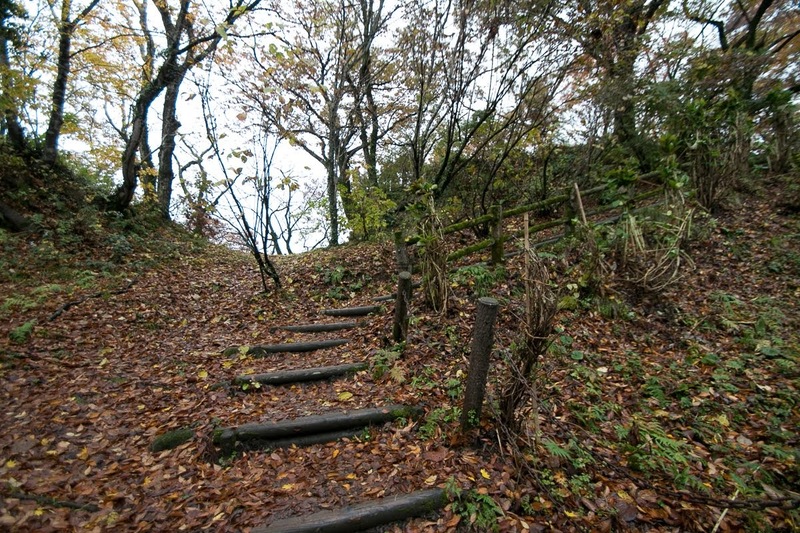 Gomado castle was abolished at the move of Uesugi clan to Aizu region. 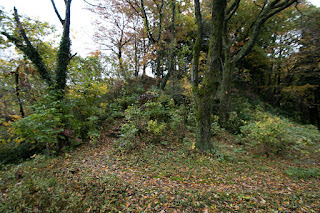 Today no building was left but structure of the castle well remain over hilltop area. 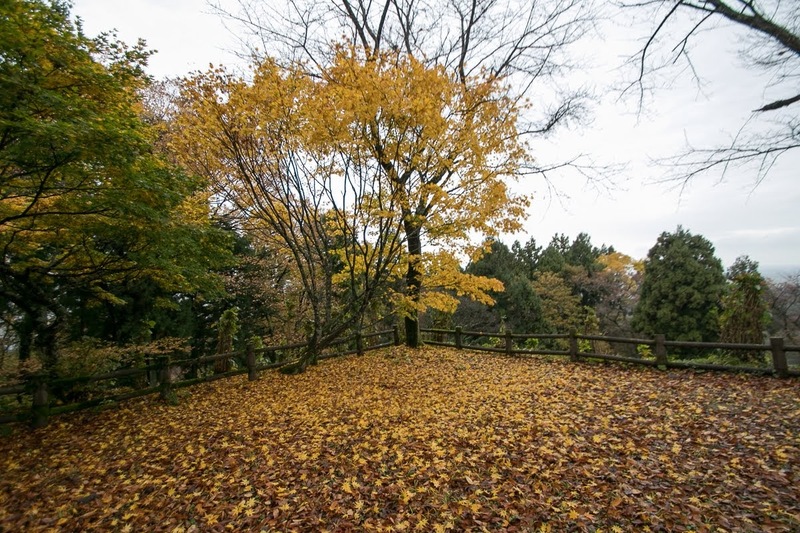 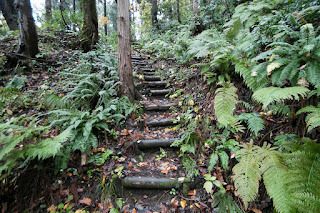 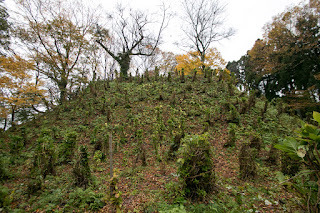 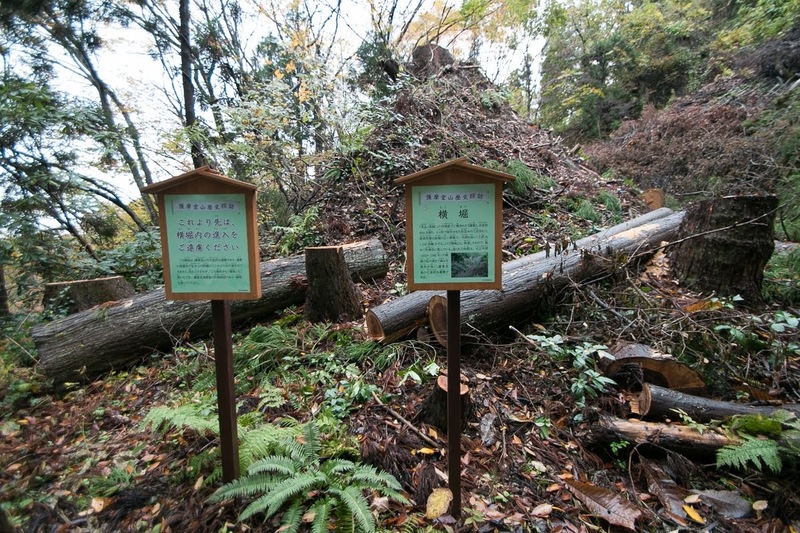 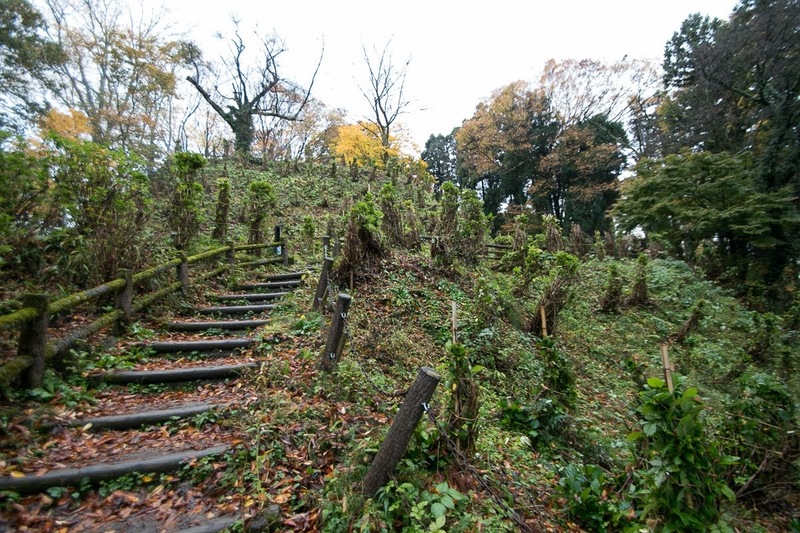 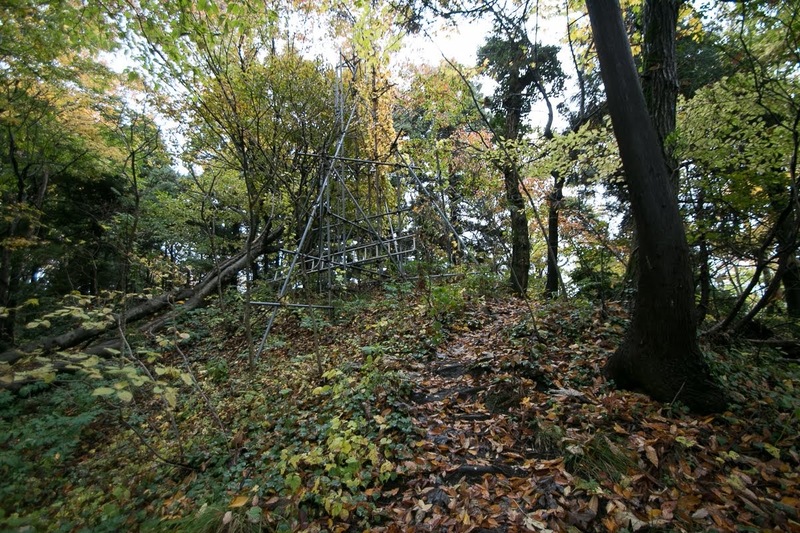 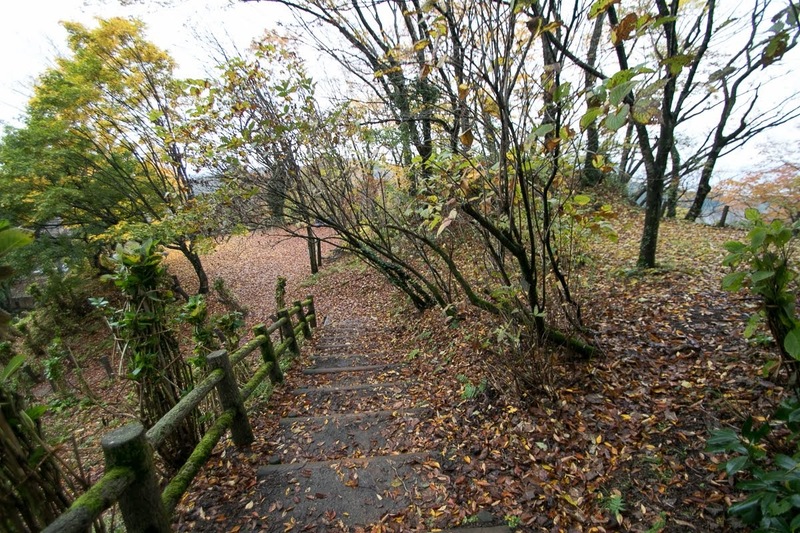 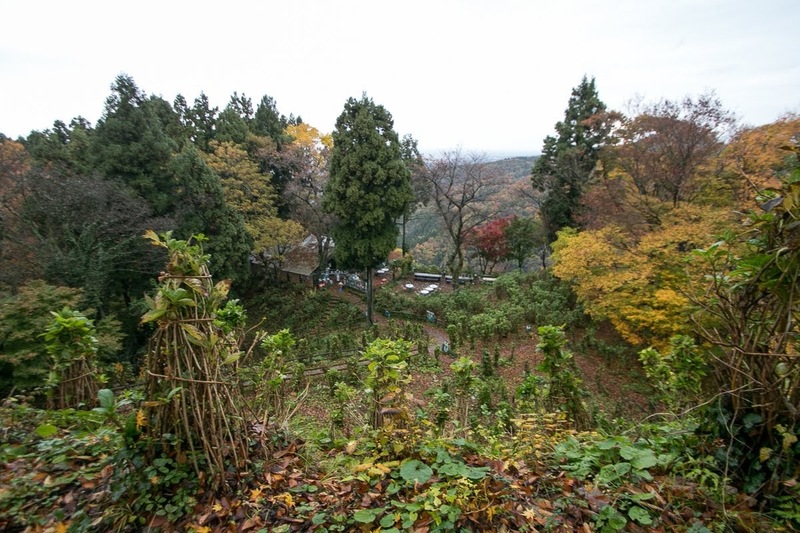 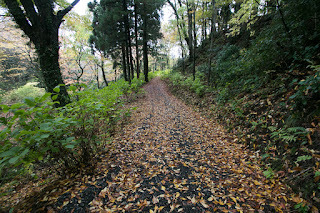 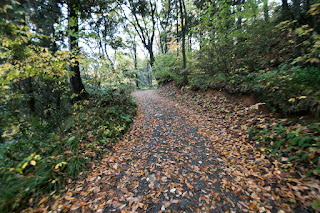 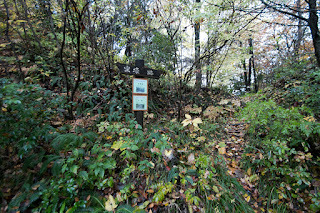 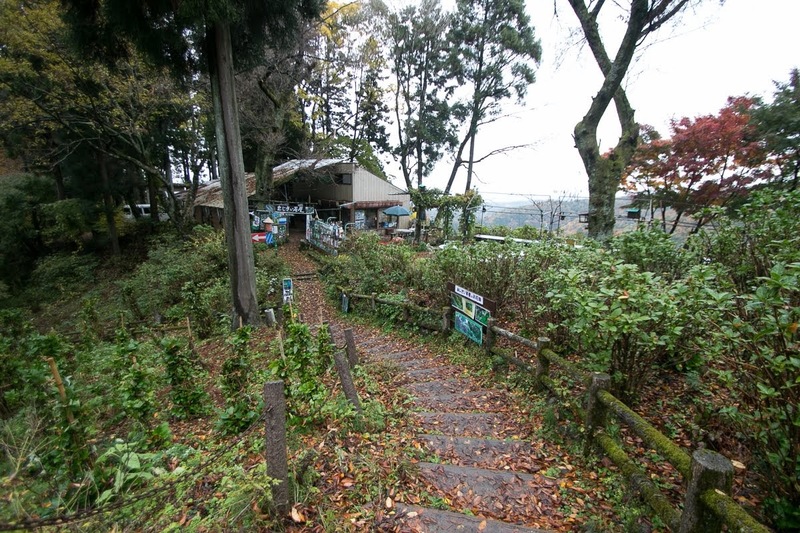 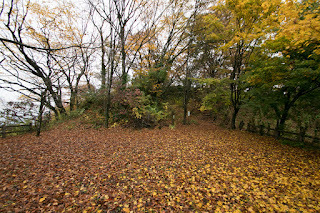 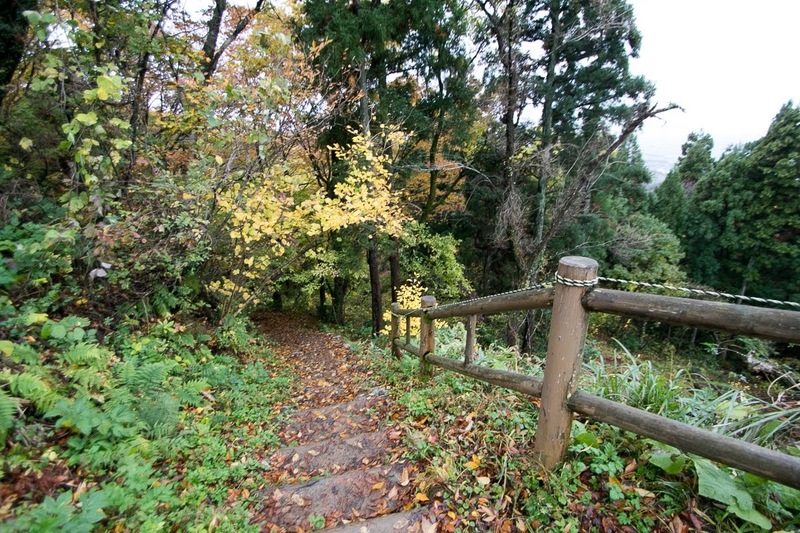 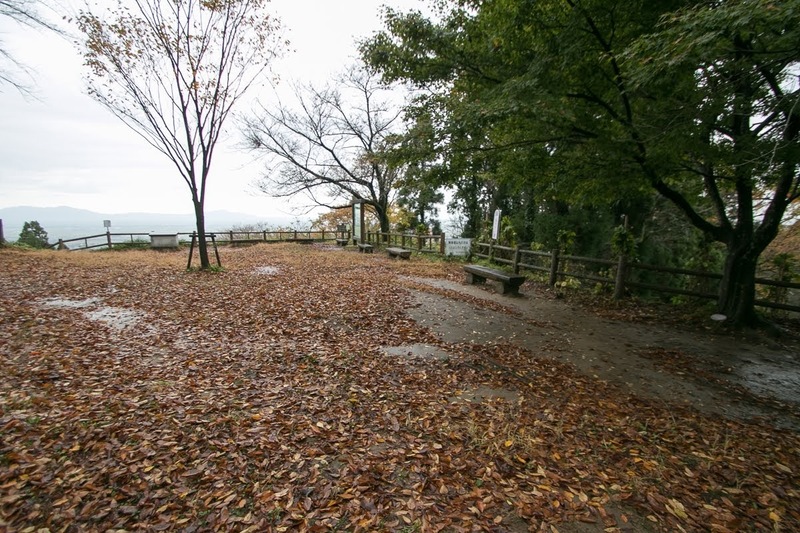 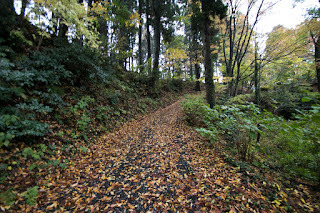 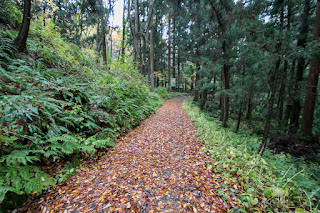 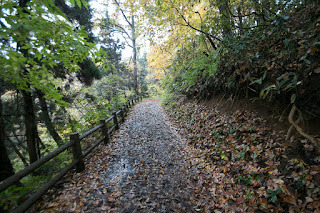 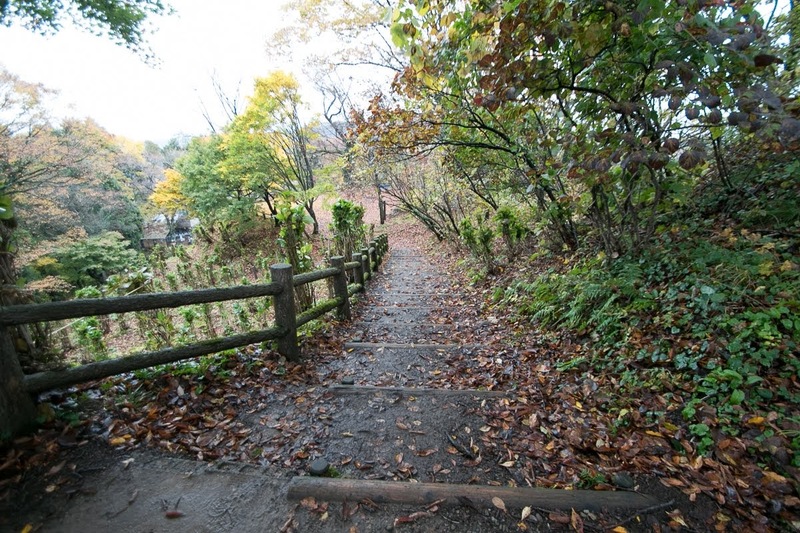 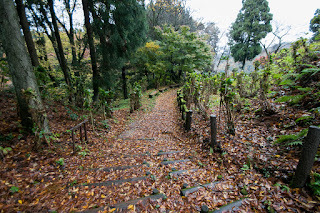 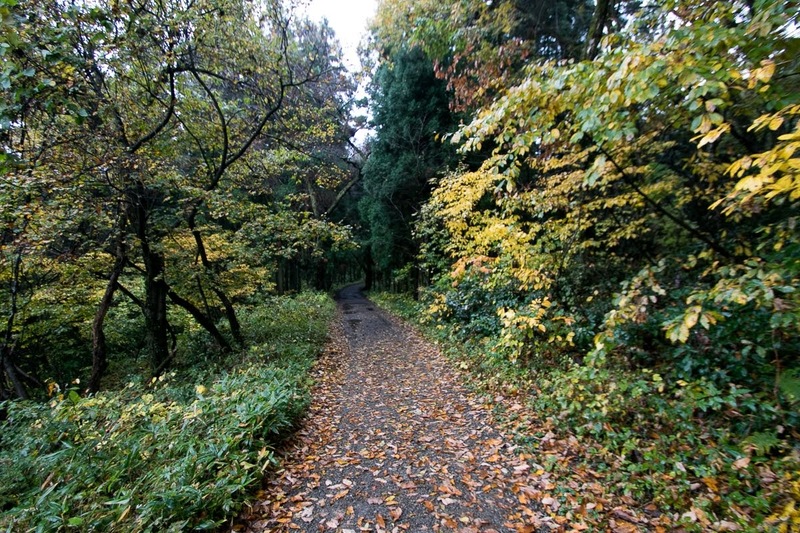 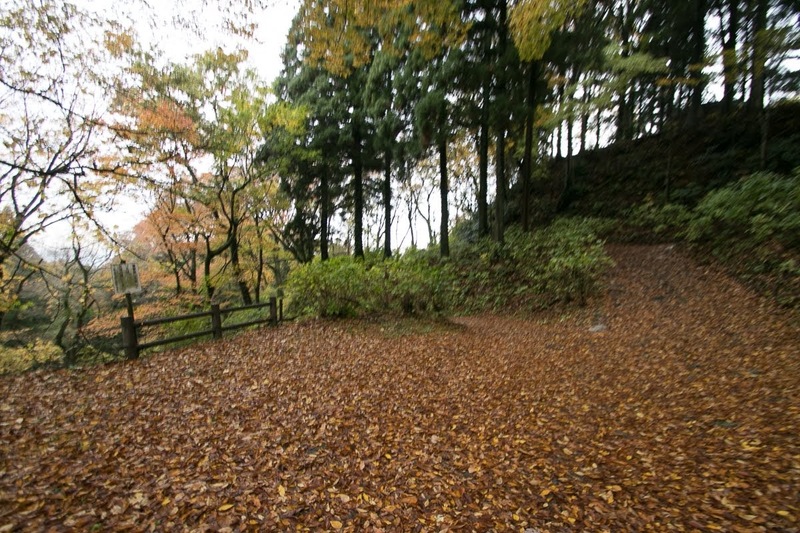 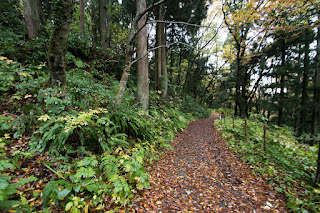 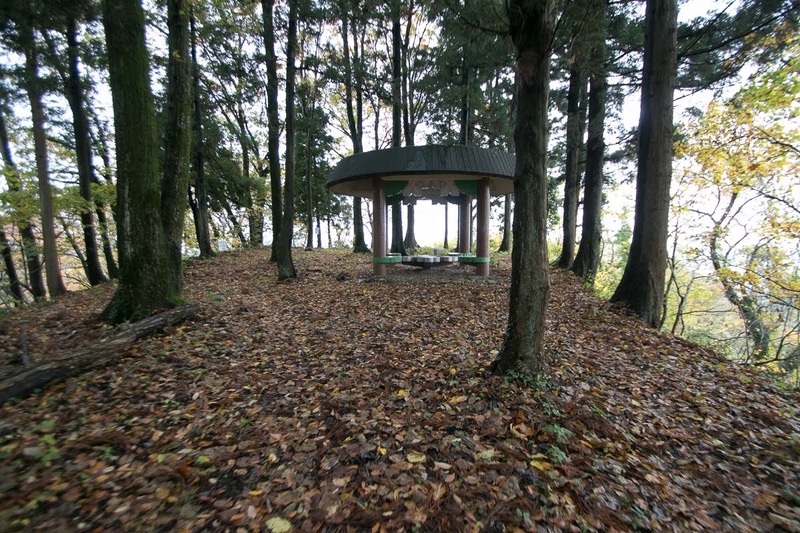 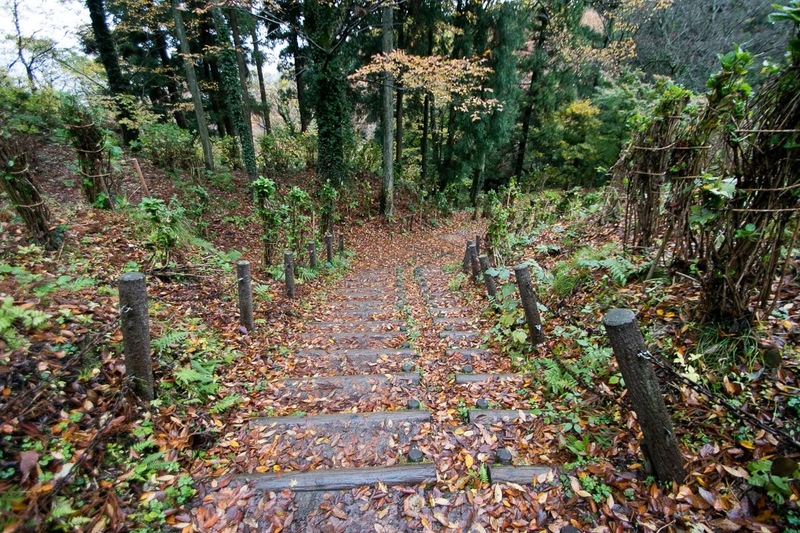 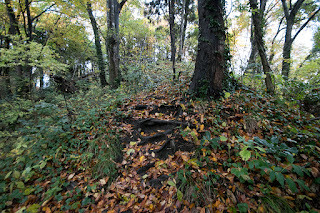 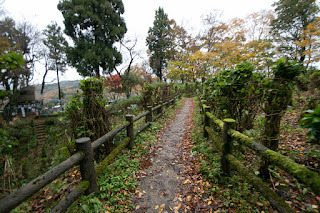 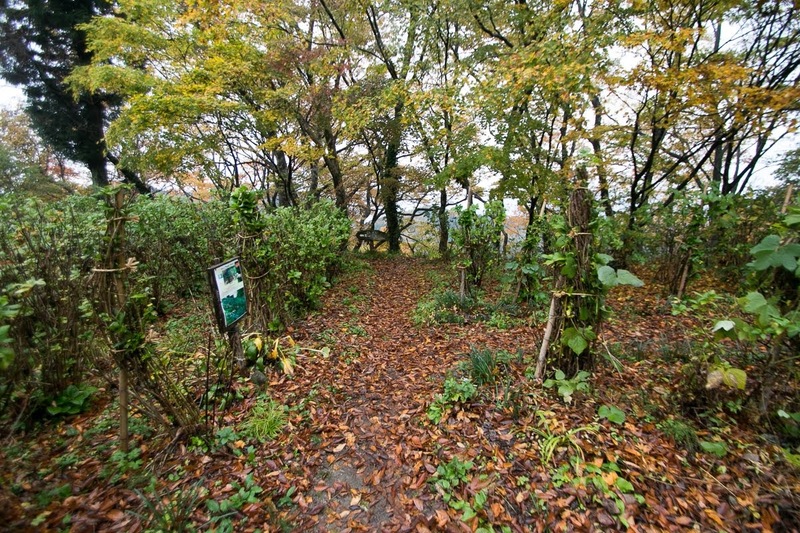 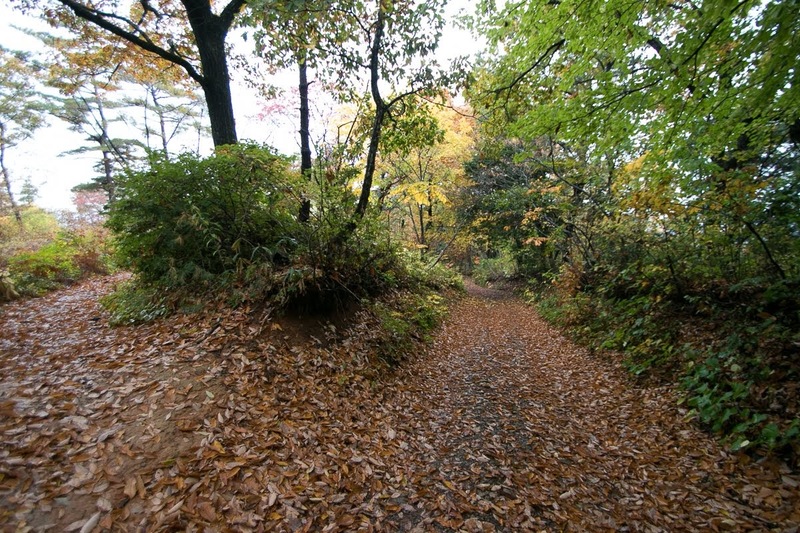 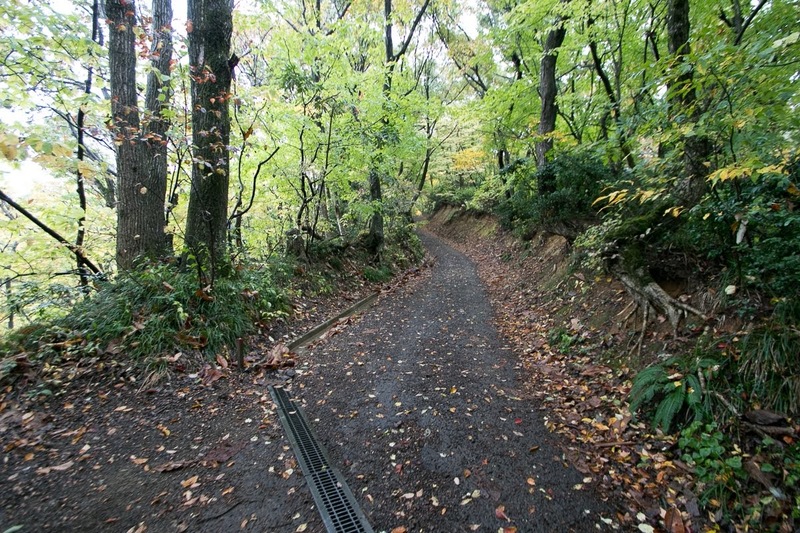 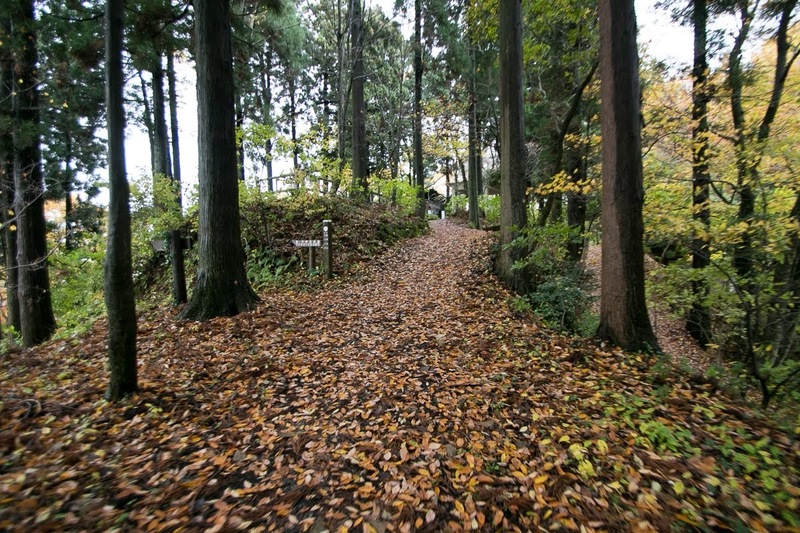 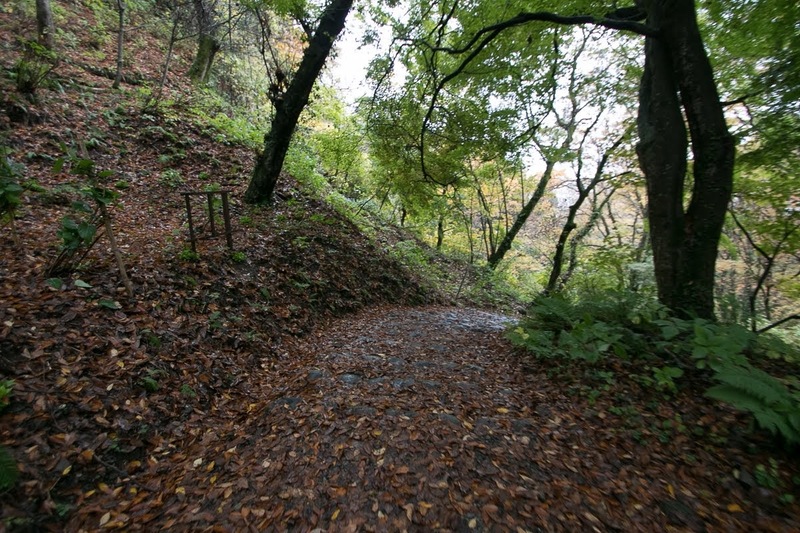 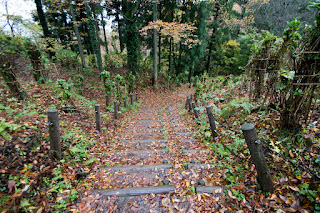 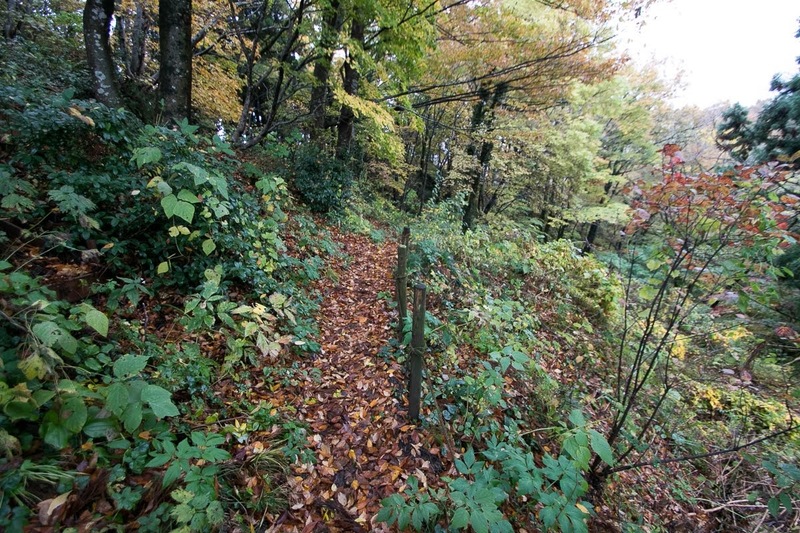 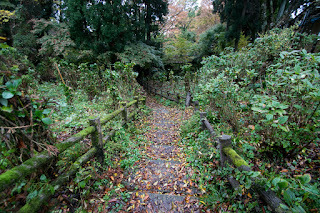 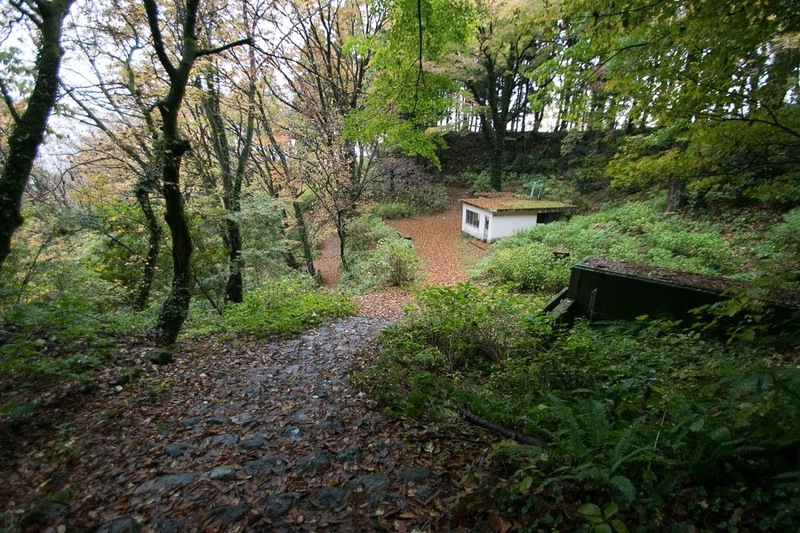 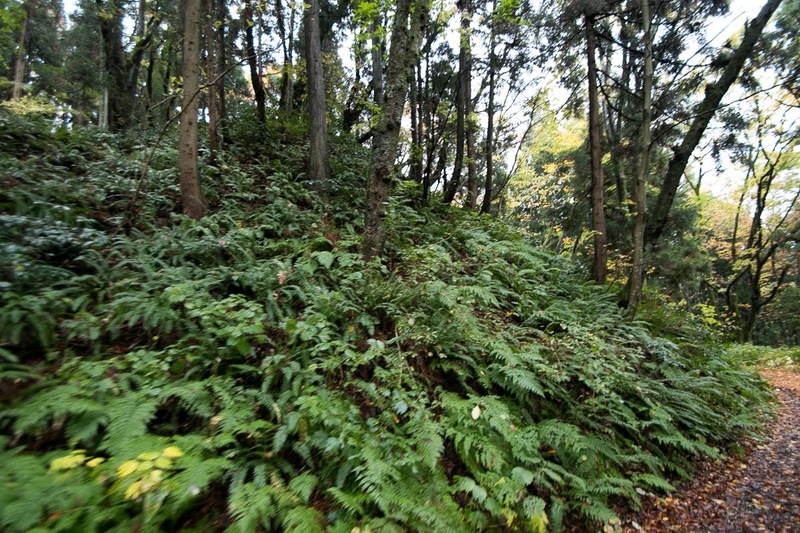 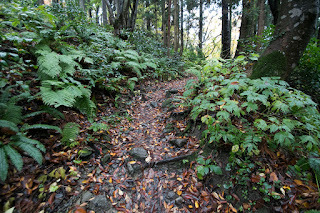 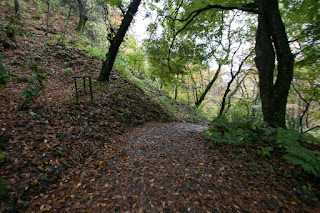 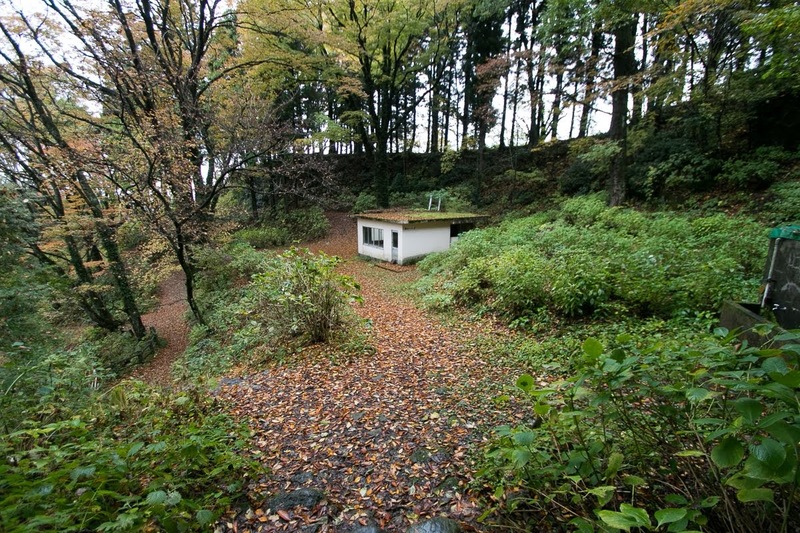 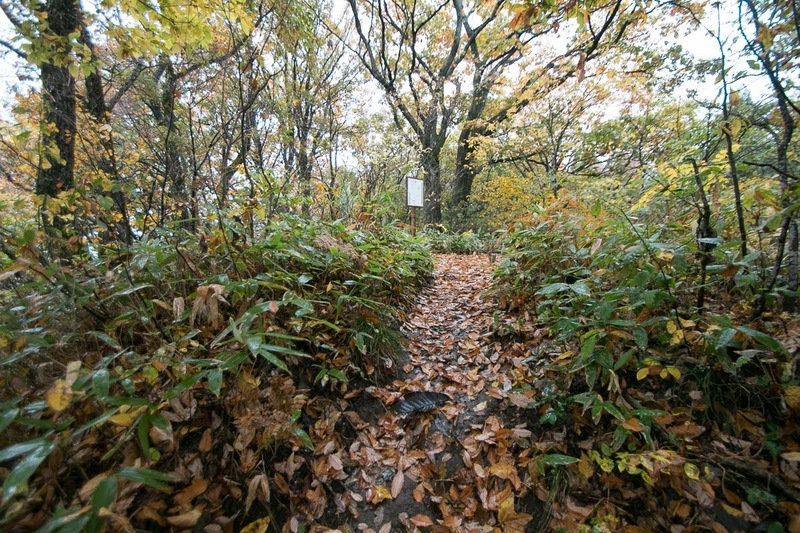 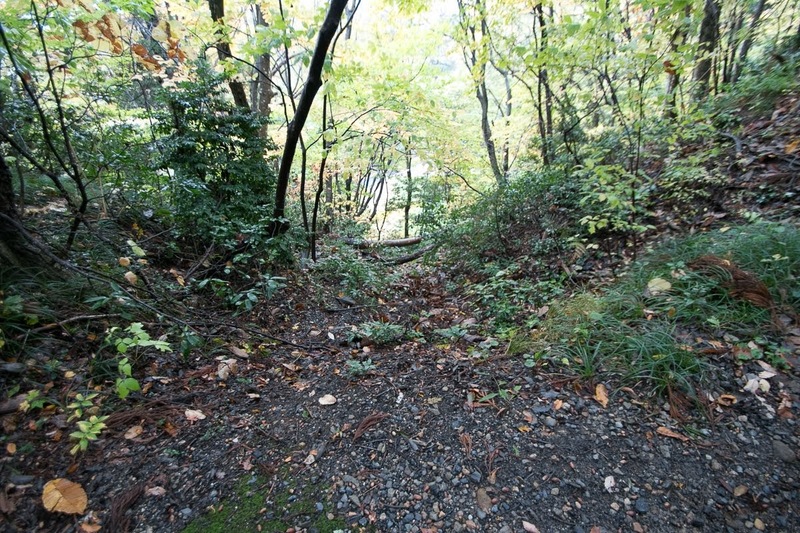 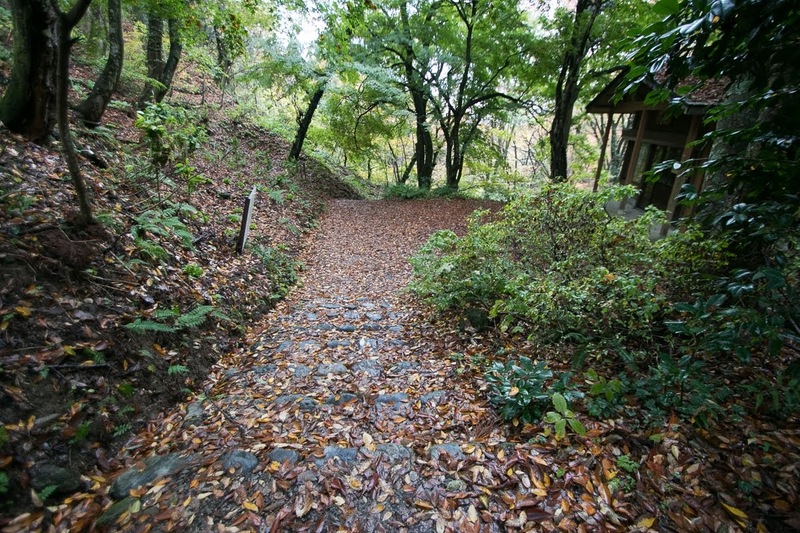 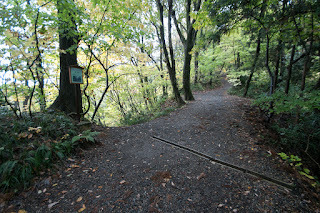 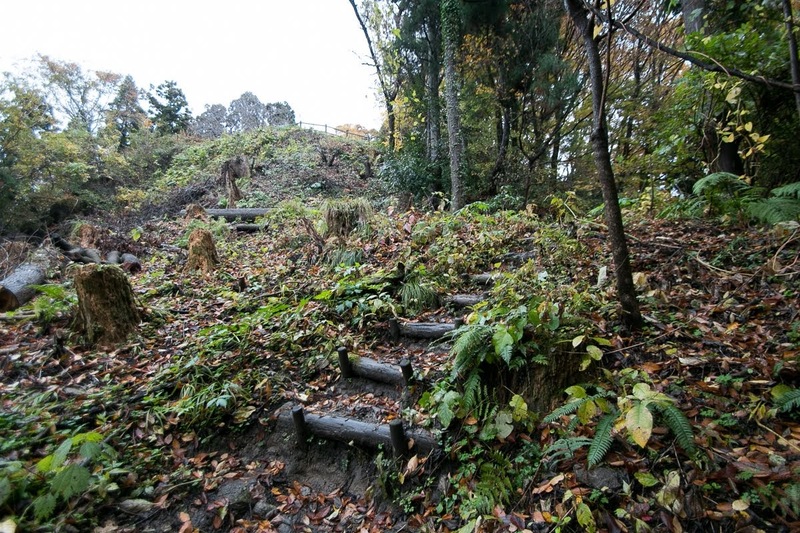 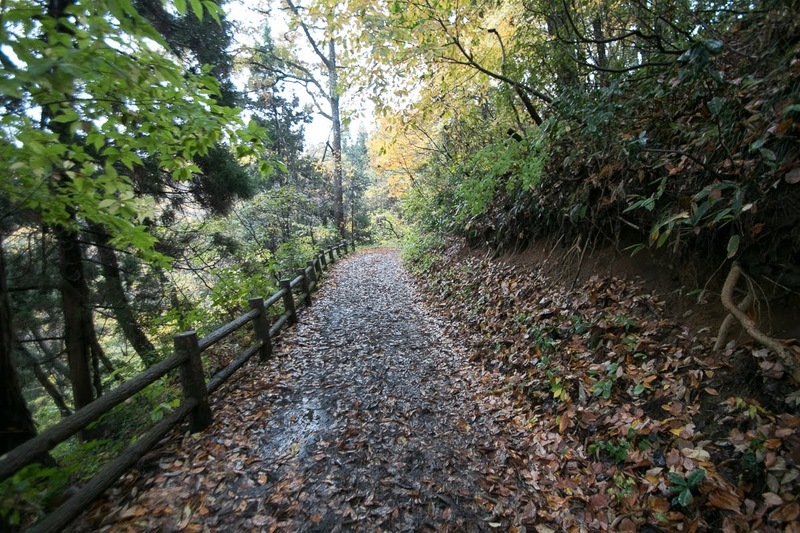 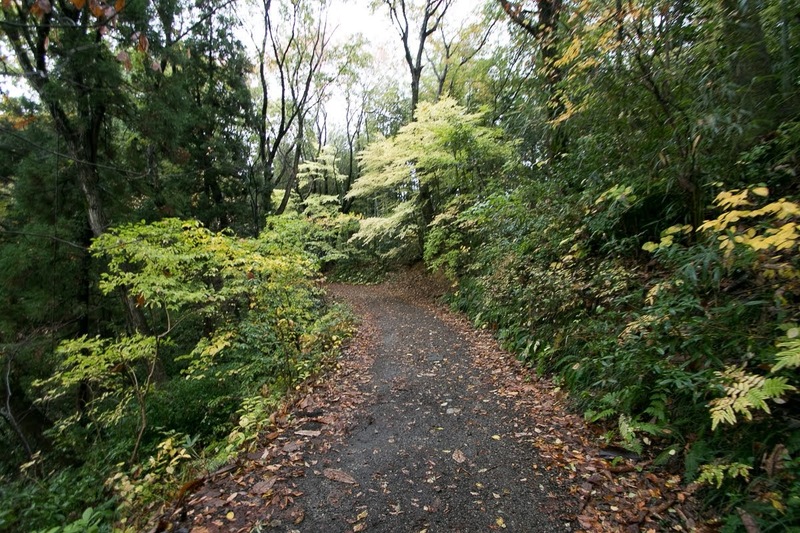 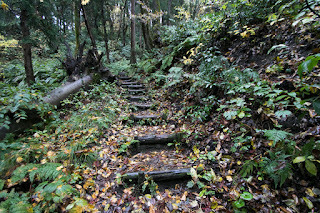 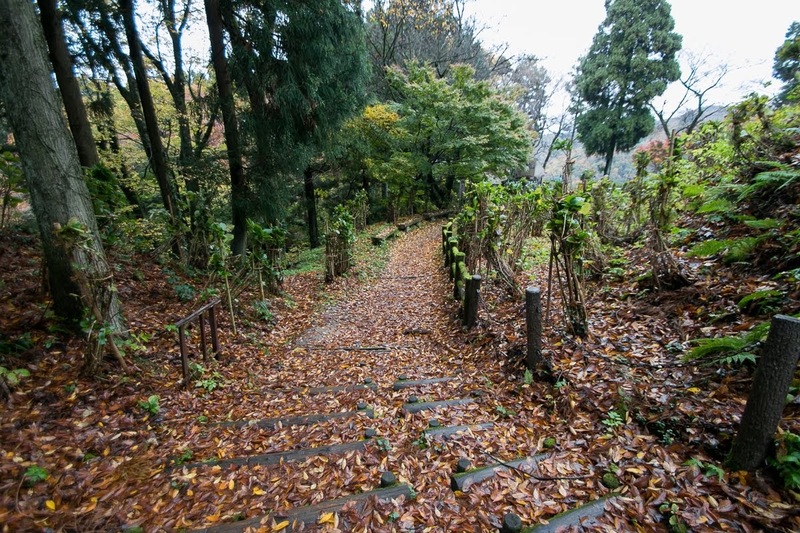 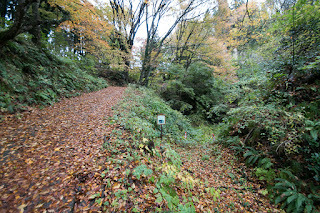 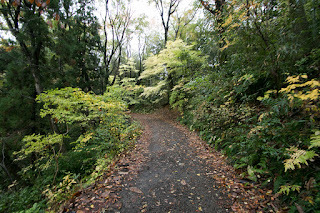 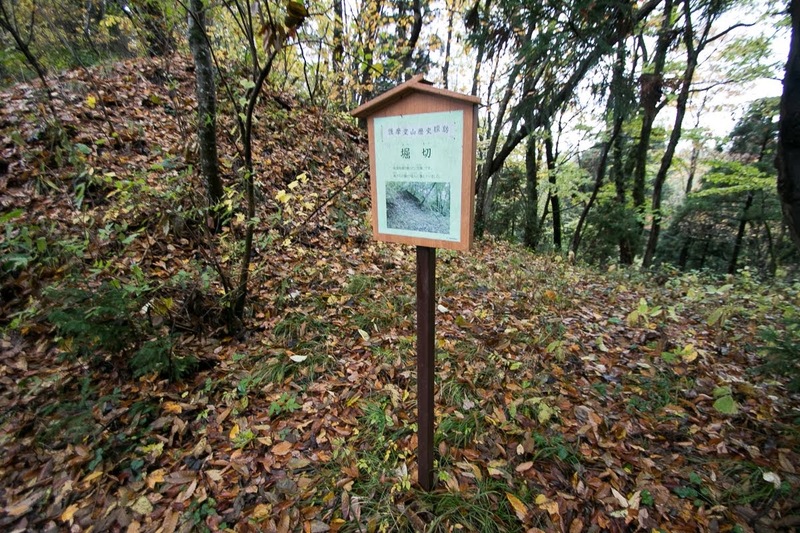 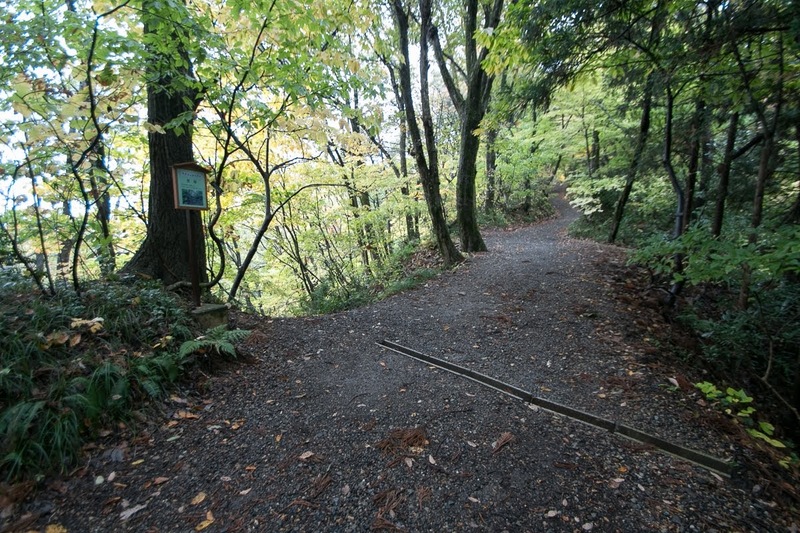 Several area of the castle is used as a hydrangea garden bloom in rainy reason, and gentle slope of central ridge is used as affordable walking space of local people along with hillside spa. 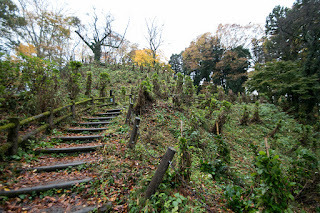 Different from neighbor castles consist of relatively large areas, Gomado castle is formed by small compartments which enabled long time resistance by small force against stronger army. 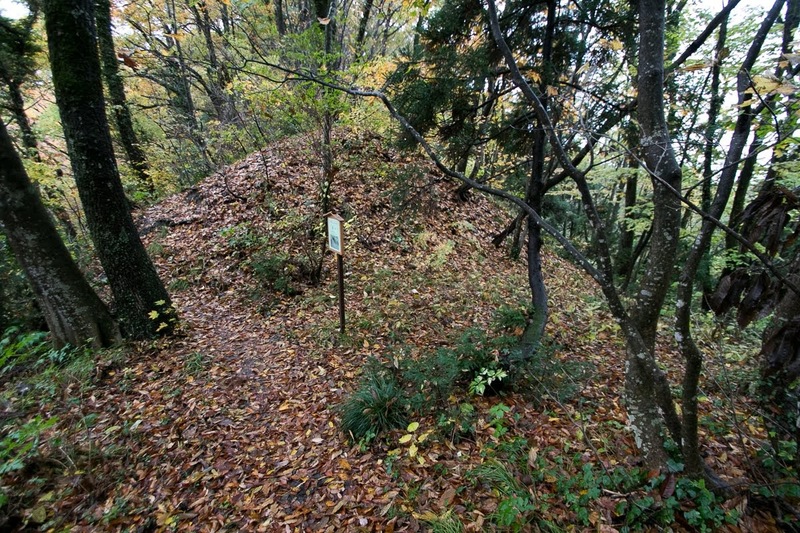 The shape of the castle shows the role of its commander, who kept distant tough border by small forces even though lost at final battle. 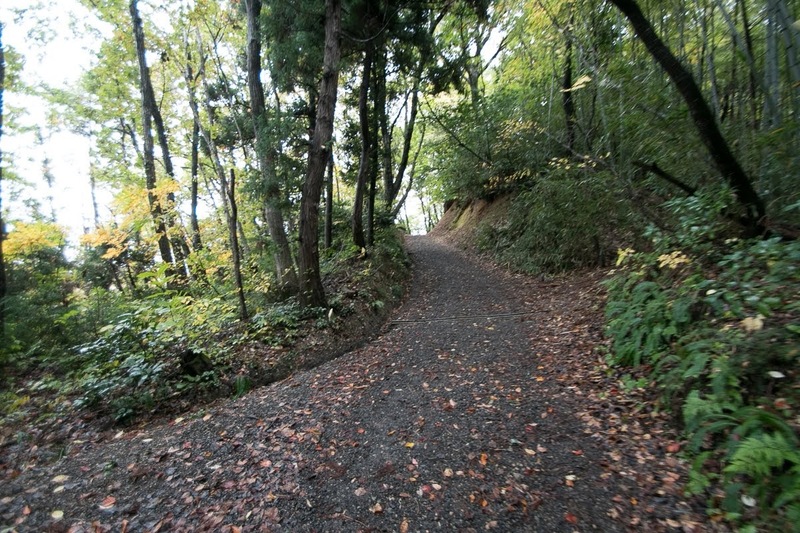 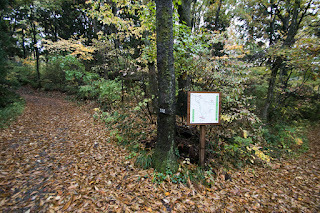 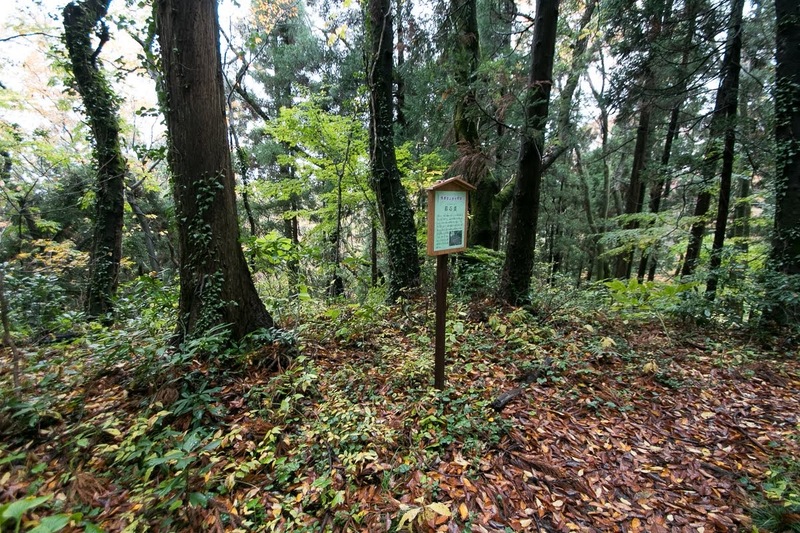 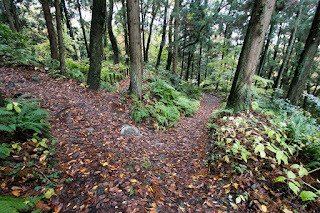 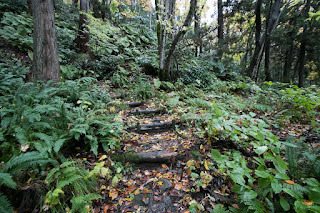 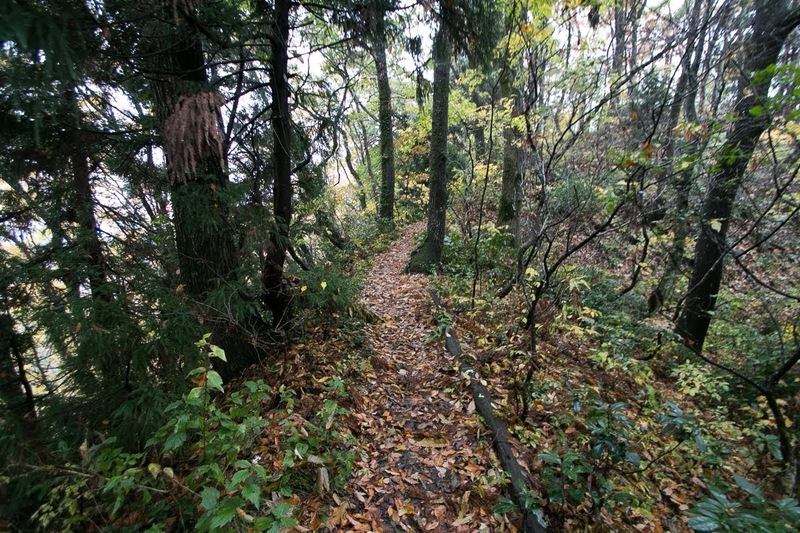 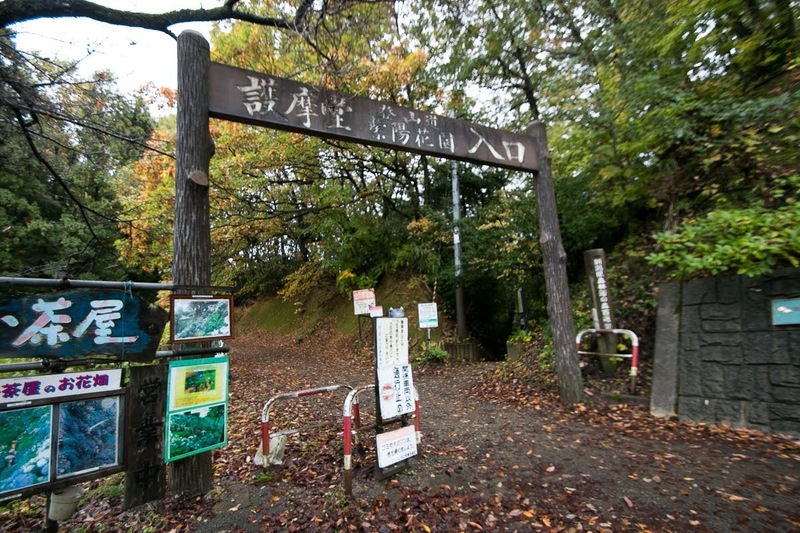 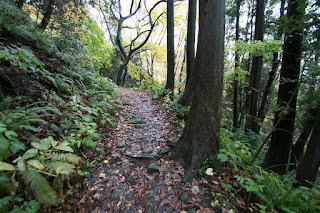 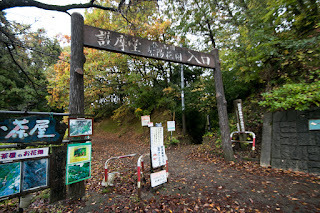 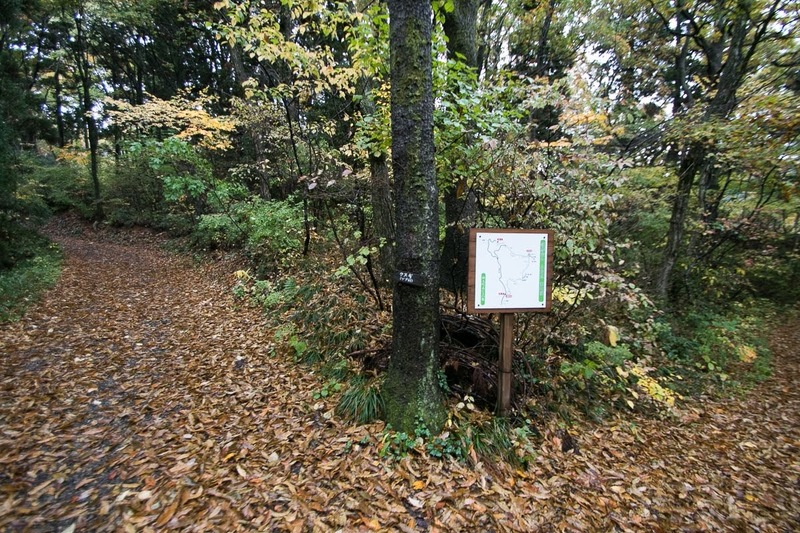 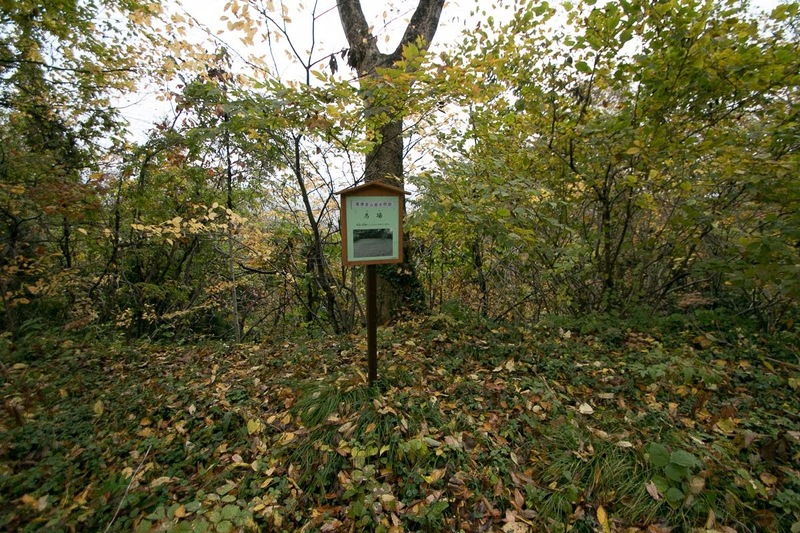 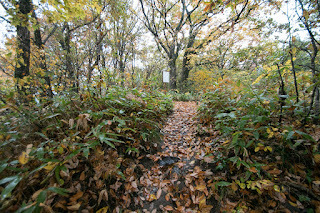 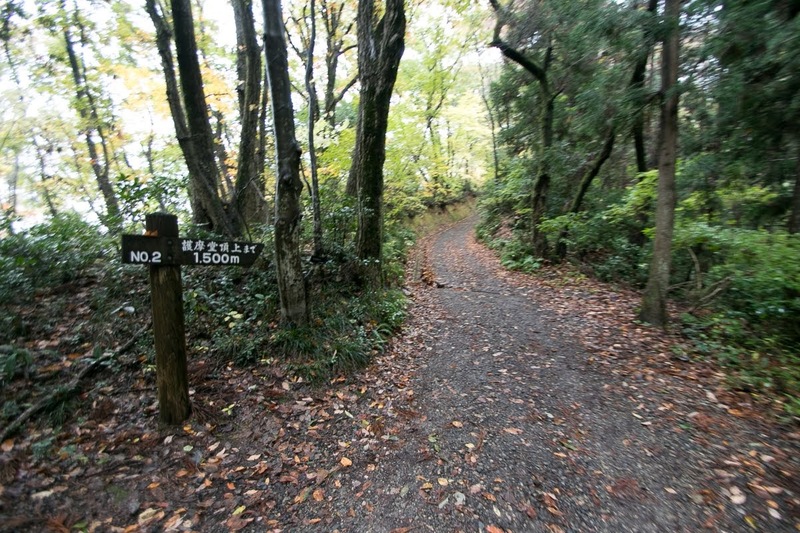 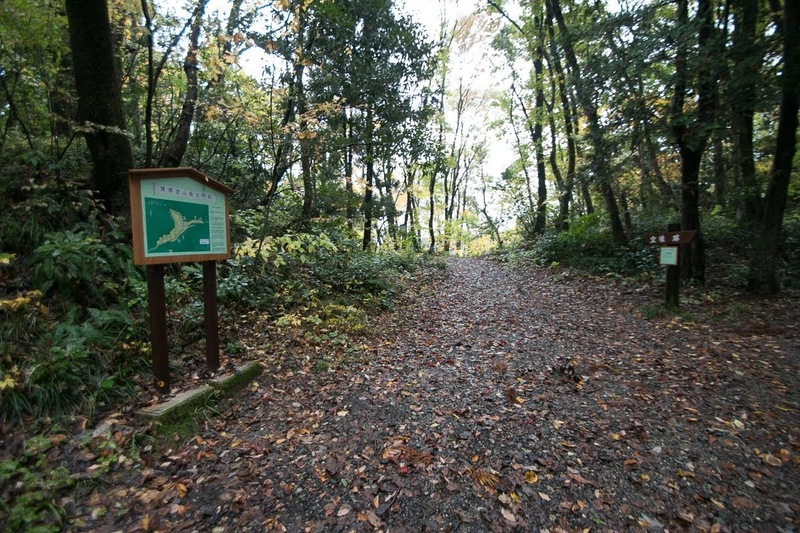 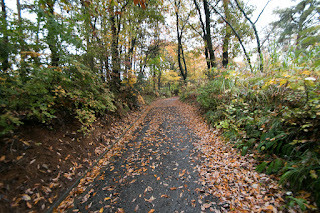 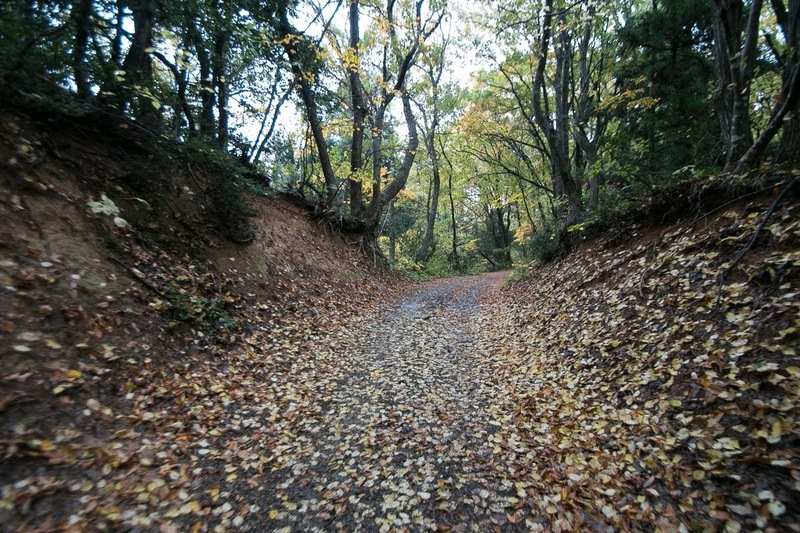 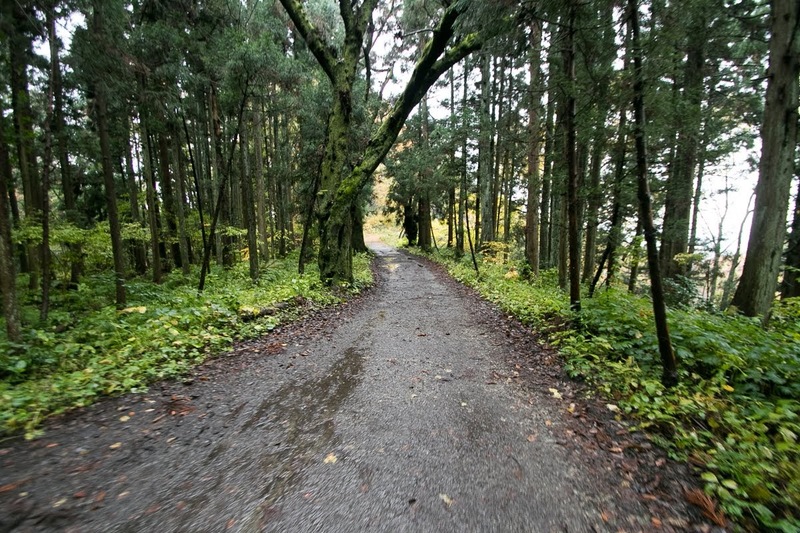 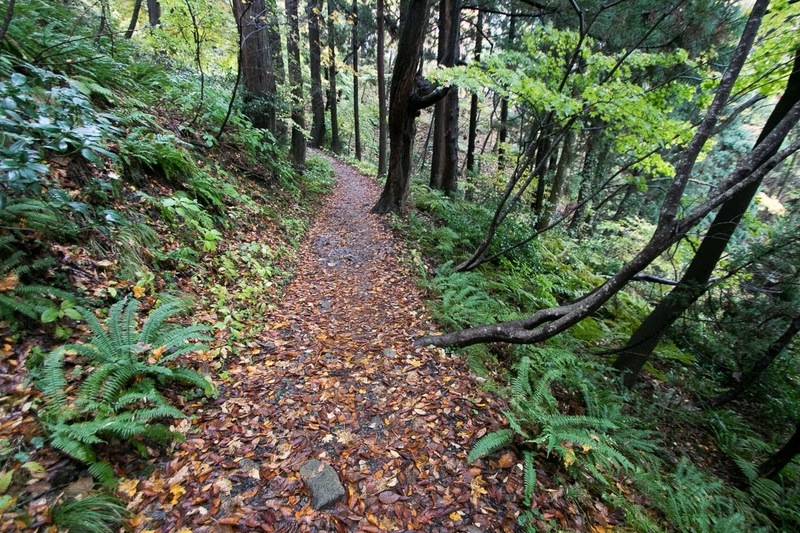 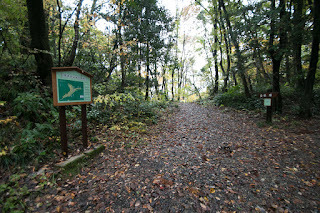 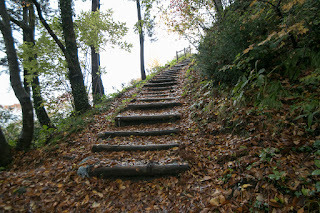 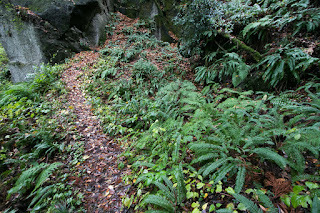 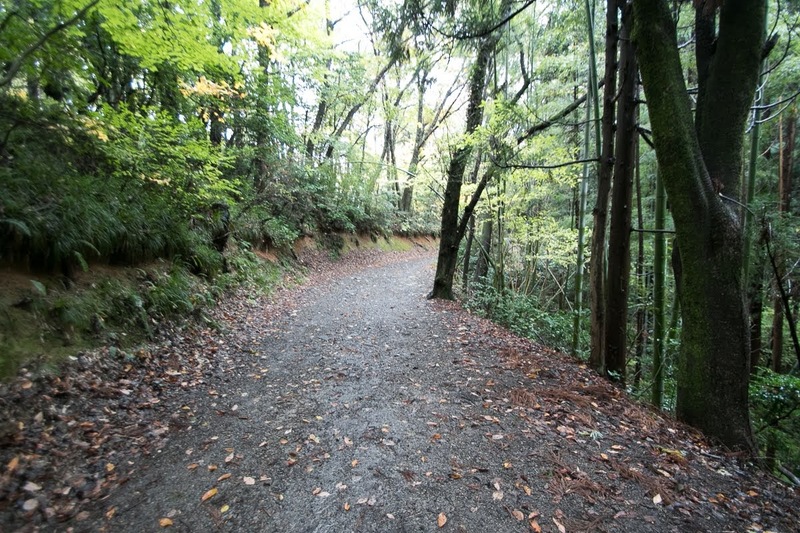 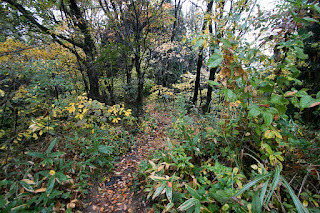 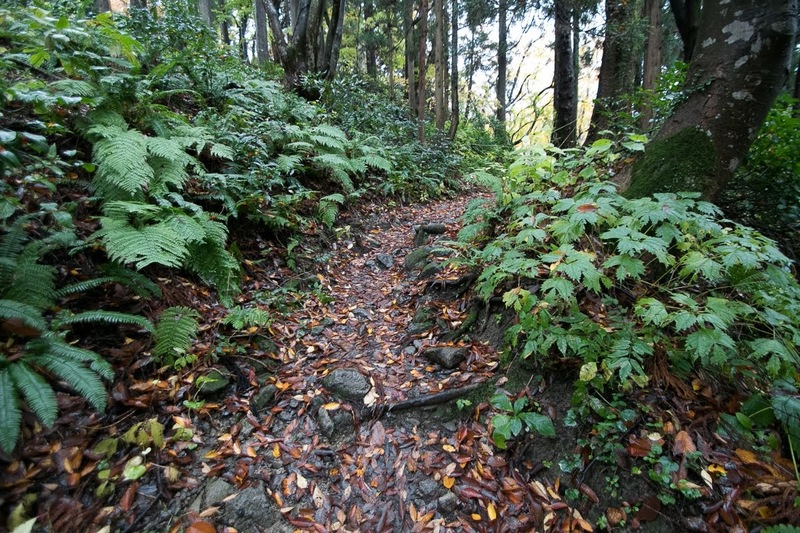 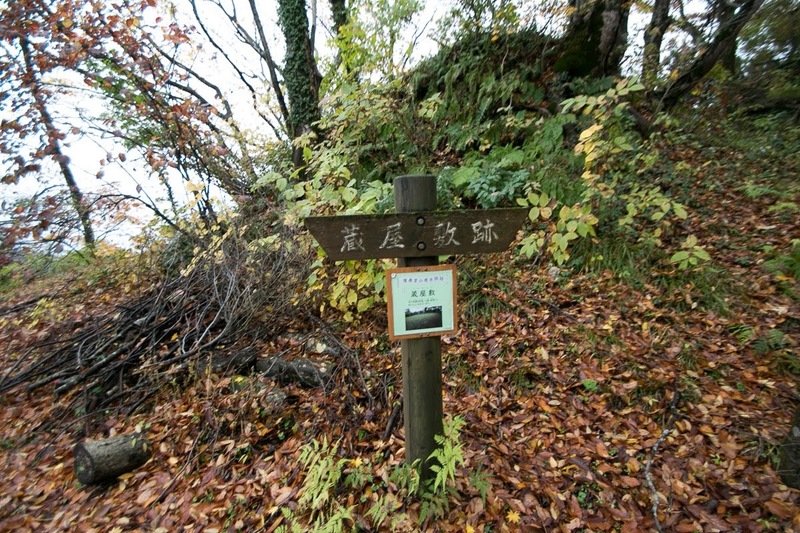 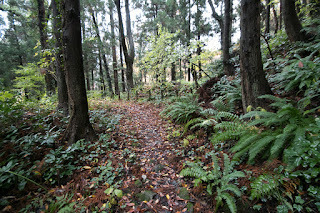 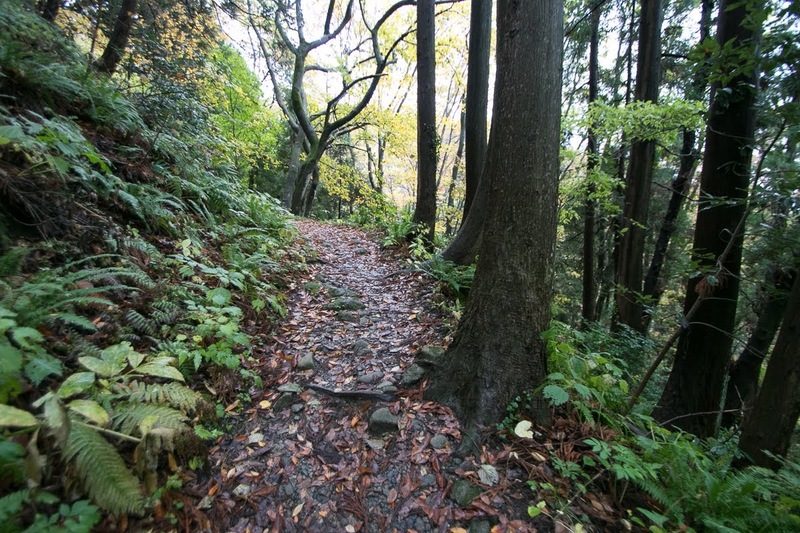 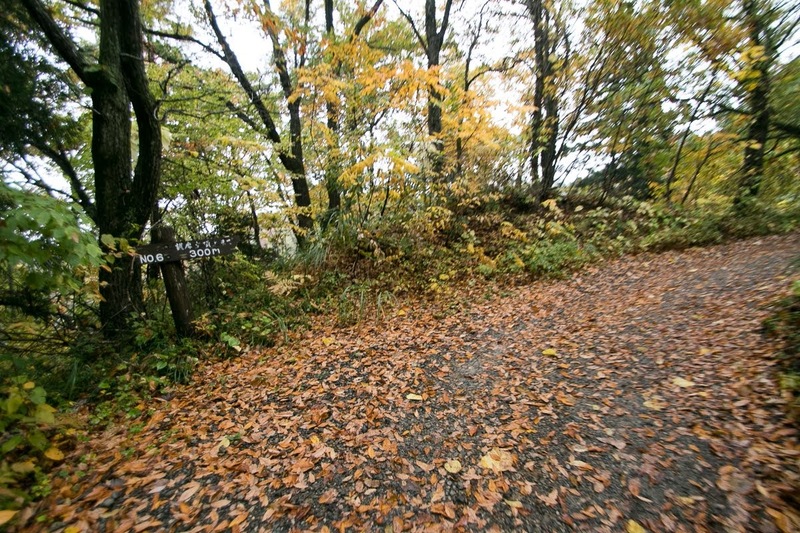 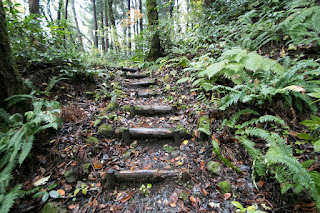 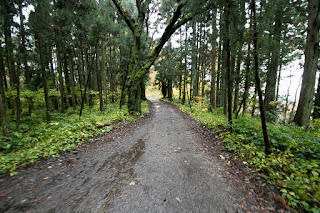 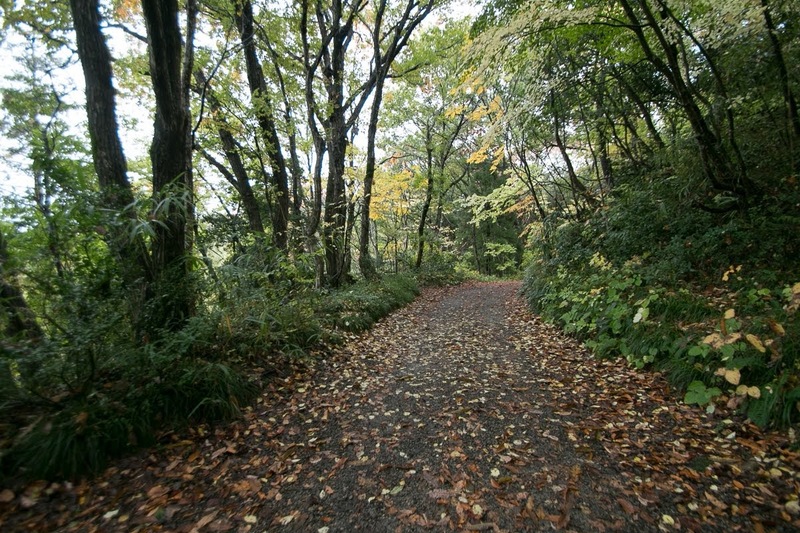 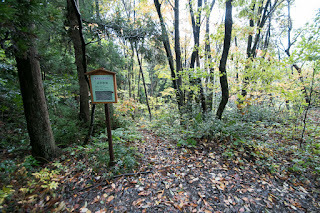 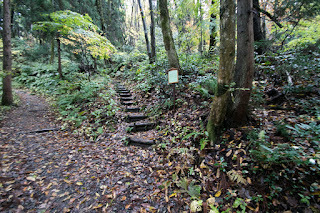 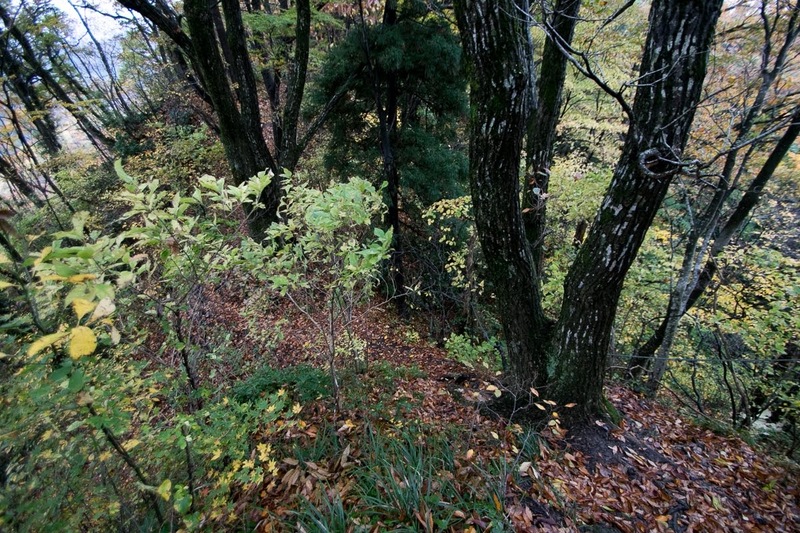 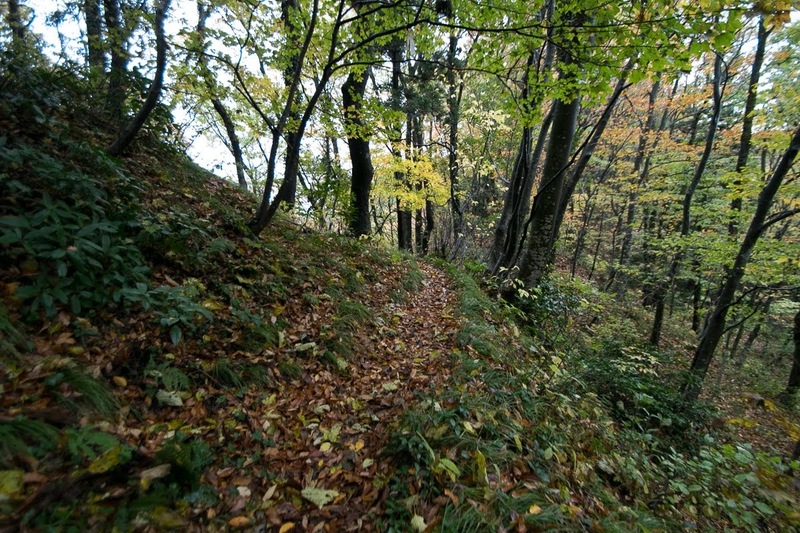 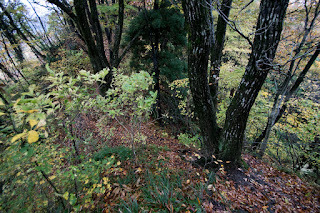 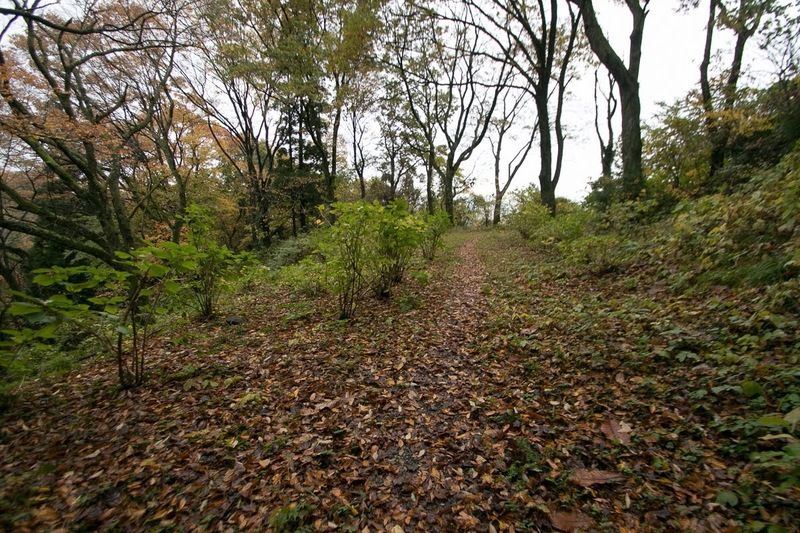 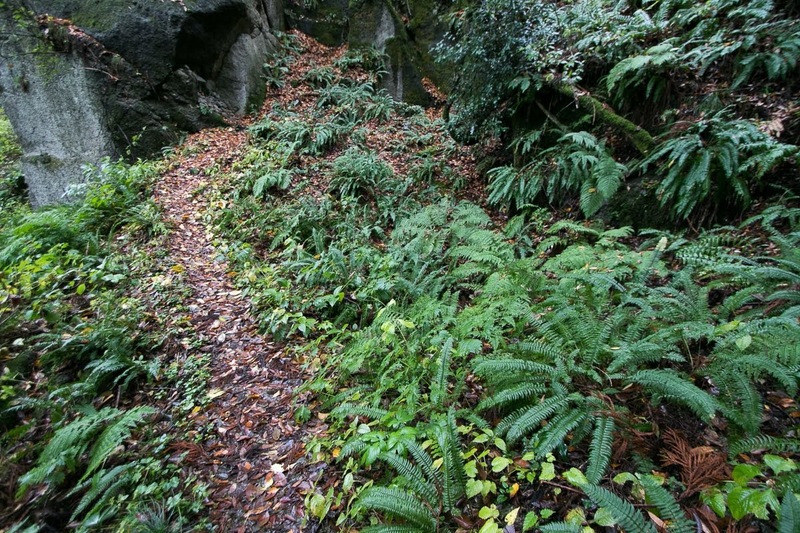 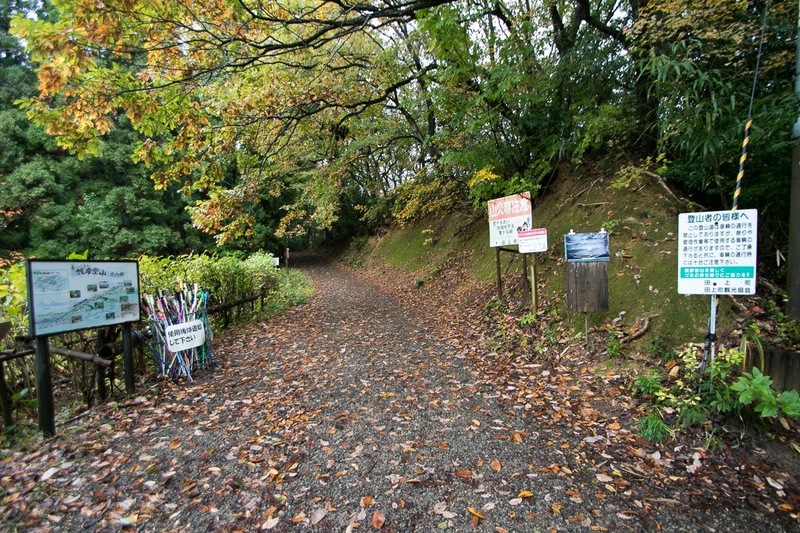 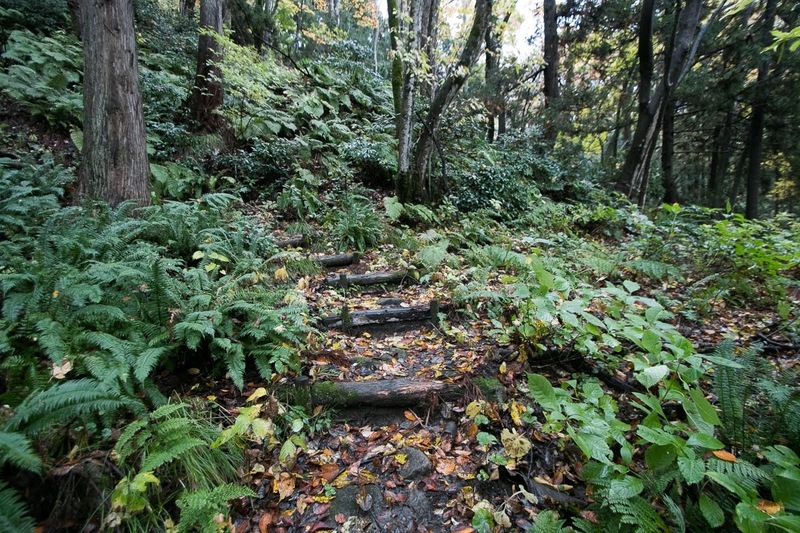 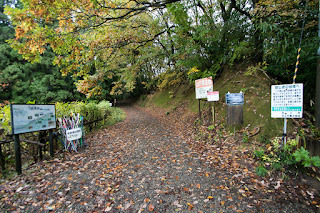 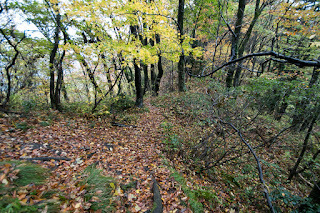 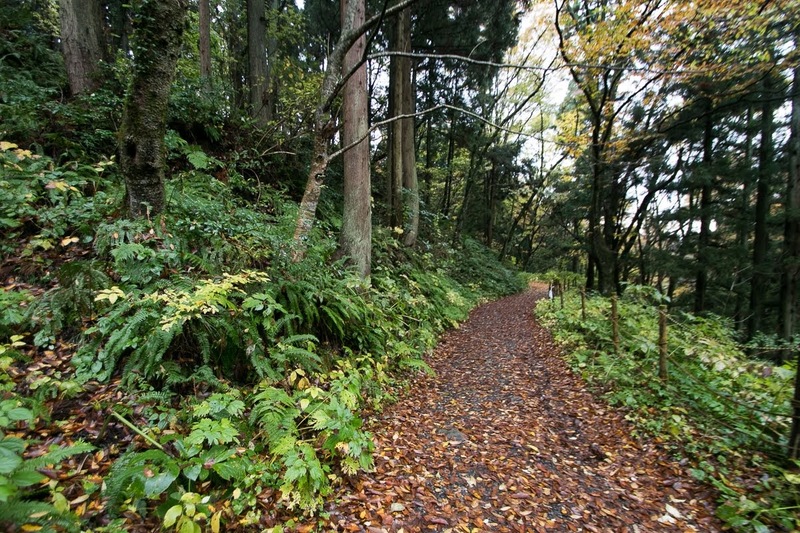 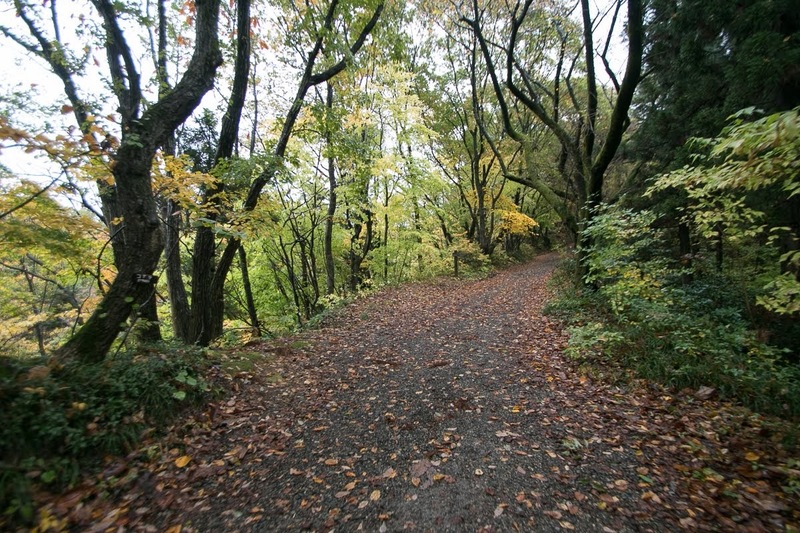 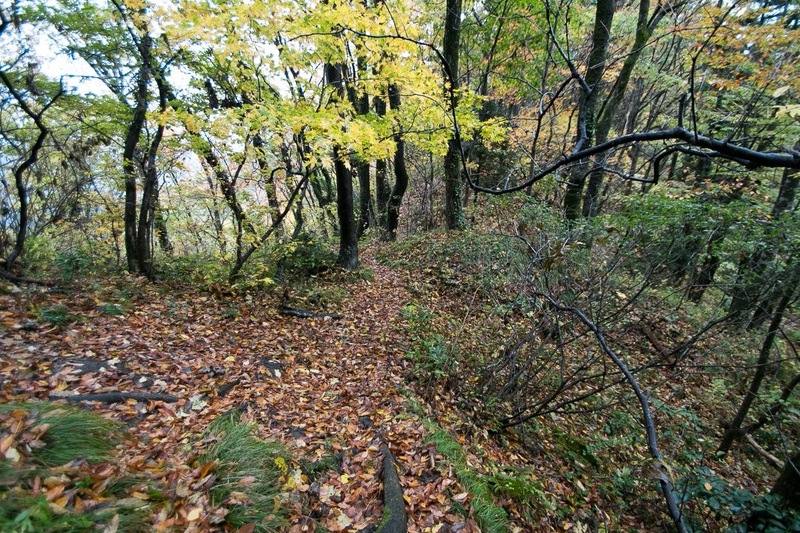 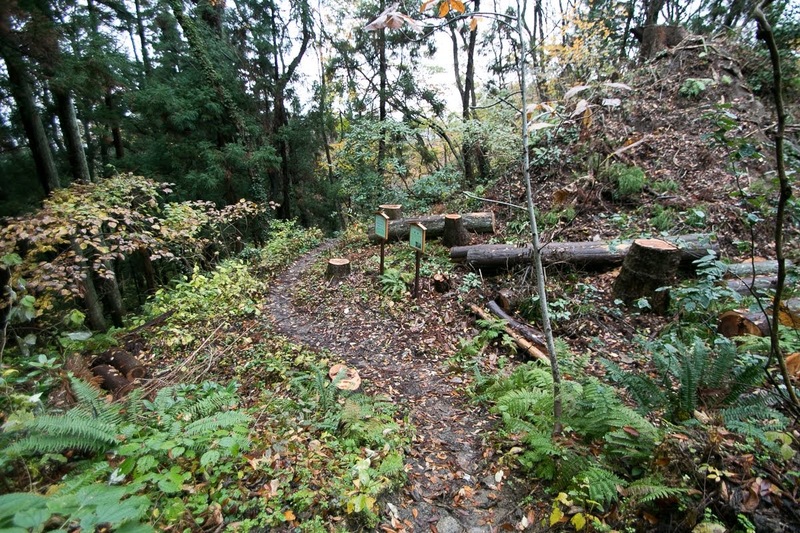 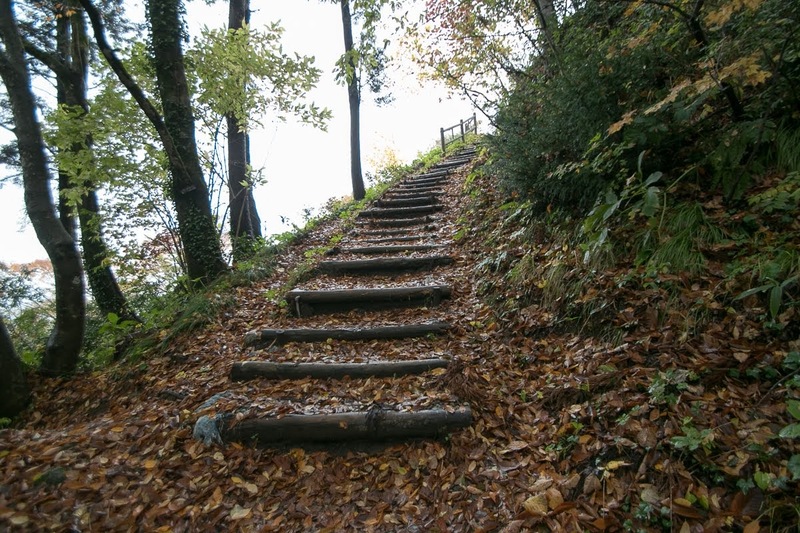 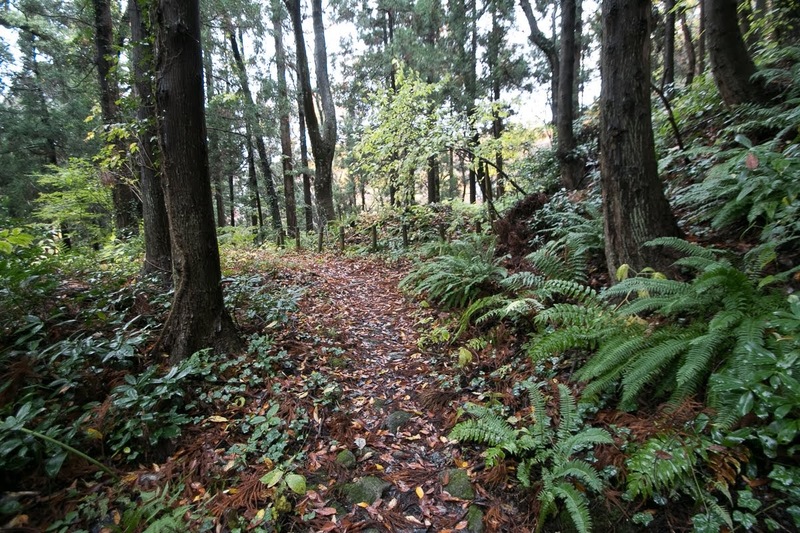 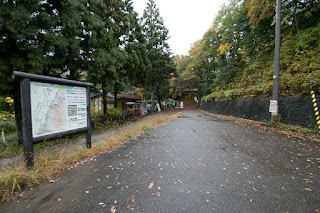 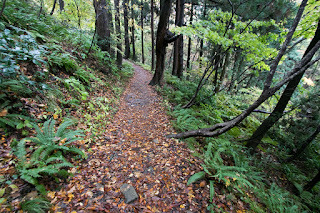 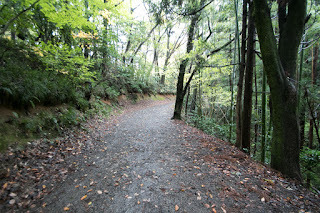 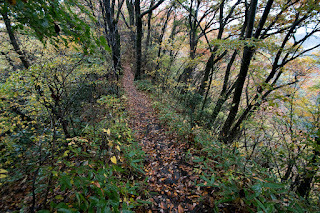 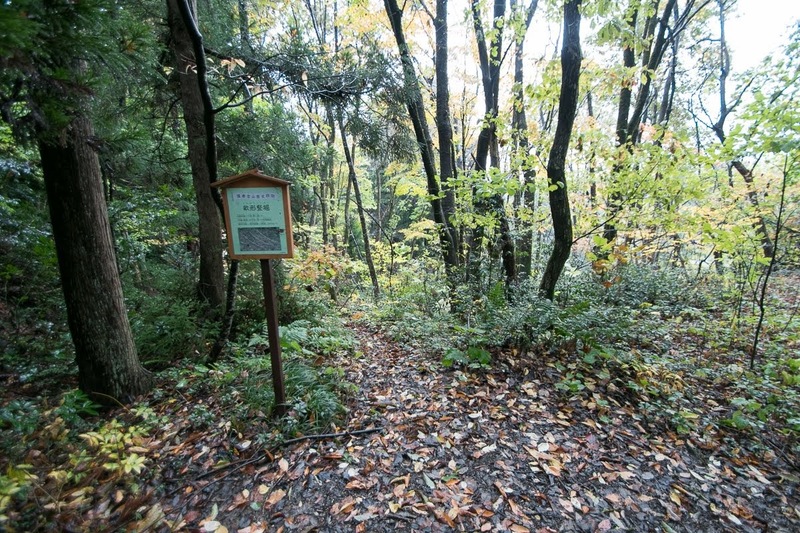 30 minutes walk from JR East Shinetsu-Honsen line Tagami station to the entrance of climbing road. 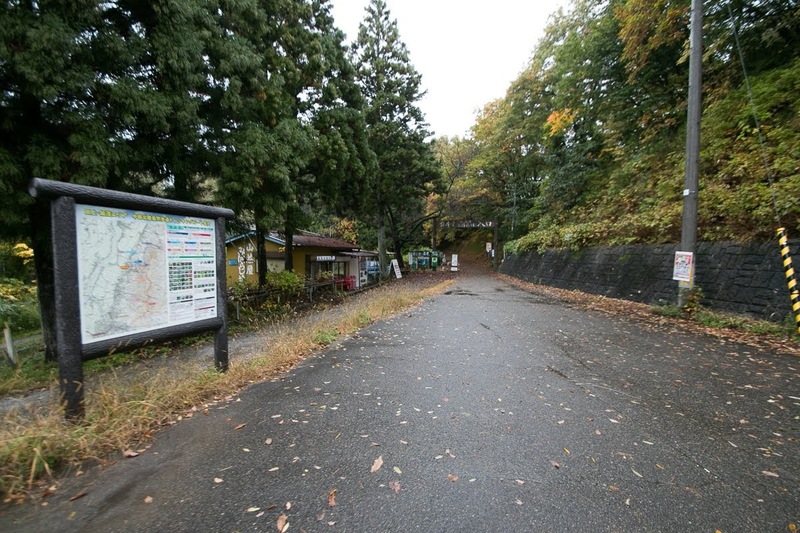 30 minutes drive from Hokuriku Jidoshado Expressway Makigata-Higashi interchange to hillside parking. 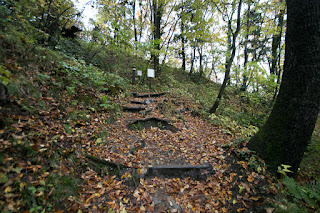 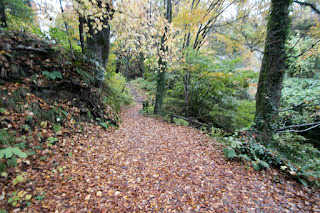 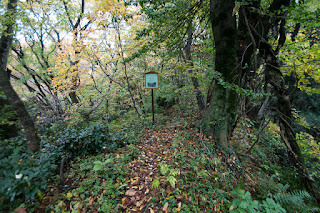 45 minutes walk from hillside to hilltop castle.